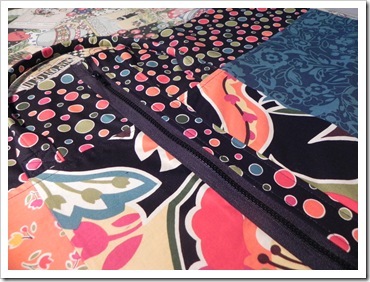 Have you noticed all the groovy 1970’s inspired fashions that are hitting the stores? 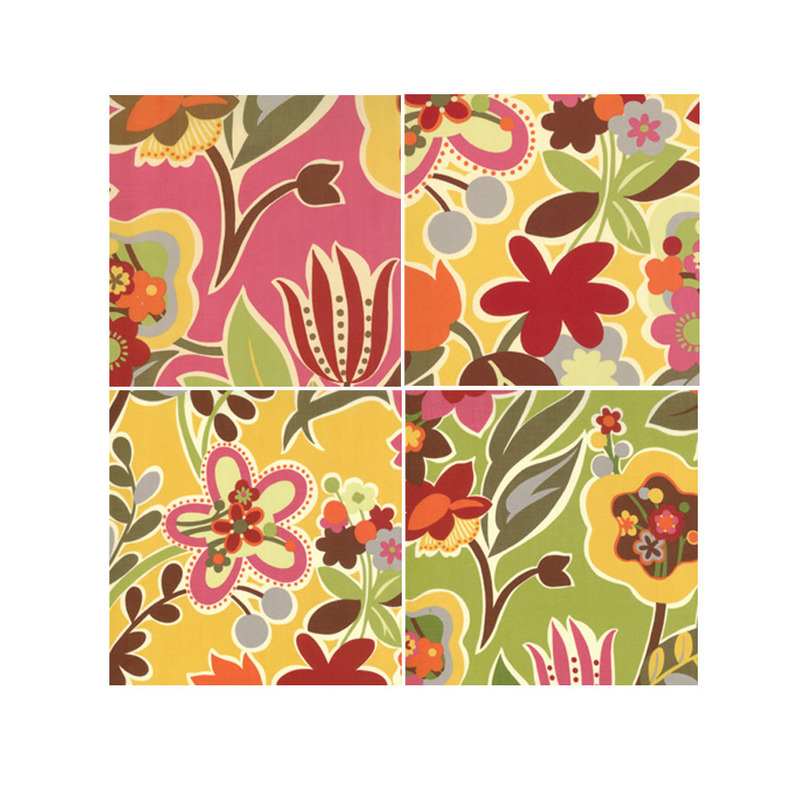 Bright and wild colors dominated the scene and what hippie didn’t own love beads during the ’70’s! 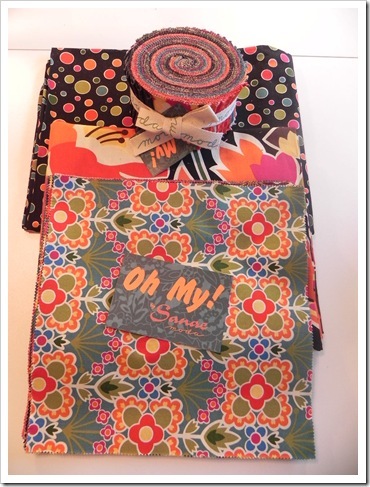 The “Oh, My!” line of fabrics by Sanae reminds me so much of the psychedelic fabrics of that day! 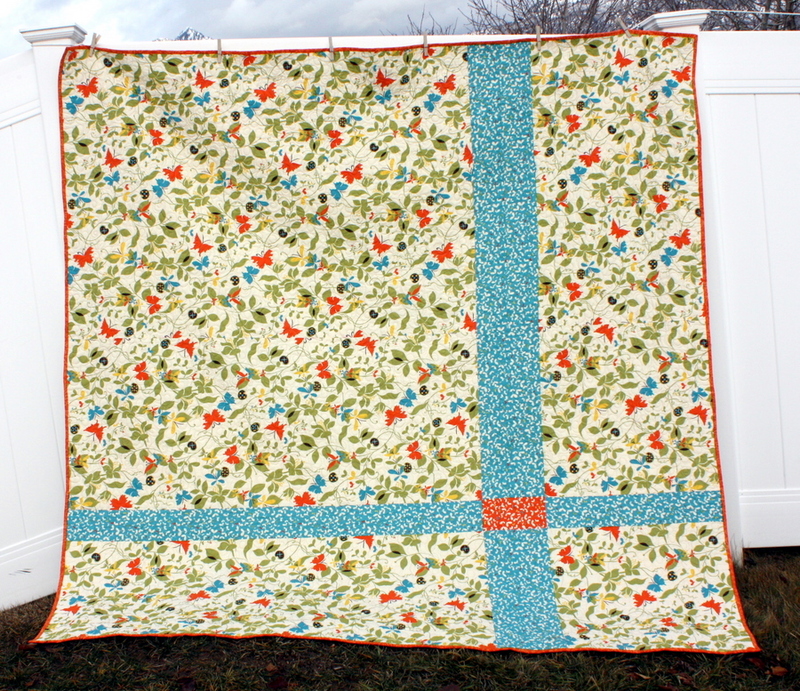 This lap-size quilt celebrates the era in a fun and creative way! 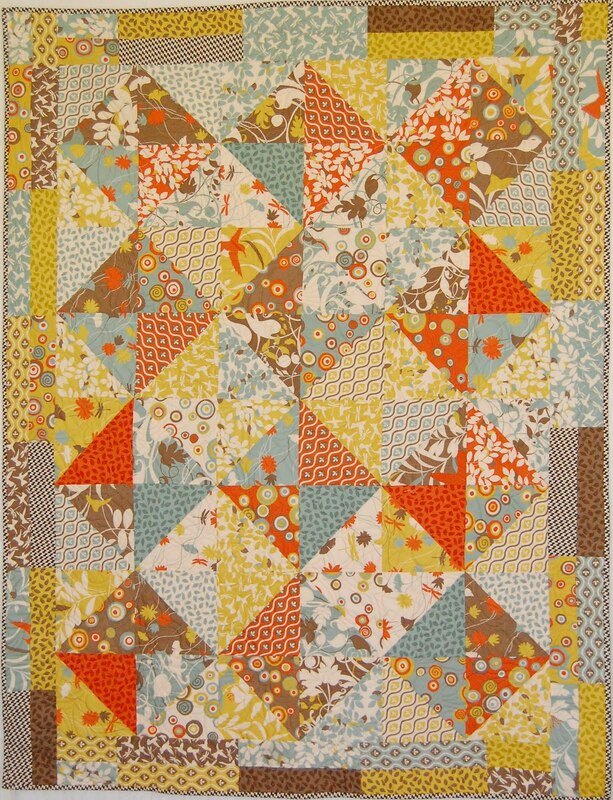 I’m Carla Timberlake from Lollyquiltz and this is my first Bake Shop pattern. I hope that you enjoy it! 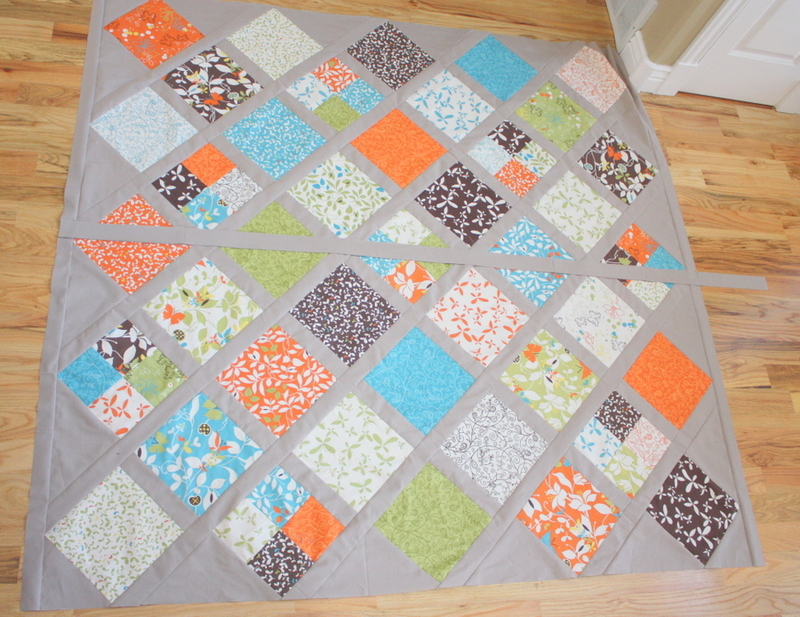 Makes one quilt: Approx. 54.5 in. x 63. 5 in. 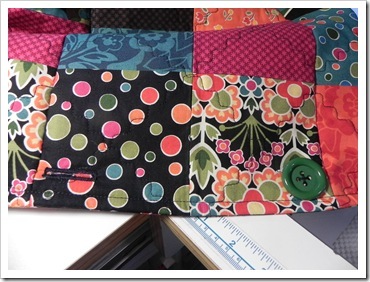 Begin by cutting each of the 84 charm squares into two pieces with your rotary cutter and ruler. Cut off a 1.5 in. X 5 in. piece from one side of each square. 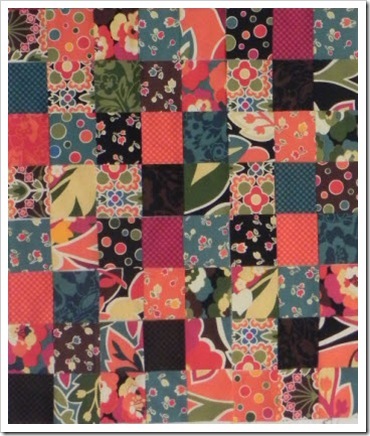 This will leave a section 3.5 in. x 5 in. 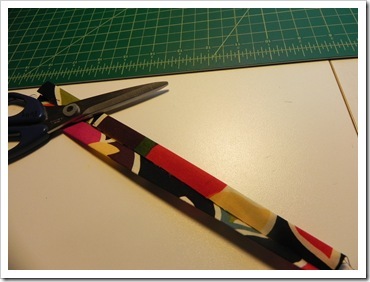 CUT: 3 strips LOF (Length of Fabric) 1.5 in. X 59 in. 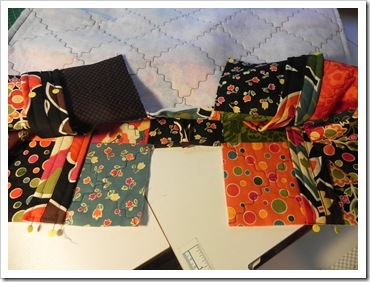 7 strips LOF 3 in. X 59 in. 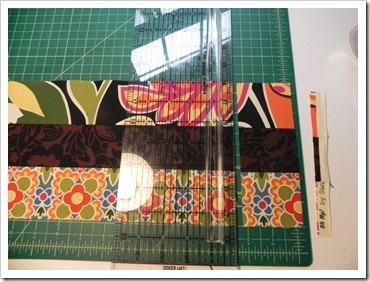 SUBCUT: Using 12 WOF strips 1.5 in. 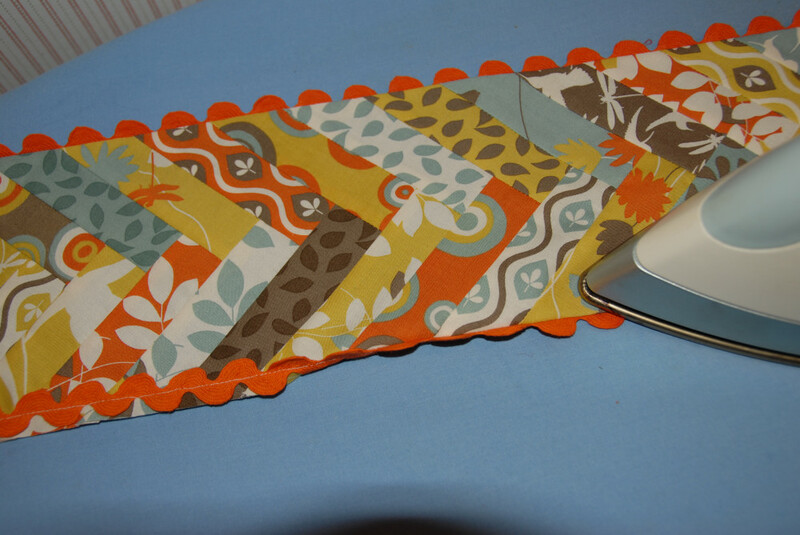 wide from above , subcut into 320 squares 1.5 in. X 1.5 in. 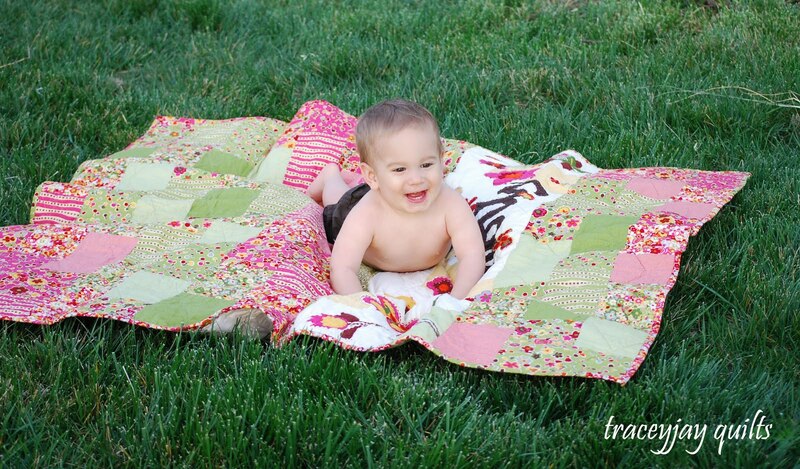 The Love Bead Quilt is made with two simple blocks, the bead block and the chain block. Place a 1.5 in. 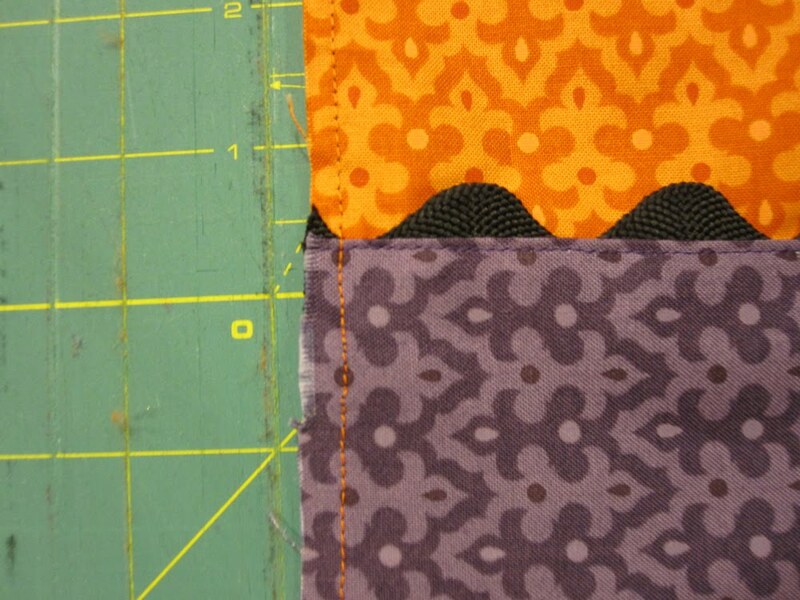 background square in each corner of the 3.5 in. x 5 in. Oh, My! rectangle. 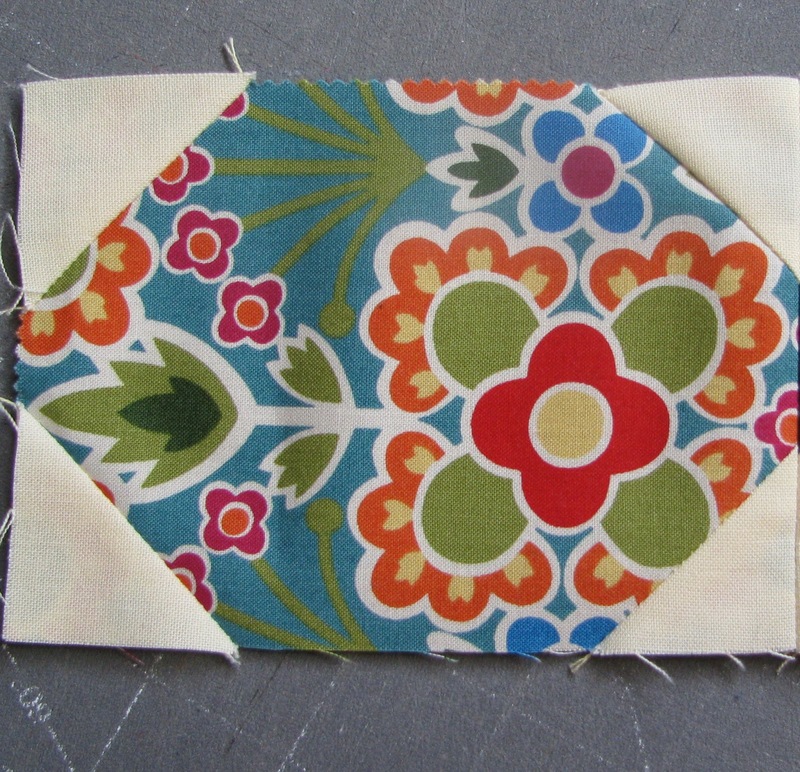 Sew across the background squares on the diagonal. *Hint: Crease the square on the diagonal or draw a line for better accuracy when stitching, if desired. 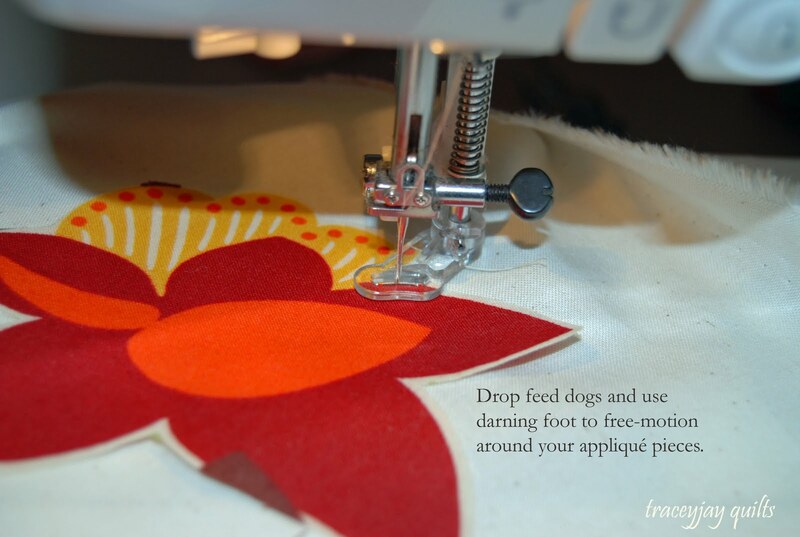 Using chain sewing will make this step go faster! 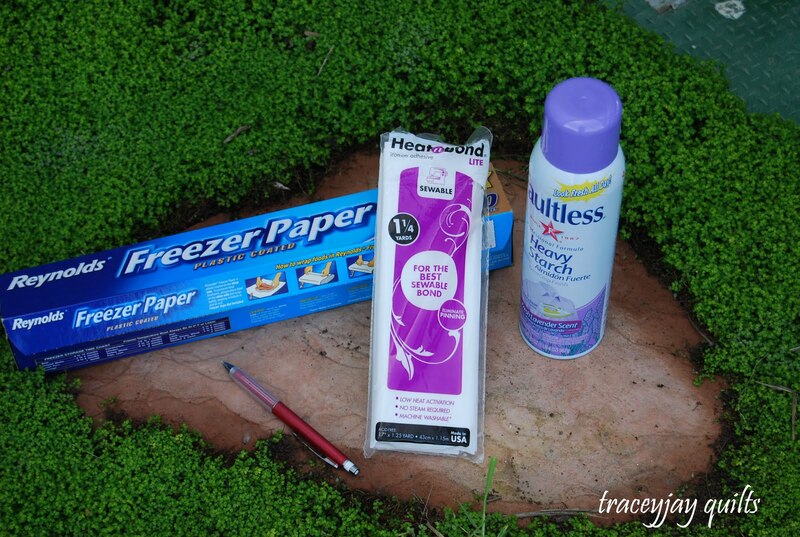 You will end up with at big stack that looks like this! 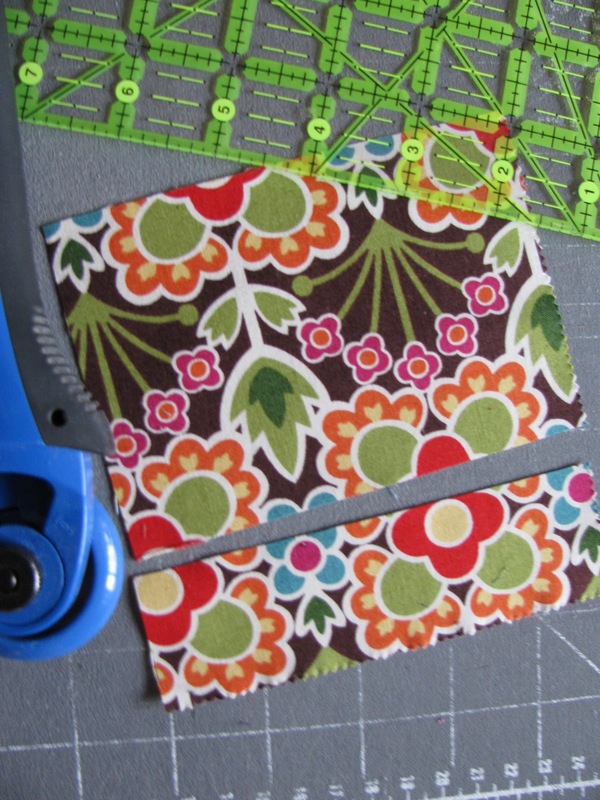 Next, using scissors or your rotary cutter, trim off the corners, leaving a 1/4 inch seam. 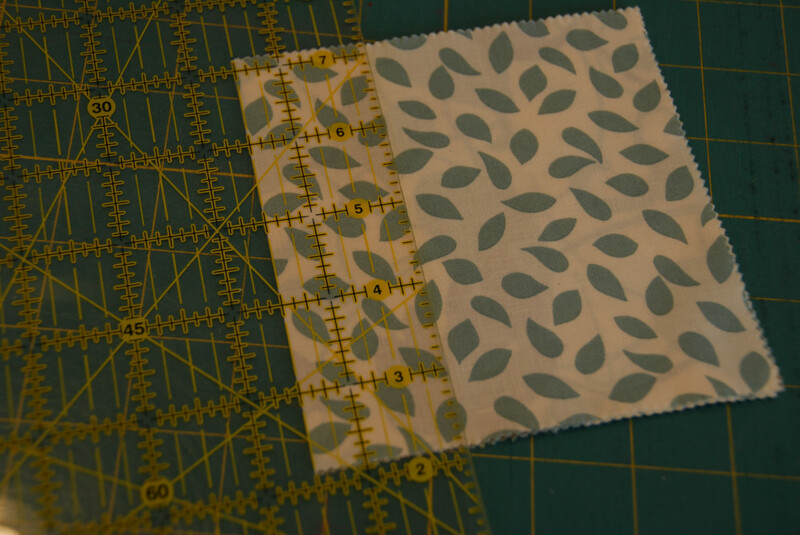 *Hint: If your stitching line is not quite on the diagonal line, you can trim out just the background corner from the middle, leaving the print corner to keep the block square. 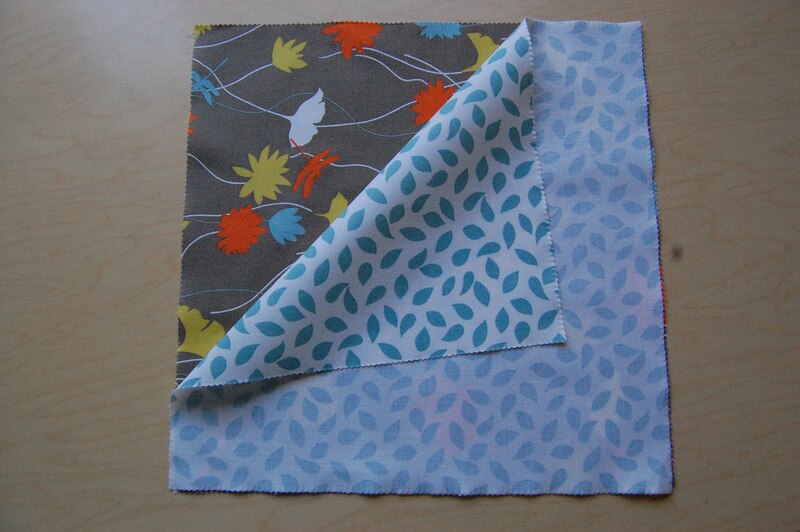 Your seam will be a bit more bulky if you choose this. 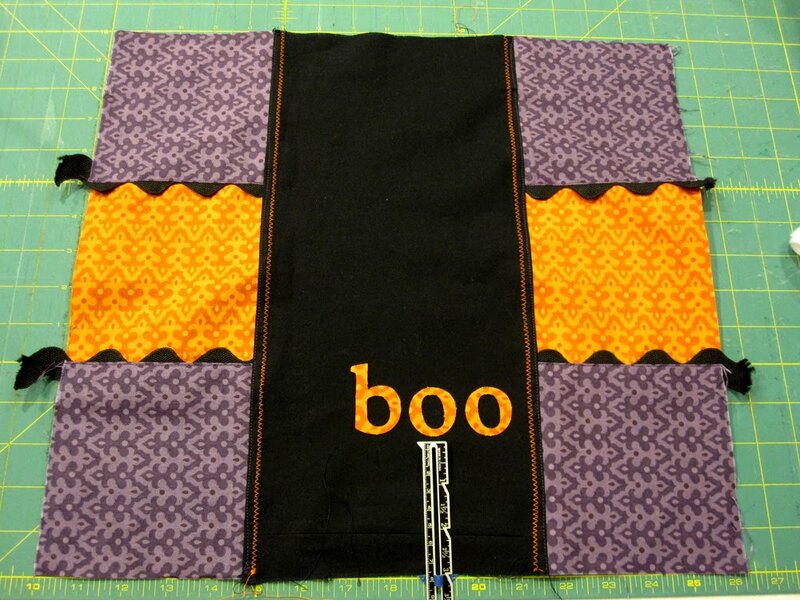 Press the background corners up toward the outside on each bead block. Choose 42 of the 1.5 in. x 5 in. 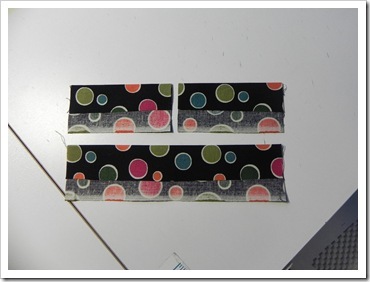 strips that you cut from the charm squares. Lay them, right sides together (RST) along 6 of the 1.5 in. 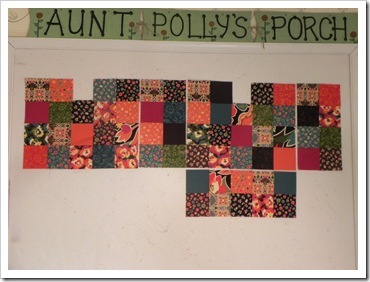 WOF background strips. 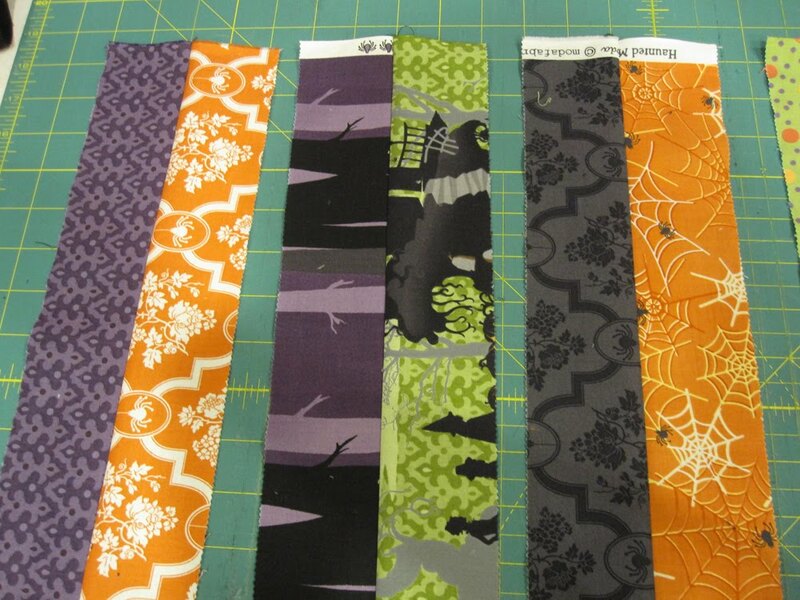 You can get 8 charm strips on each background strip. 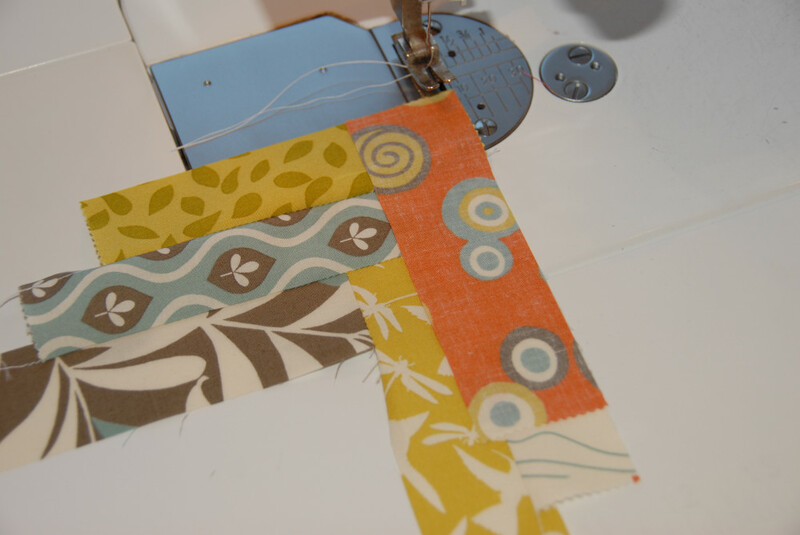 Sew the charm strips along the background strips with a 1/4 in. seam. *Hint: Test to be sure that you are making an accurate 1/4 in. 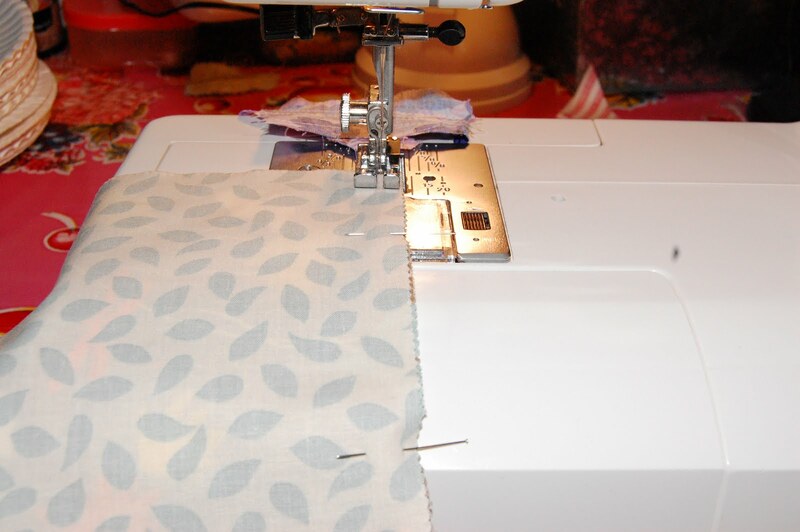 seam before beginning. 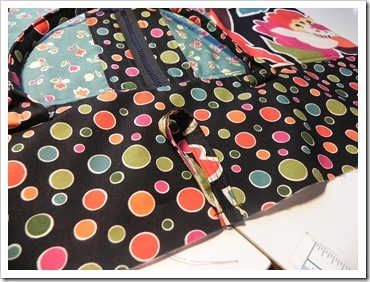 Press the seams toward the charm strips. 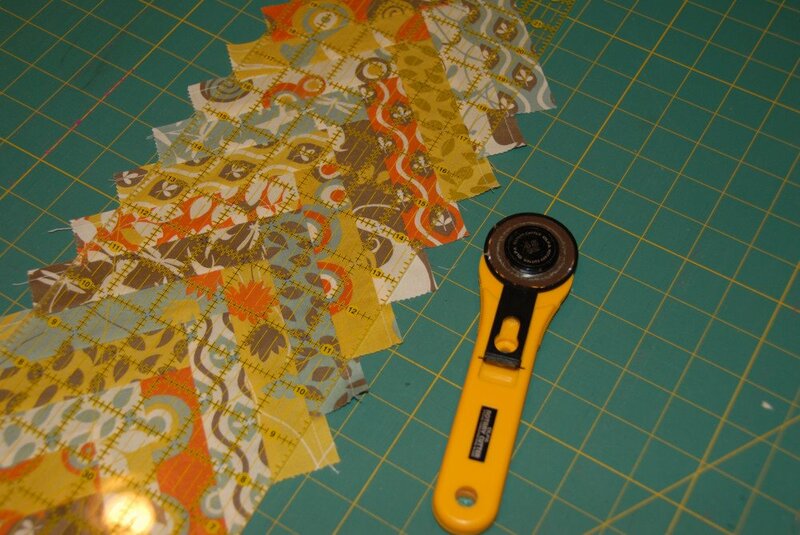 Use your rotary cutter and ruler to cut across the background strip even with the charm strips to 5 inches. 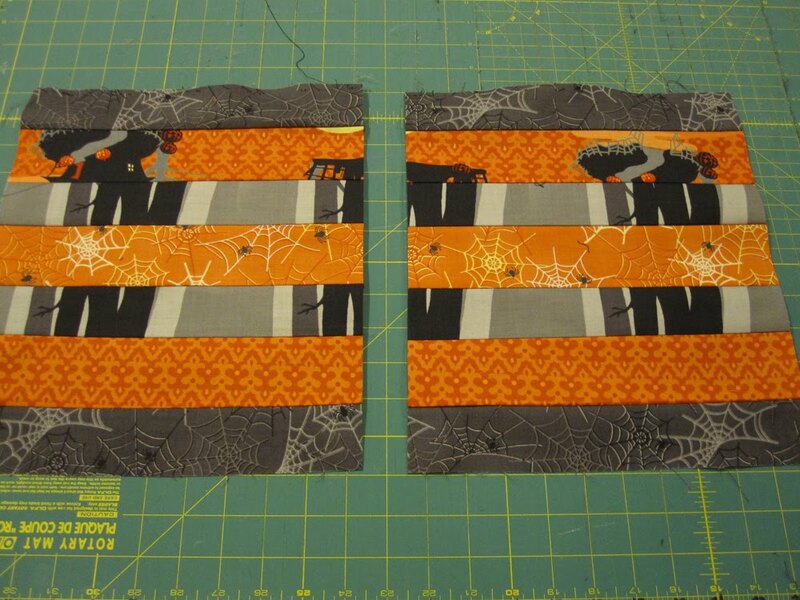 Now, repeat the steps above to attach the charm strips along the remaining 1.5 inch WOF background strips. 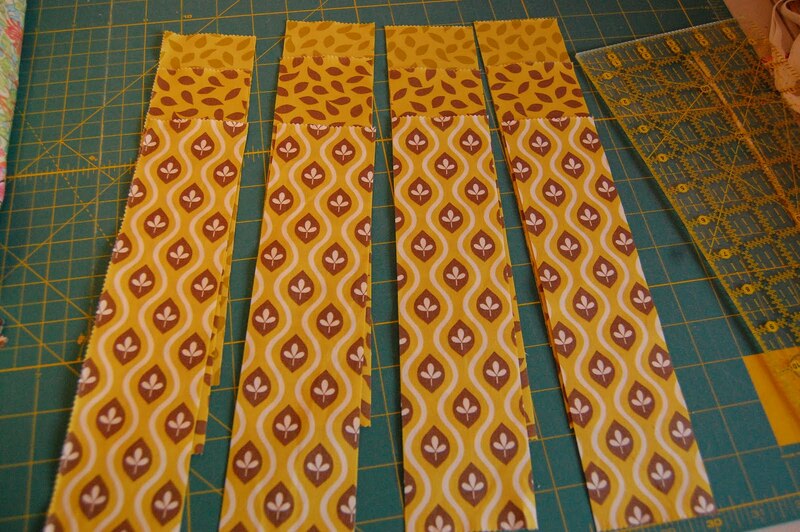 Again, cut apart the 5 inch sections from the long background strips. They should measure 3.5 in. across. Cut 34 chain pieces in half to make (68) 3.5 x 2.5 sections. 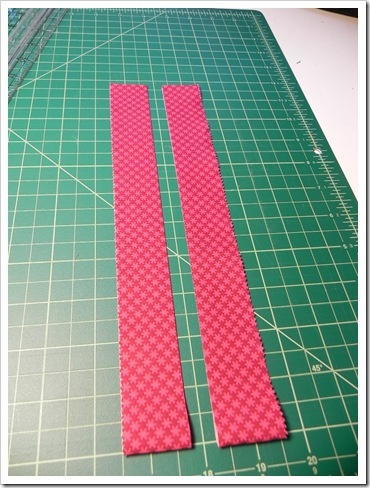 Cut the remaining 8 chain sections to 3.75 in. in length. Lay aside. Now for the really fun part! 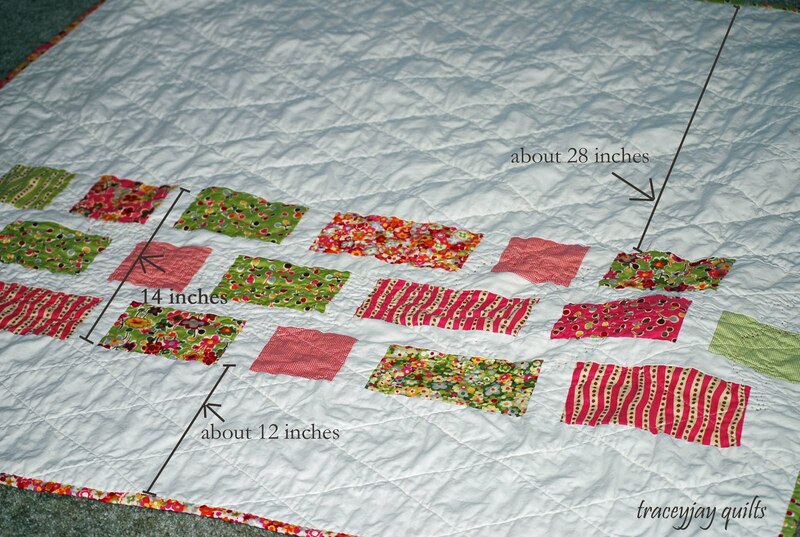 This type of quilt is called a strip quilt because the blocks are set together, end to end, creating strips. 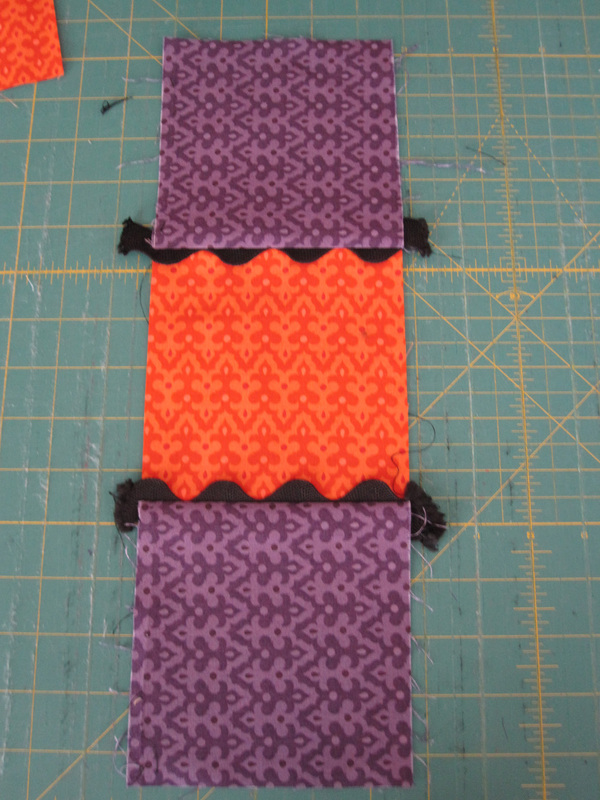 Then background strips, or sashings, are sewn in-between the block strips. 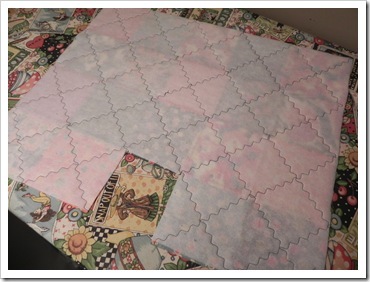 Begin laying out the bead/chain blocks to create 9 long rows. 1. 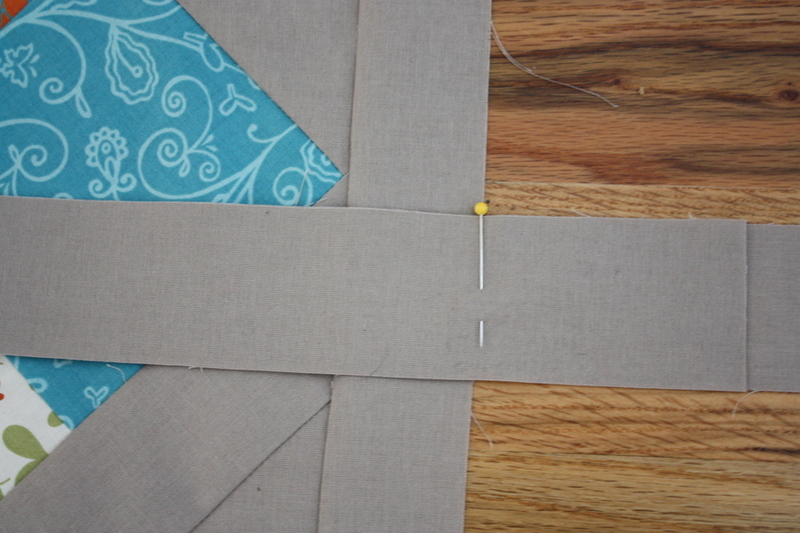 Use 8 blocks to create 5 rows, beginning with a bead at the top. 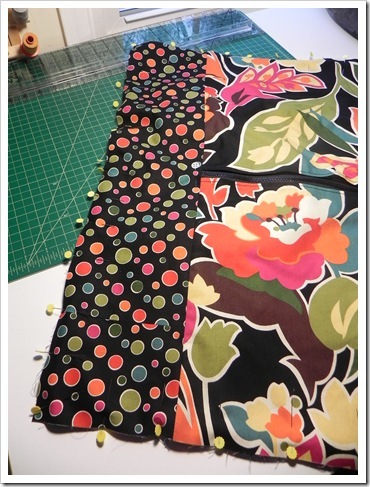 At the end of these rows, add a single bead from one of the ones you laid aside above. Now you will have 5 chains of 9 beads, beginning and ending with a bead. 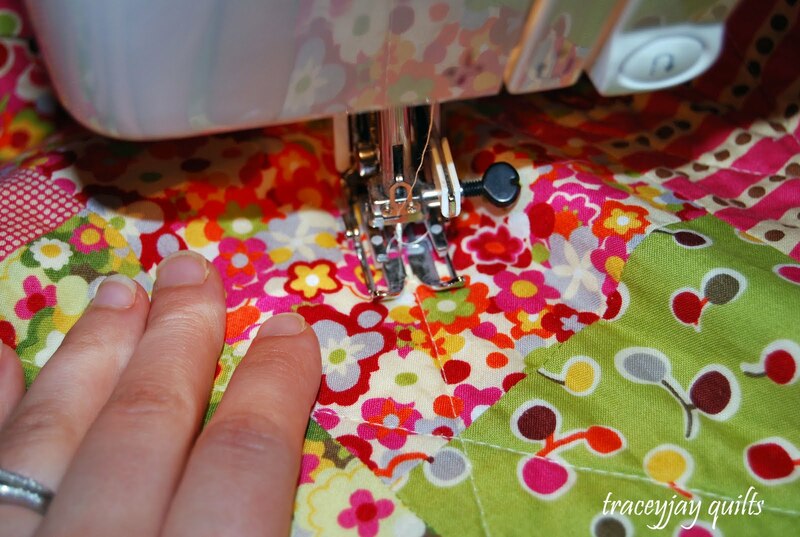 Sew together and press the seams open. 2. 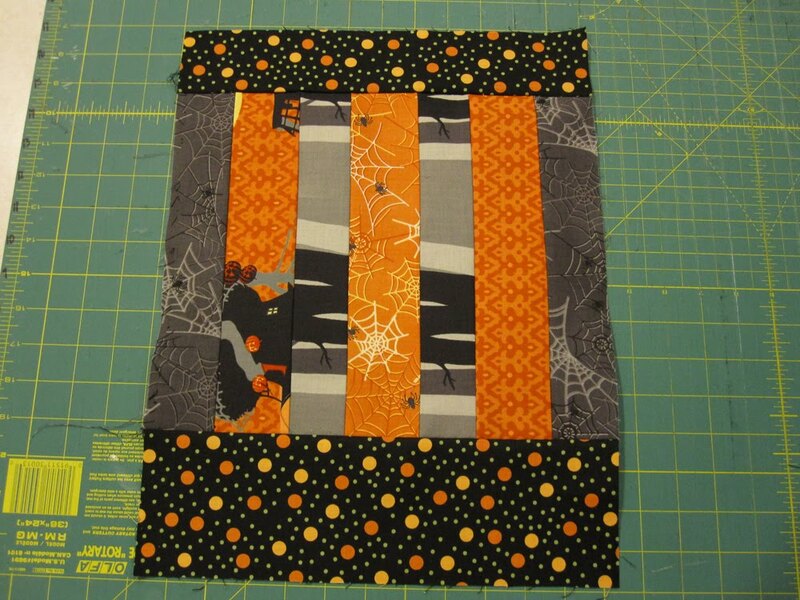 Create 4 rows using 7 blocks, beginning with a bead at the top. 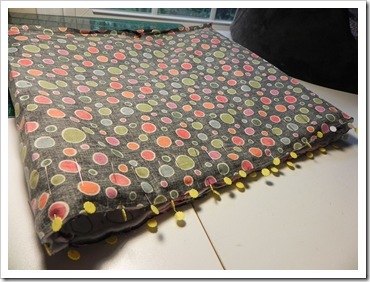 At the end of these rows, add a single bead from one of the ones you laid aside above. Now, add a 3.75 in. 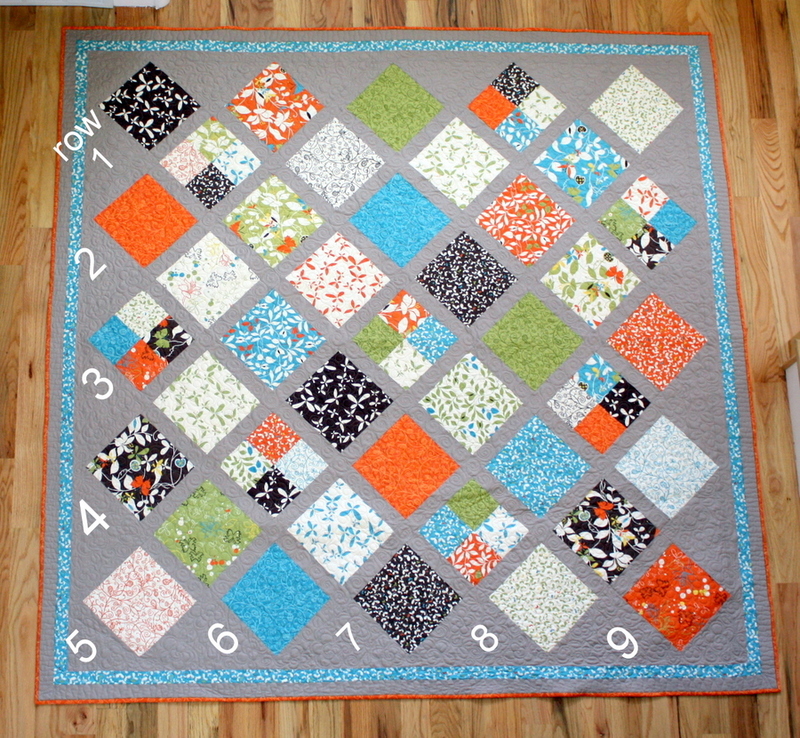 chain piece to the beginning and the end of each of these 4 rows. You will now have 8 beads in these 4 rows, beginning and ending with a long chain piece. 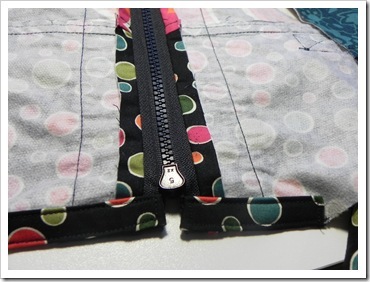 Sew together and press seams open. *Hint: You will have 3 beads left over. You could piece them into the backing, just for fun! 3. 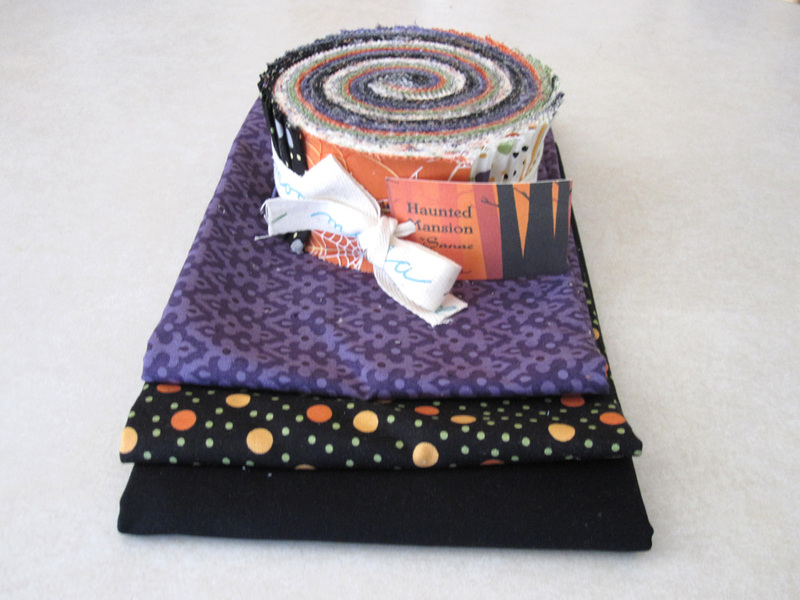 Using a design wall (or even the floor) is a great way to move around the beads to get a pleasing combination. 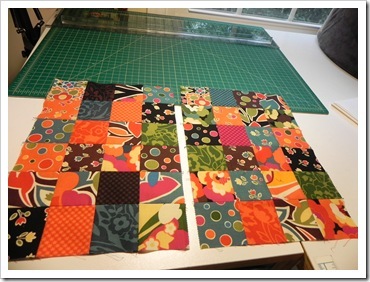 The 10 LOF background strips that you cut at the beginning of this pattern will be used to separate the long bead chains in the quilt top. 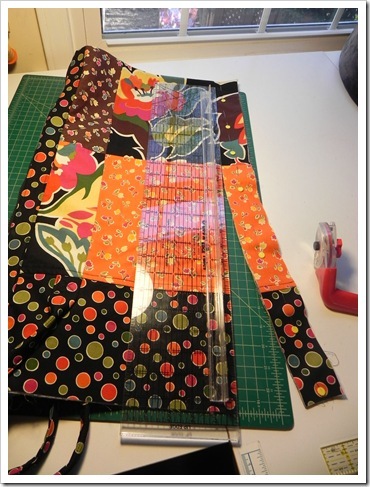 Measure several long bead strips and cut the sashing strips to that measurement. 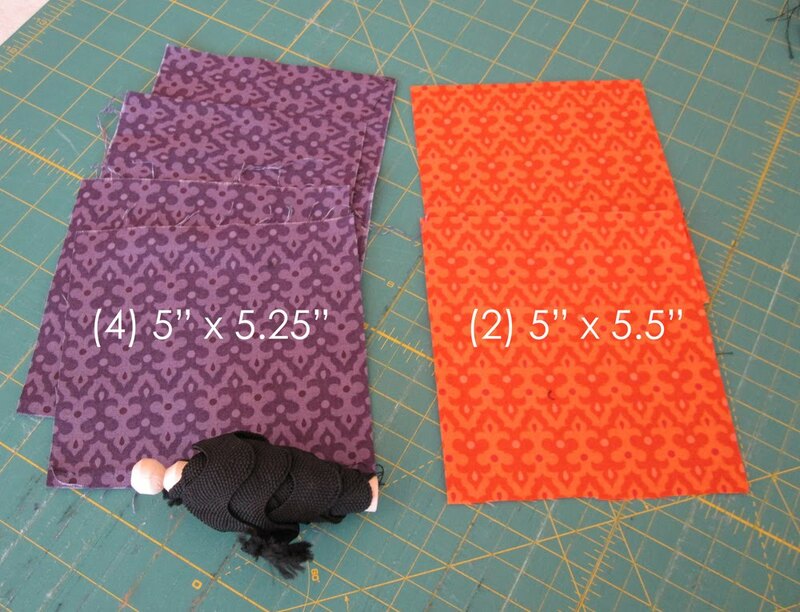 *Hint: You can use an average if the lengths vary slightly. 4. 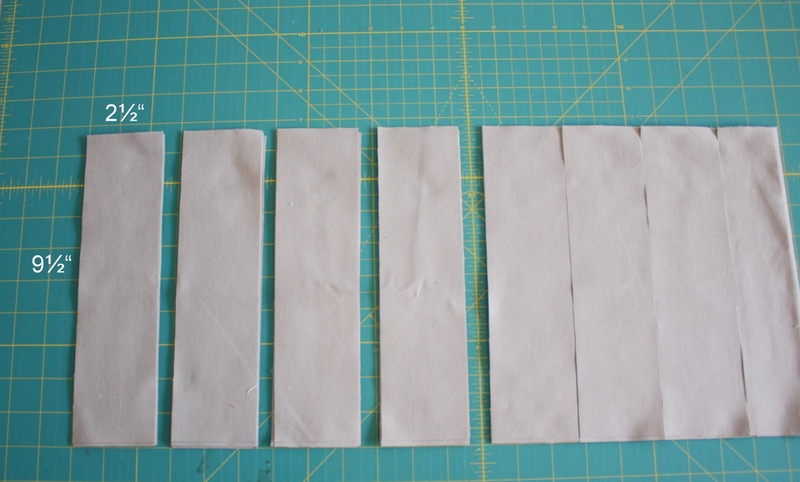 You can lay out the strips in any way that you like, but use a 3 in. 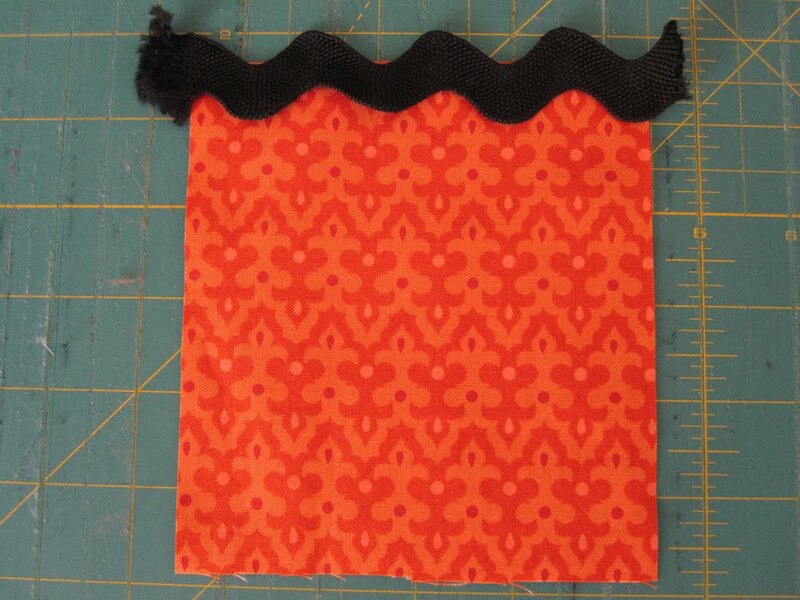 background strip on the outside edges and alternate the 9 bead rows with the 8 bead rows. 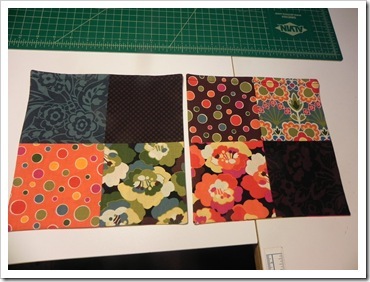 Use the cover picture, or the ones below, as a layout guide. 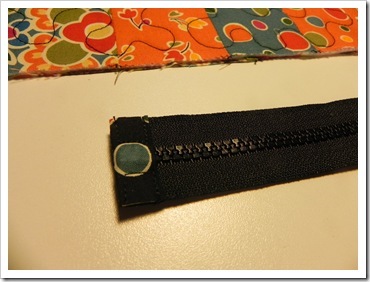 Some of the bead stings will be closer together, depending on where you use the 1.5 in. 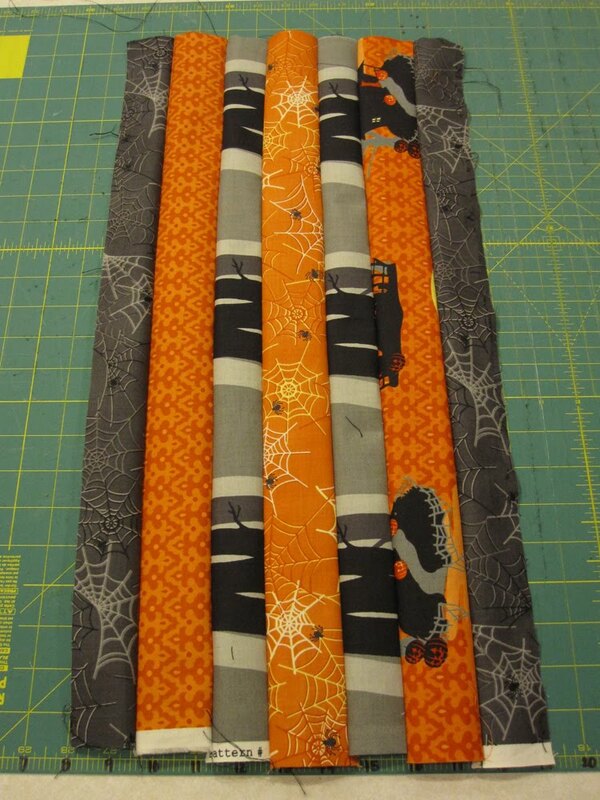 sashing or the 3 in. 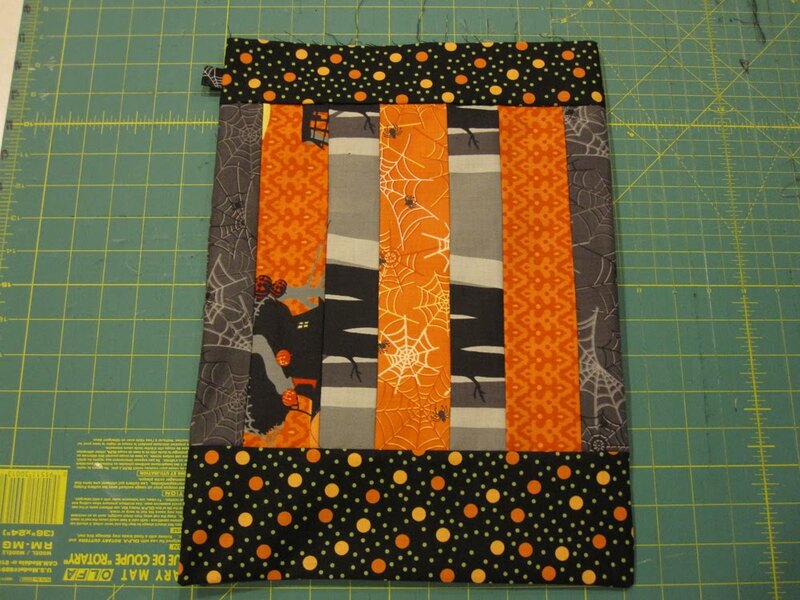 sashing. 5. 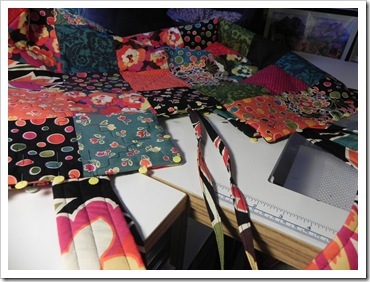 Once you have the rows laid out how you like them, sew them together and press seams toward the sashing pieces. 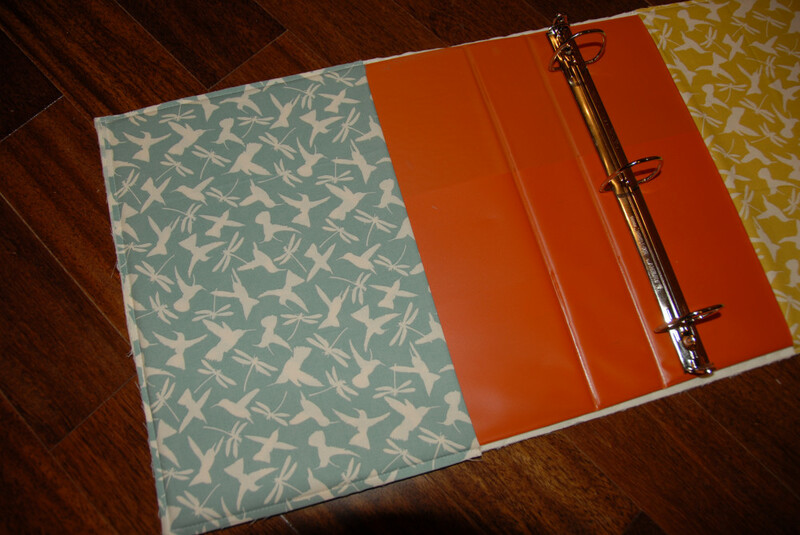 *Hint: The back of a flannel tablecloth makes a great, portable design wall. 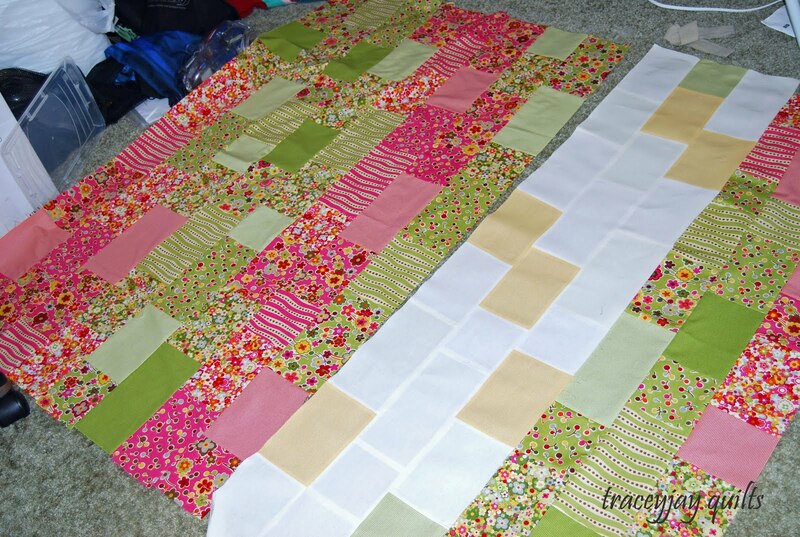 You can fold it up with the blocks laying on it and they will stay put. 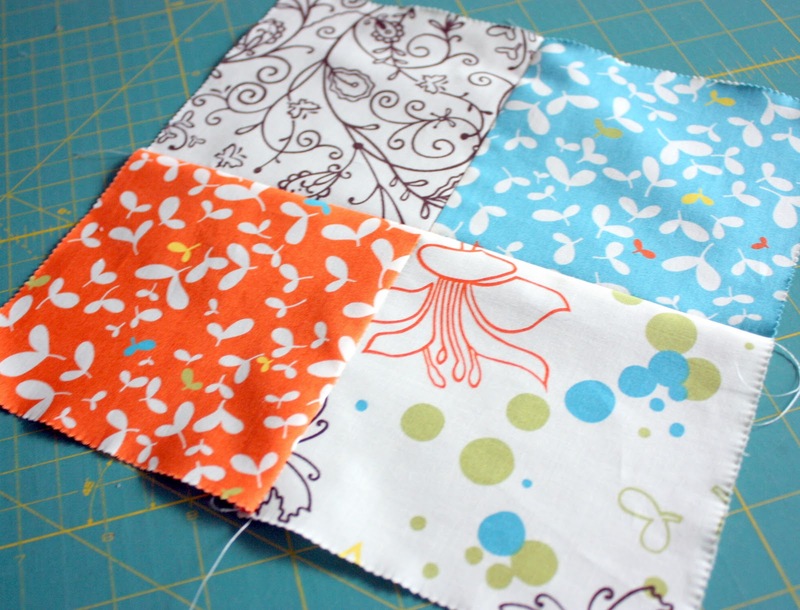 Fold the background/border fabric in half crosswise and cut. Each section will then be approx. 60 in. long. 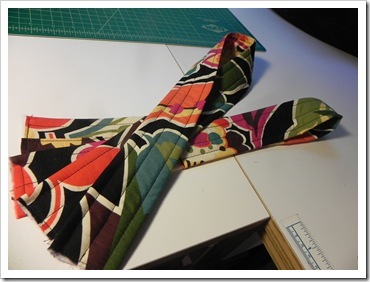 Using one section, cut (4) LOF 4.5 in. strips. 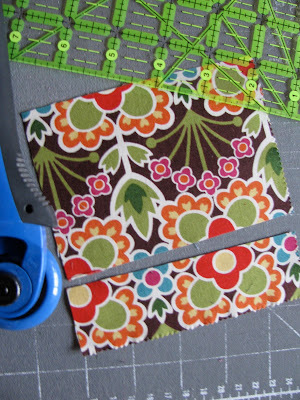 Use these to make the outside borders, measuring across the middle and then cutting the borders to fit that measurement. 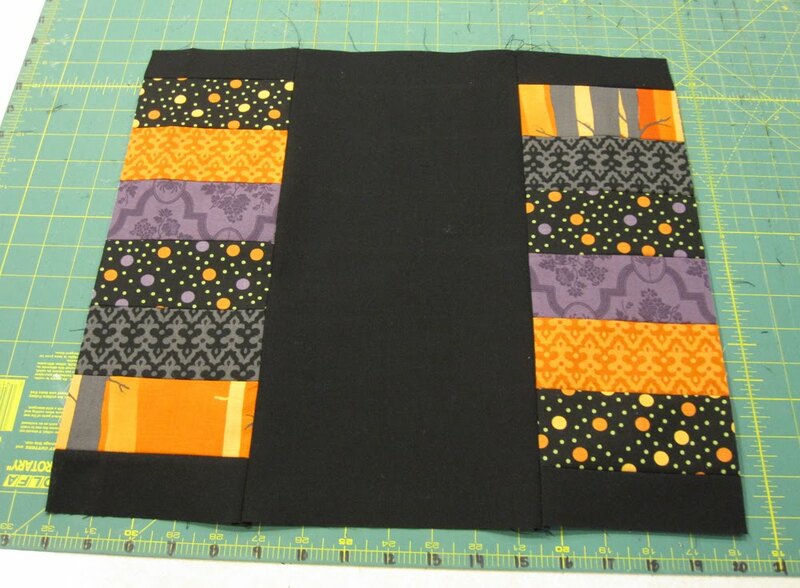 Add the side borders first and then the top and bottom. 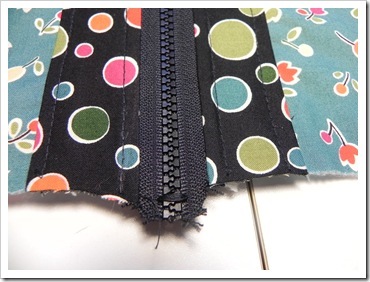 Piece together the remaining backing fabric to create a backing 3 in. 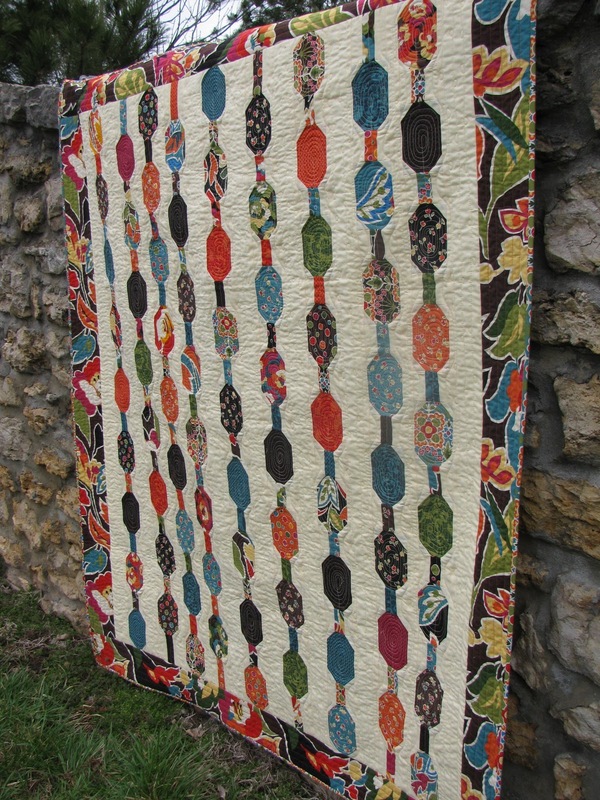 larger than the quilt top all the way around. 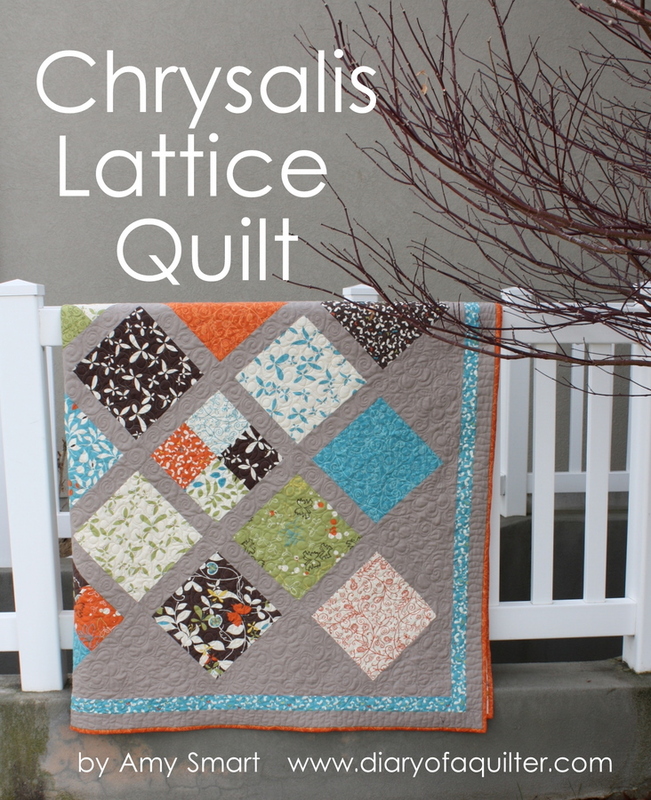 Layer with batting and quilt as desired. 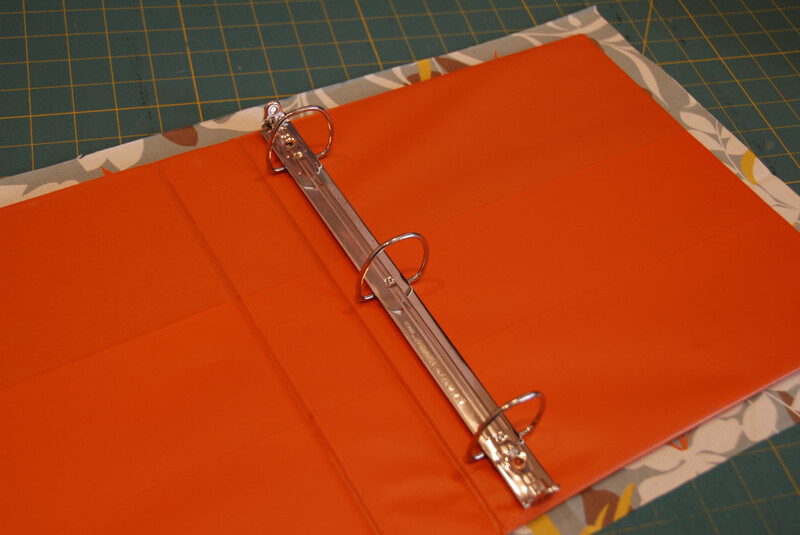 Use the binding fabric to make a French binding by cutting strips 2.25 in. wide. 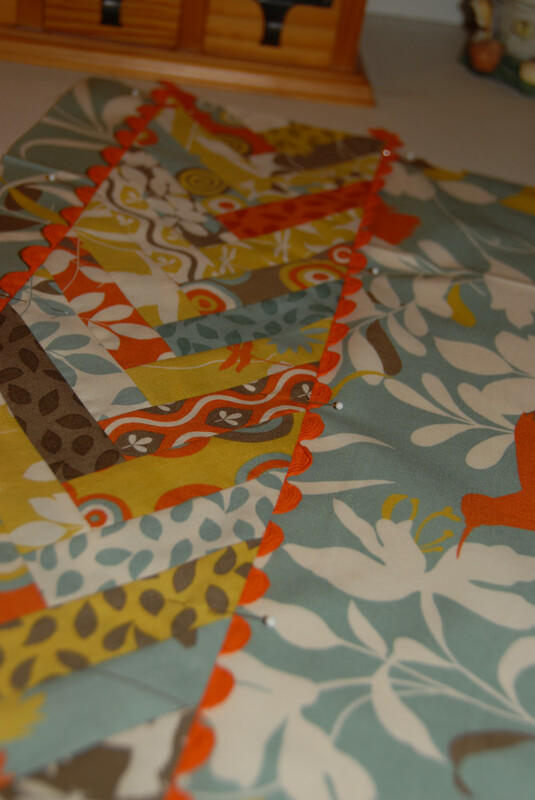 Fold and press in half after sewing them together end to end on the bias. 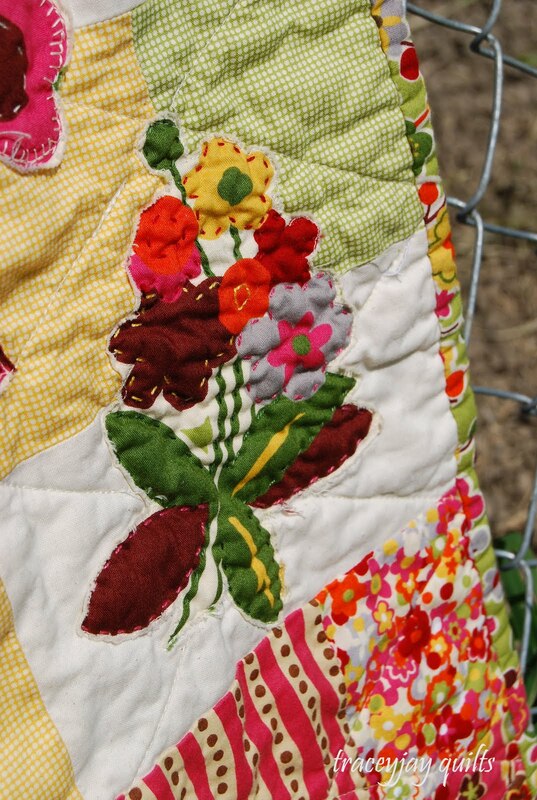 Bind the quilt. 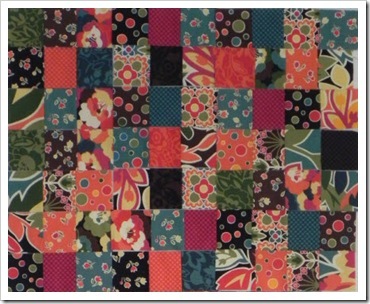 One funky LOVE BEAD QUILT to remind you of the 1970’s! 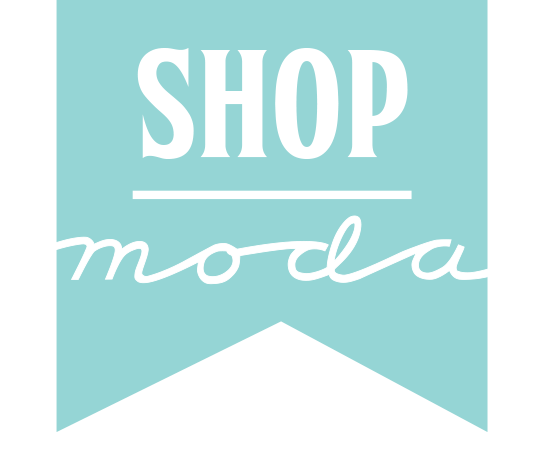 Hello fellow Moda Bake Shoppers! 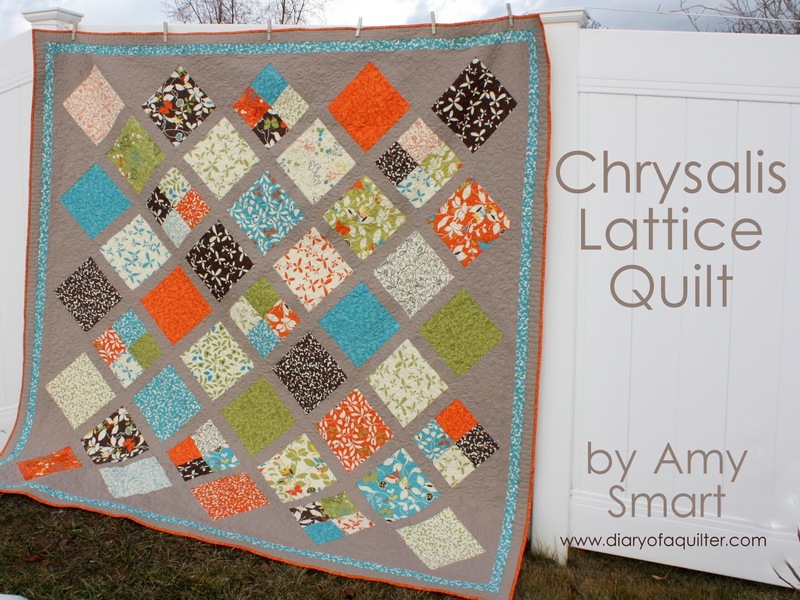 My name is Amy Smart and I enjoy sharing my quilting fetish at my blog Diary of a Quilter. I’m so excited to show you my first MBS recipe! 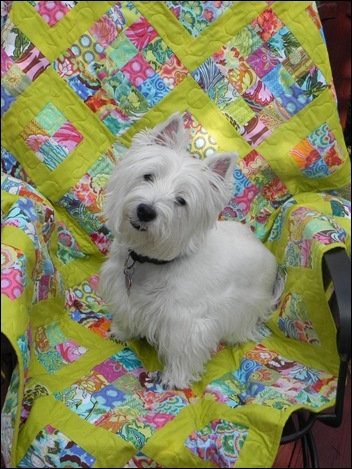 This quilt is perfect for showing off large, graphic prints. 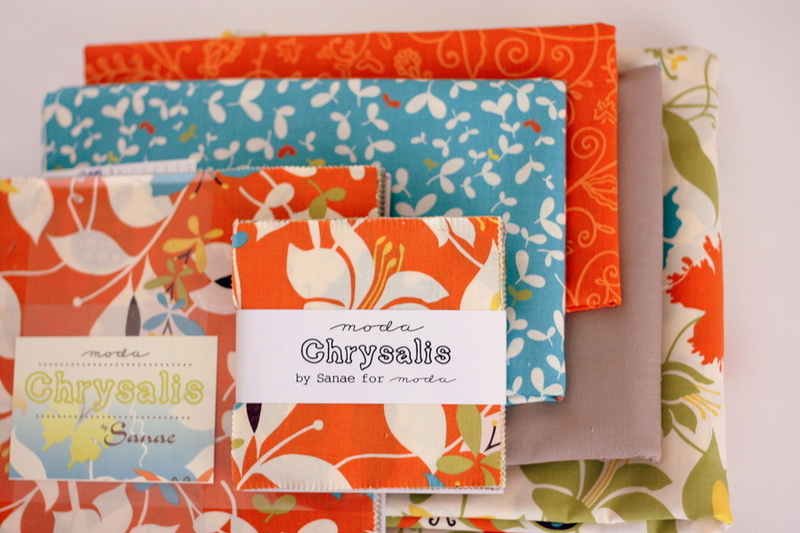 I am using Sanae’s new Chrysalis collection for this project. 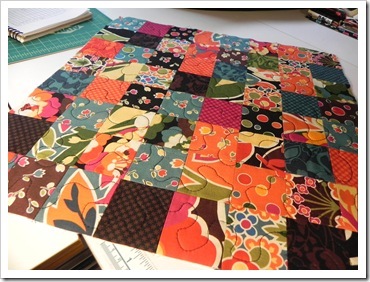 Although this is a larger quilt (finishes 83″ x 83″), a Layer Cake and Charm Pack help it come together very quickly. 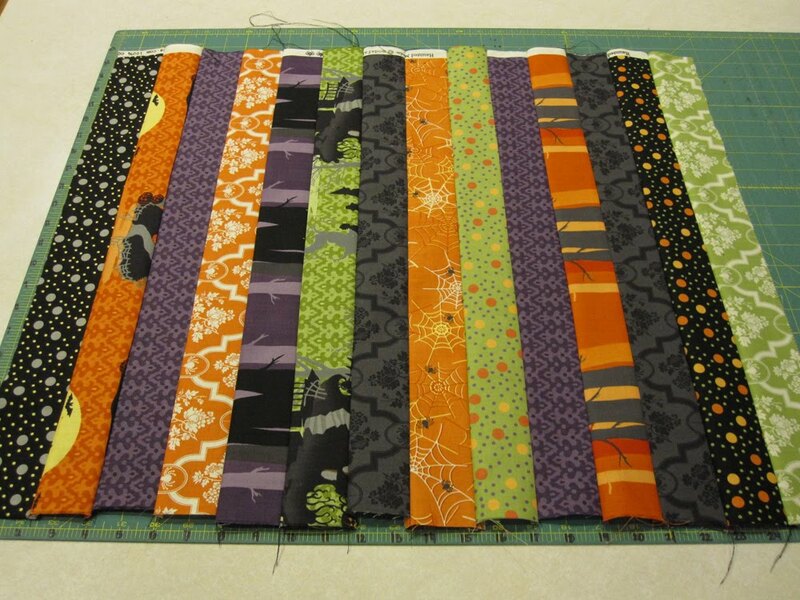 From each of the 9½” (x width of fabric) strips, subcut 16 units measuring 9½” strips x 2 ½”. You will need 32 total of these units. 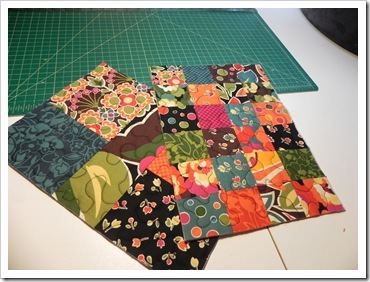 From the 14″ strips, cut a total of (4) 14″ squares. Reserve the extra fabric. 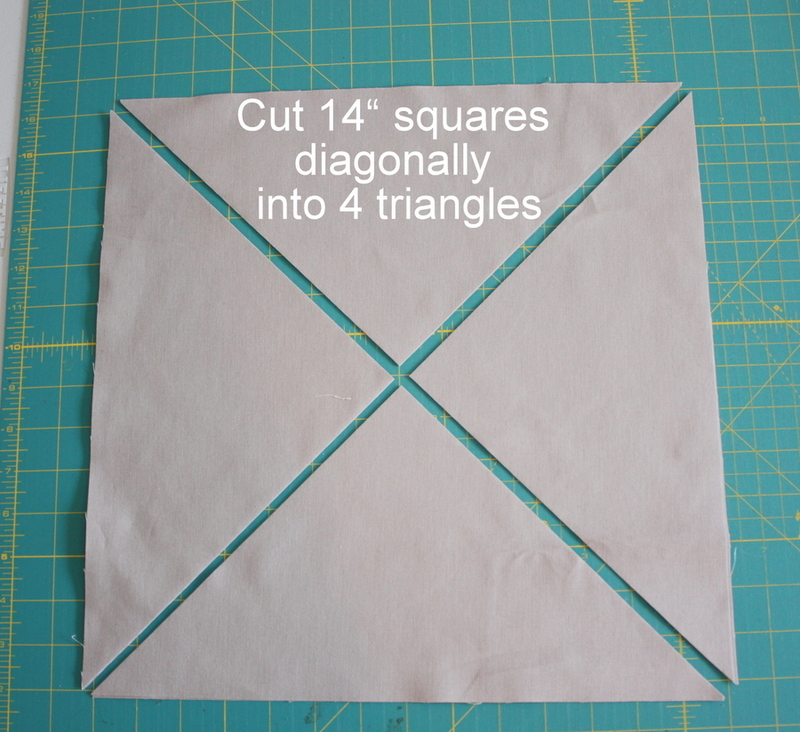 Subcut each of these 14″ squares twice on the diagonal to create 4 equal triangles per square. 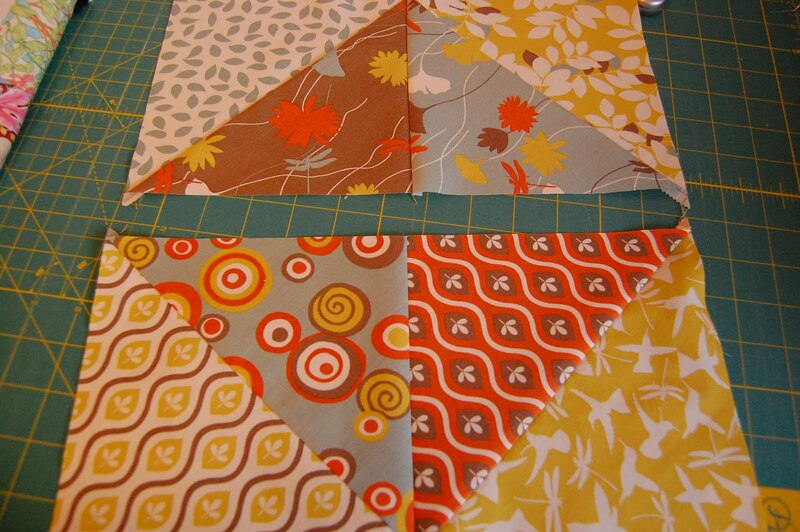 Set these aside as Setting Triangles. You will need 16 Setting Triangles. 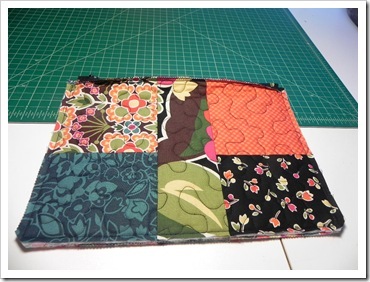 From the remaining piece of 14″ wide fabric, cut (2) 9″ squares. Cut them each once on the diagonal. These are your Corner Triangles. You will need 4 total. Trim 33 of the Layer Cake squares down to 9½” squares. 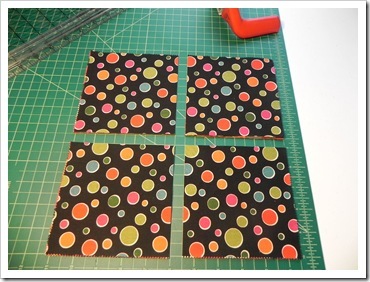 Cut (8) 2″ x wof strips from the blue border fabric. 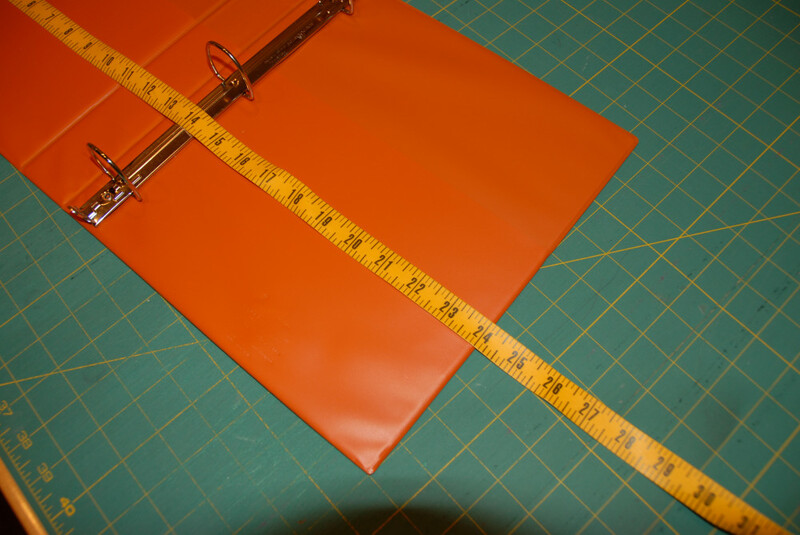 Cut (8) 2½”x wof strips from the orange binding fabric. 1. 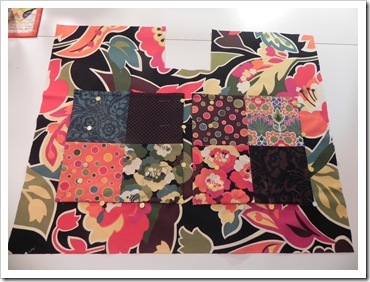 Using 32 of the Charm Pack squares, create (8) 4-patch blocks. 2. 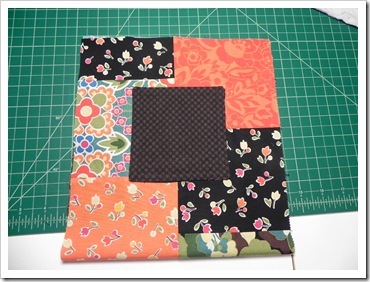 Using the 33 trimmed Layer Cake squares and 8 four-patch blocks, layout your 9½” squares on point starting with 5 squares across (see picture below) until you get the balance of color you like. 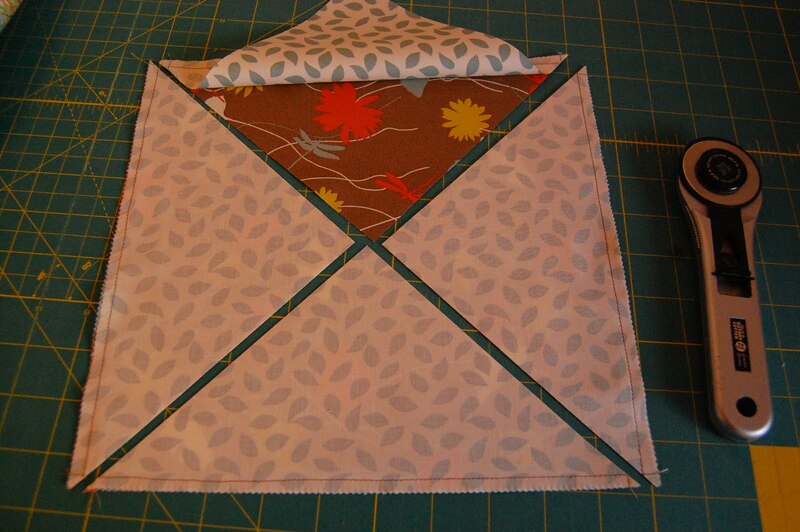 Then add the sashing strips and setting/corner triangles. 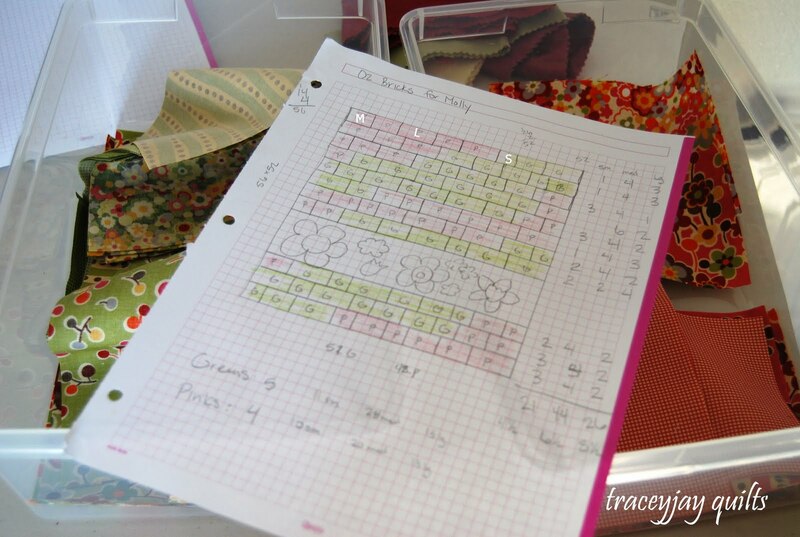 Because you are assembling the quilt using diagonal rows, laying out the quilt on the floor or a design wall will help you keep track of which block goes where. 3. 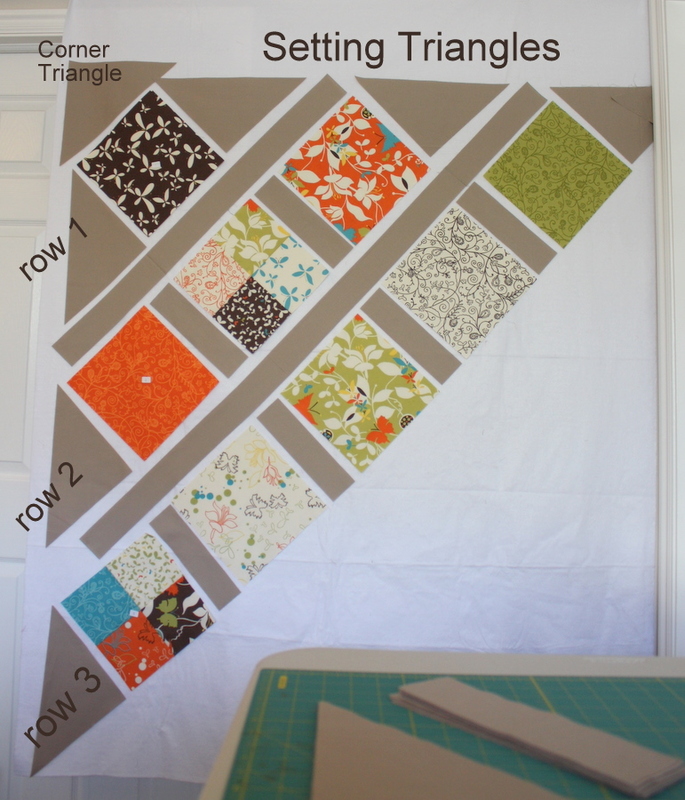 Start assembling rows diagonally with a Setting Triangle at the beginning and end of each row. 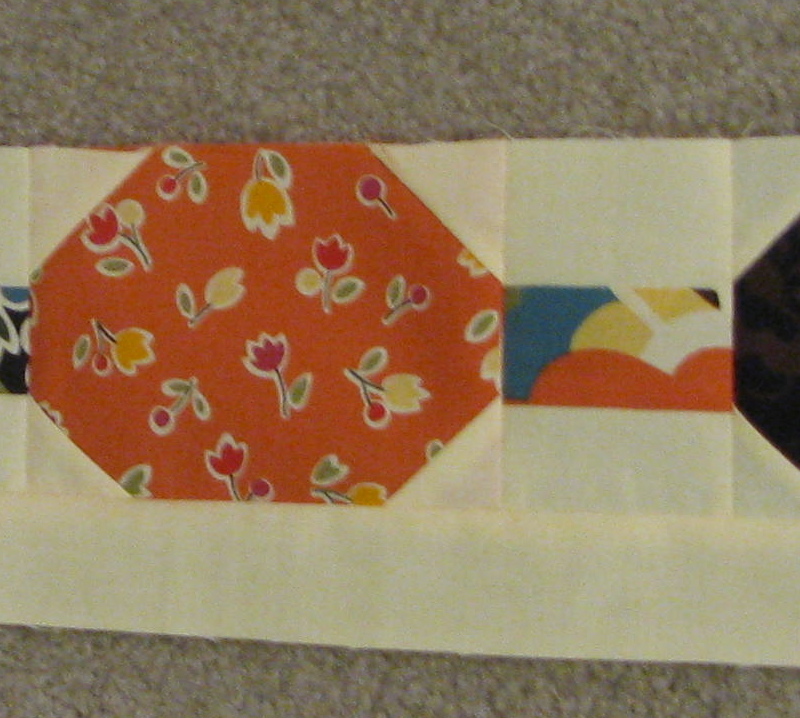 Alternate 9½” x 2 ½” strips between the squares on rows 2-8. 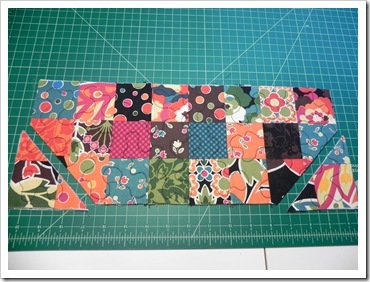 Sew a Corner Triangle at each end of row 5. 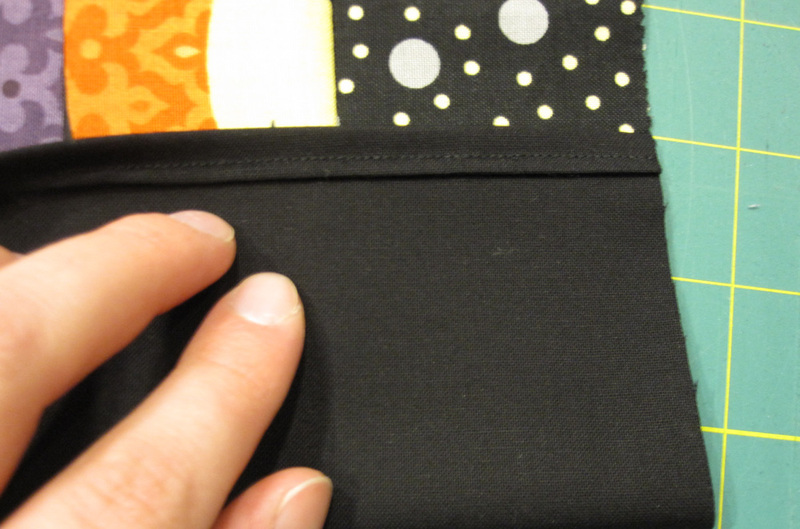 I pressed seams toward the solid strips. 5. 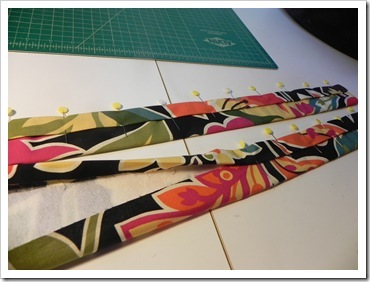 In order to make sure the side-sashing strips match up, place the row with the long-sashing strip sewn to it on top of the row to be attached, right sides together. 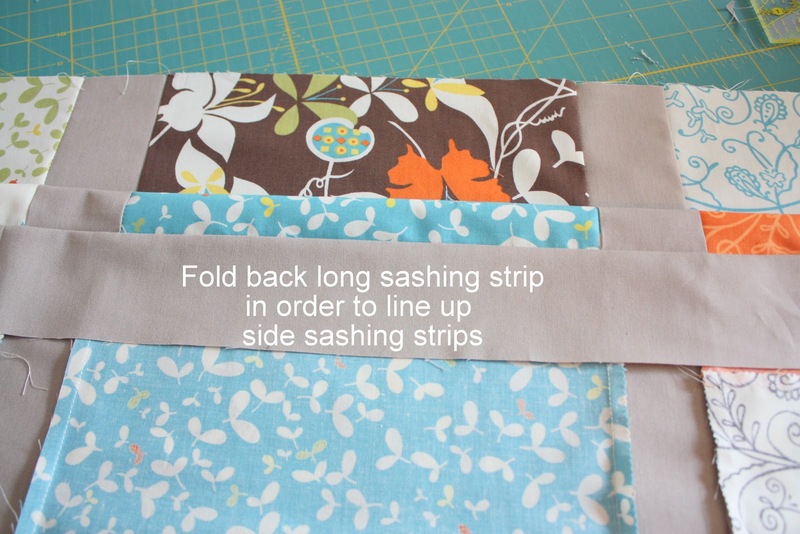 Fold back the row with the solid sashing strip at the top and make sure the side sashing segments are lined up. 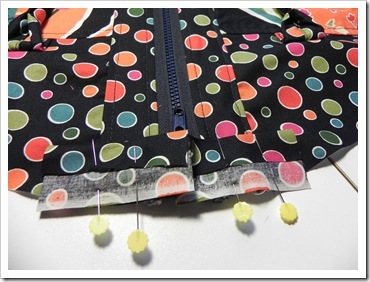 Carefully return the top row back in place, pinning raw edges to sew together. 6. 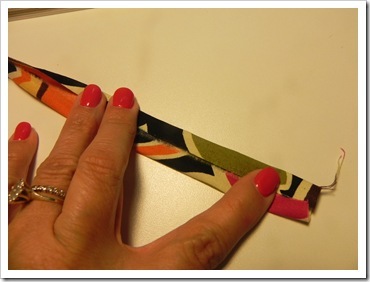 Press toward solid strips. 7. Square-off ends using a long ruler. 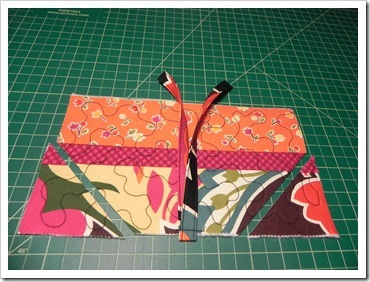 Make sure to leave a ¼” seam allowance at the corners of the printed blocks. 8. 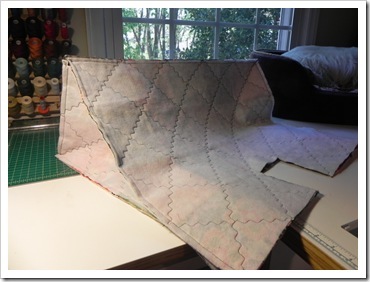 Square-off Corner Triangles using quilt sides as your guide. Be careful to keep the corner square. 9. You are ready to attach the borders. 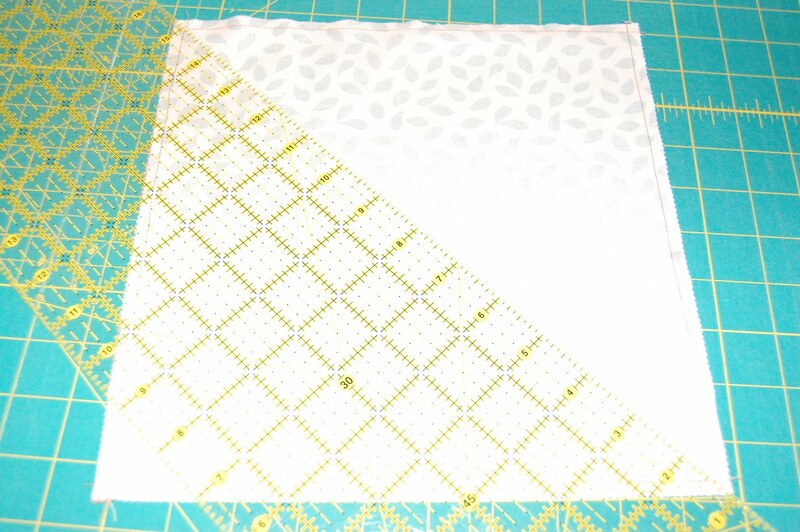 This is my favorite method for attaching borders. 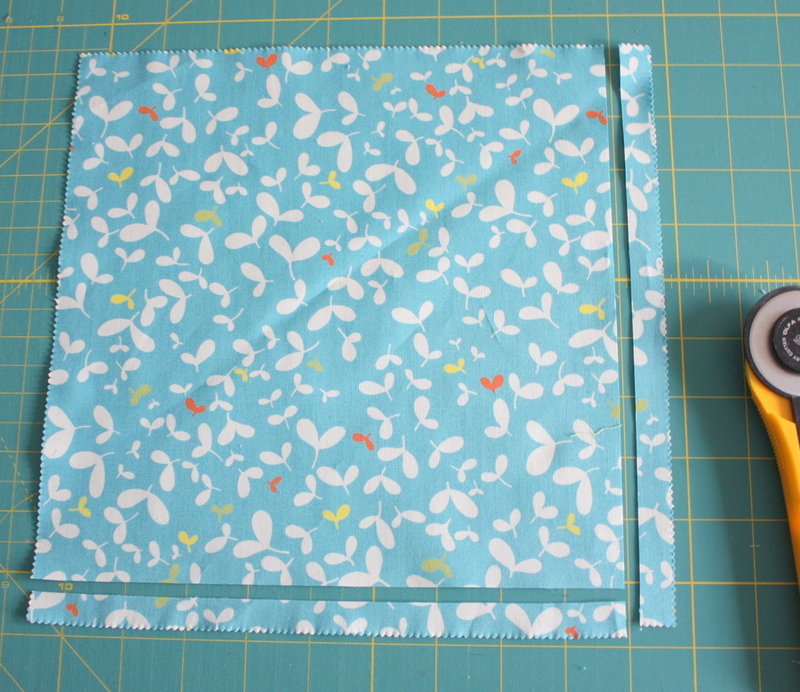 It’s quick and simple, but it still keeps the quilt square and not wavy at the edges. 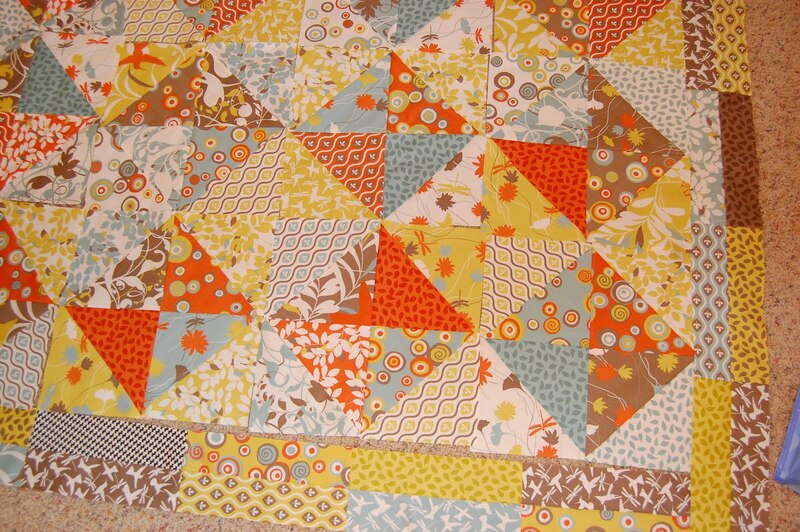 Spread the pieced portion of the quilt flat on the floor. 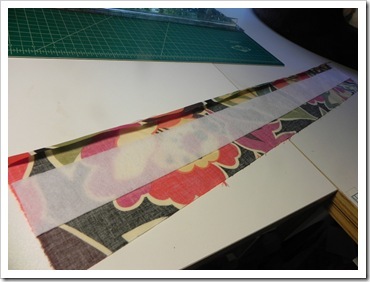 Before you measure the lengths of your border strips, trim off the selvage edges. 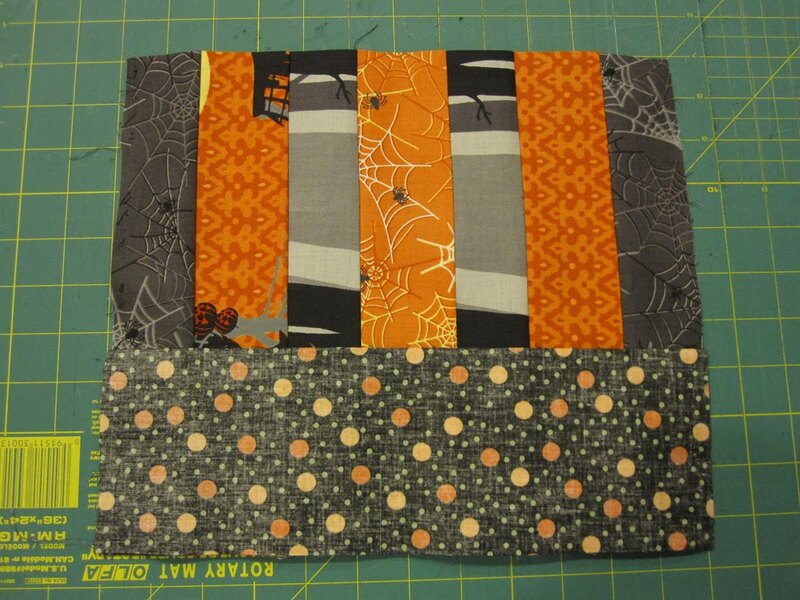 Match up ends of the strips with one edge of the quilt and lay 2 of your border strips across the center of the quilt. 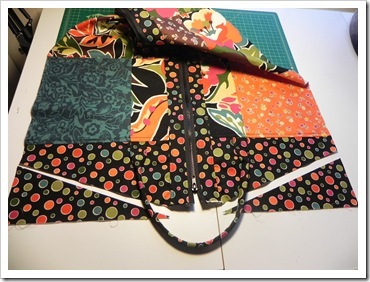 The other ends of the strip will hang off the end. 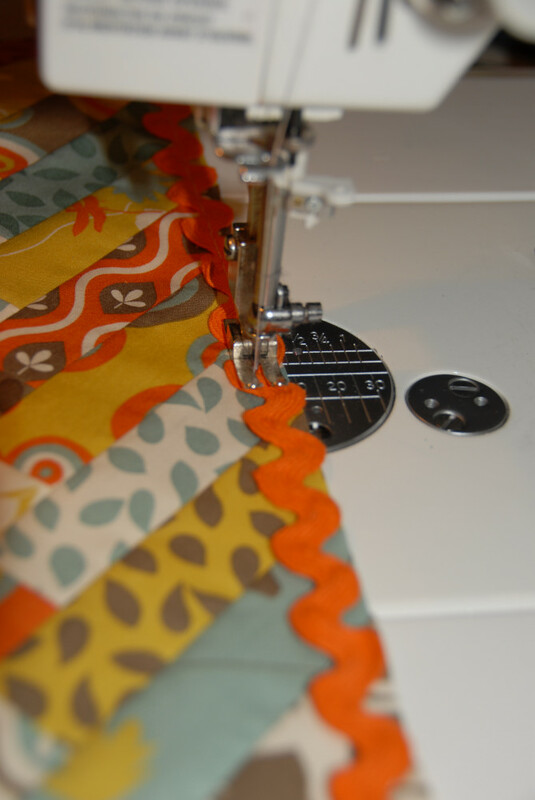 Mark the quilt length with a pin and trim ends off with a rotary cutter. 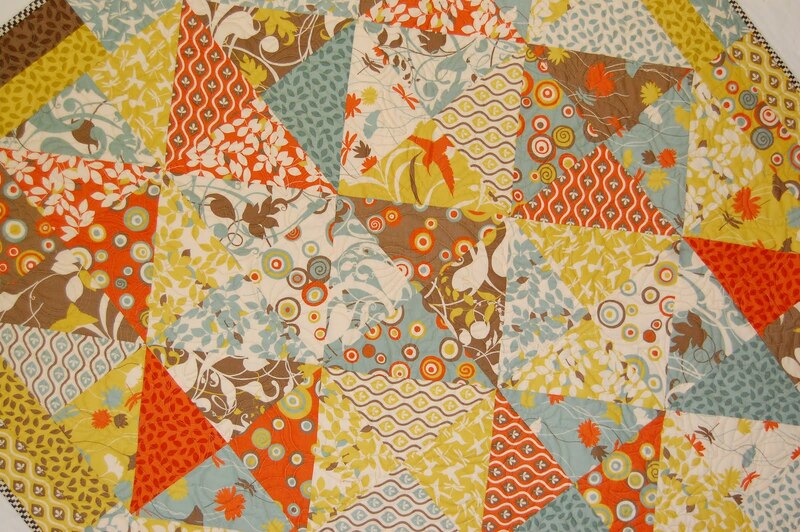 Repeat this step with all quilt edges. 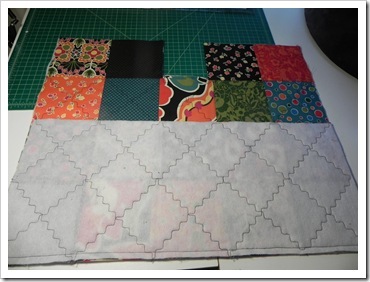 Start with (8) 2″ x wof strips for the first border. 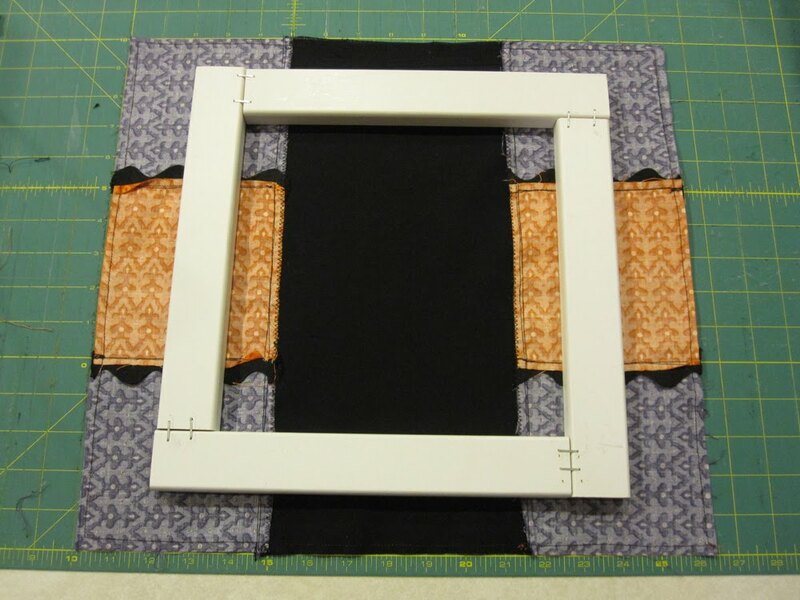 The second border (blue) requires (8) 2″ x wof strips and the last gray border requires (8) 2″ x wof strips. 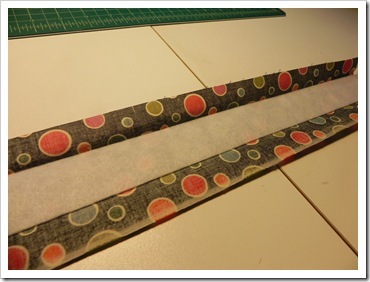 Sew two strips together end to end for each side and trim accordingly. 10. 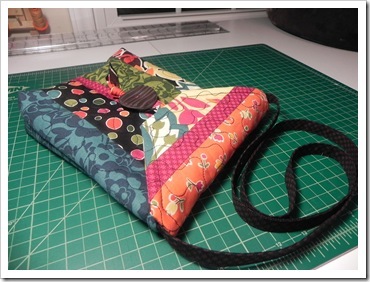 For the backing, you will need at least 4¾ yards. 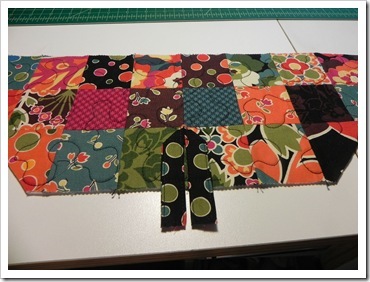 Cut the yardage into 2 23/8 (85.5″) pieces and sew them together lengthwise matching up selvage edges. 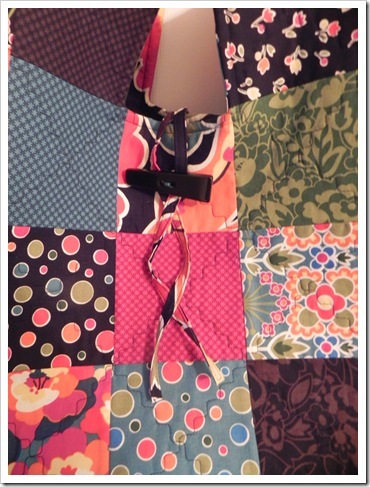 Part Two: Take large backing piece as is and rotate it 90 degrees. 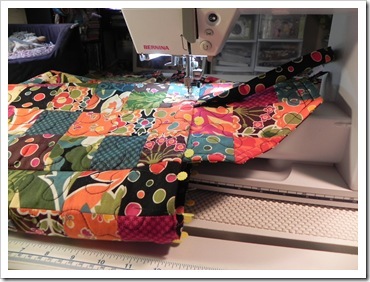 Rotary cut 22″ off from a perpendicular side (should cut through the new coordinating fabric.) 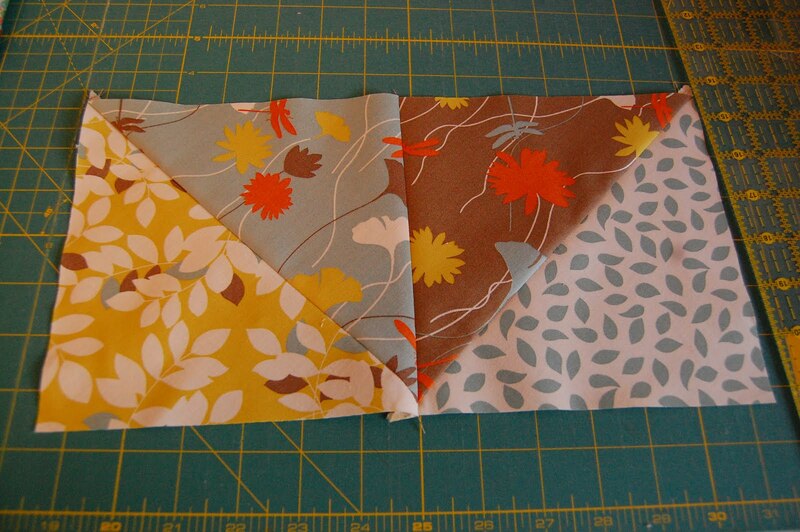 Set these two backing pieces aside. 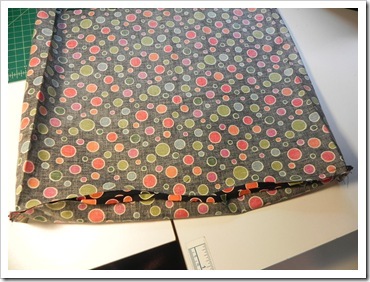 Take the second coordinating 4½” x 85″ strip and cut 22″ off from one end. 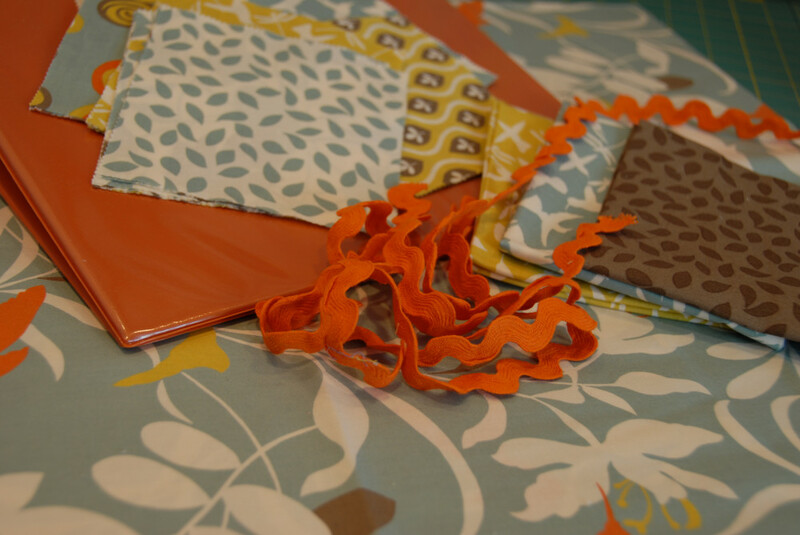 Chose a contrasting fabric from your remaining Charm Pack squares and trim down to 4½”. 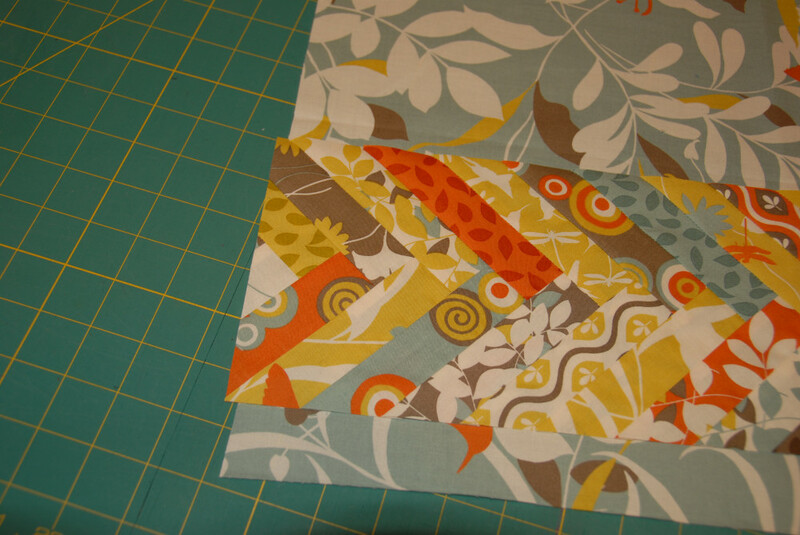 Insert square here and then sew 22″ trimmed piece back onto the end of the strip. 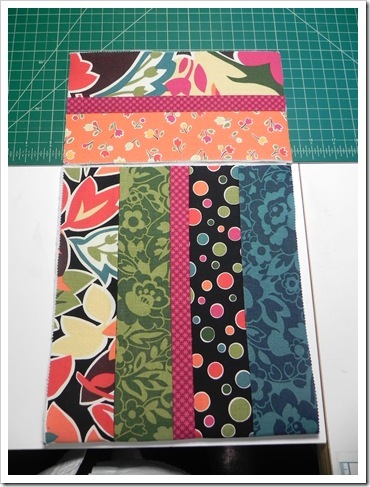 Now, matching up contrasting Charm Pack square with the 4″ coordinating print, sew this strip to the large piece of backing fabric. 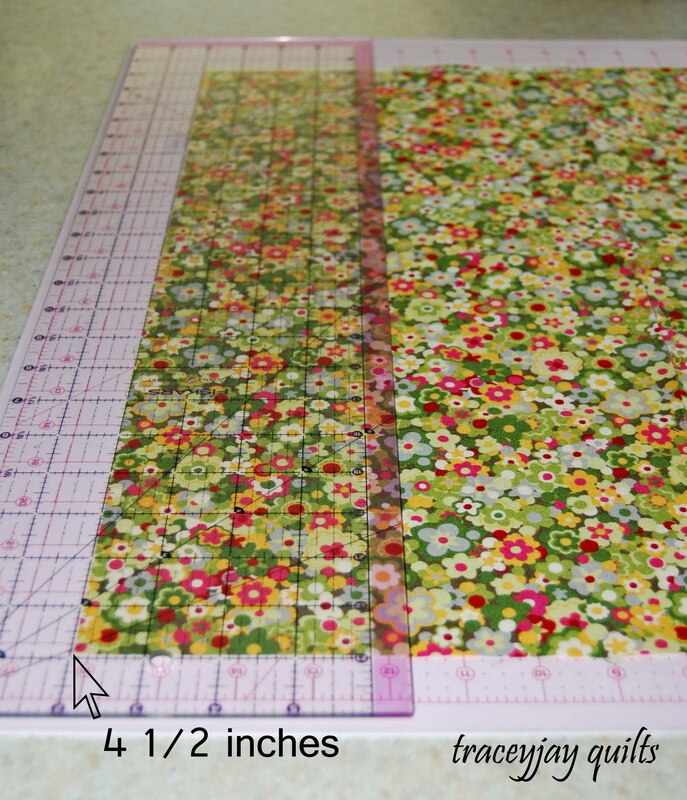 Attach the 22″ trimmed piece to the other side of the coordinating strip. 10. 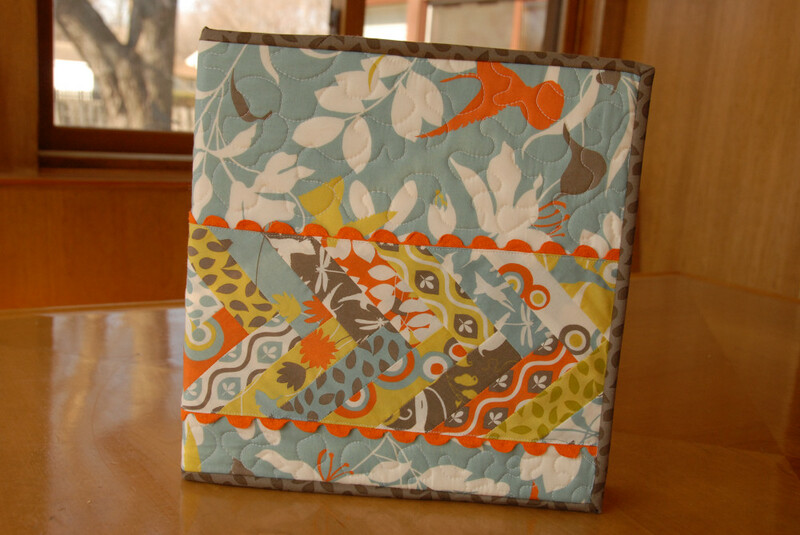 Quilt using your favorite method (or use your favorite quilter.) 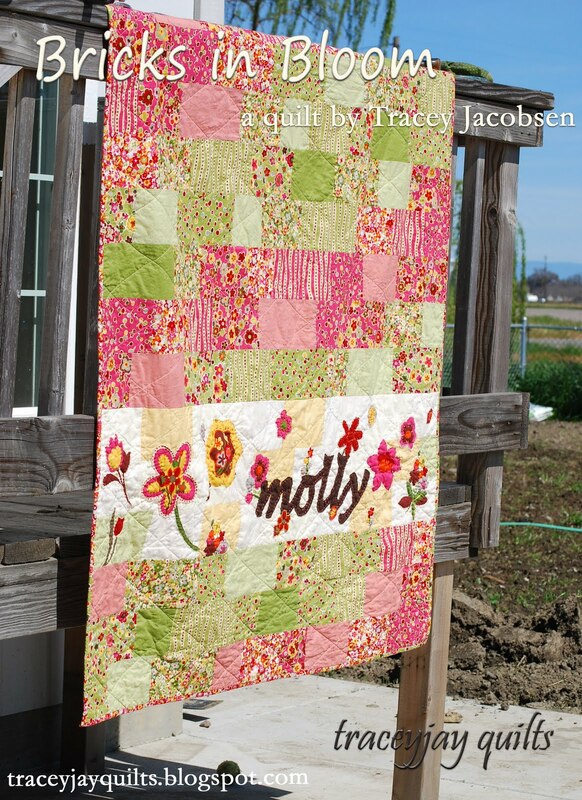 My friend and co-worker, the talented Becky Heslop, did an amazing job quilting this for me. Thanks again Becky! 11. Binding. 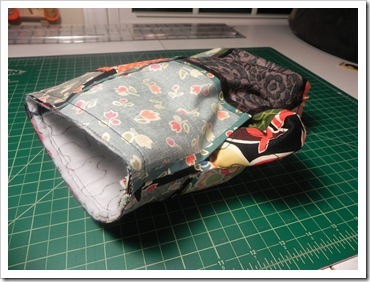 This is the method I used to bind my quilt. 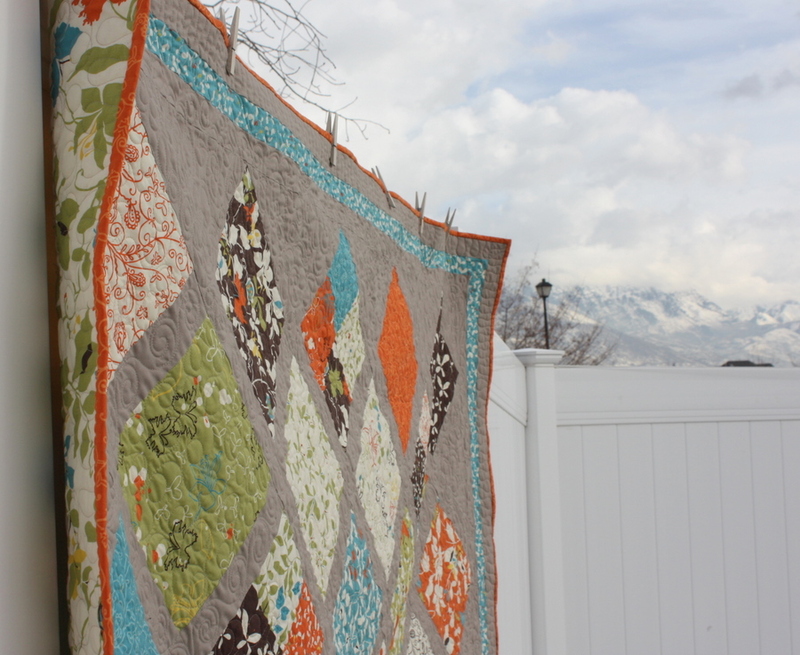 One 83″ x 83″ quilt. 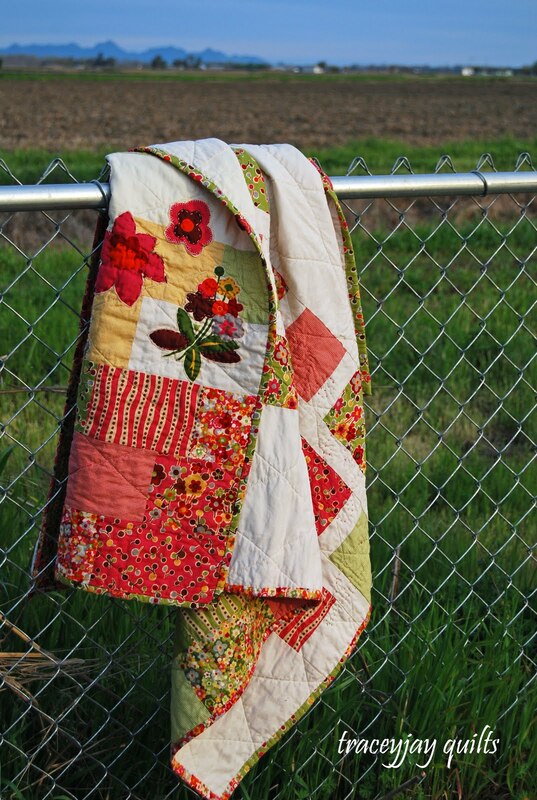 This quilt is simple, but a perfect way to show off those pretty, larger prints. 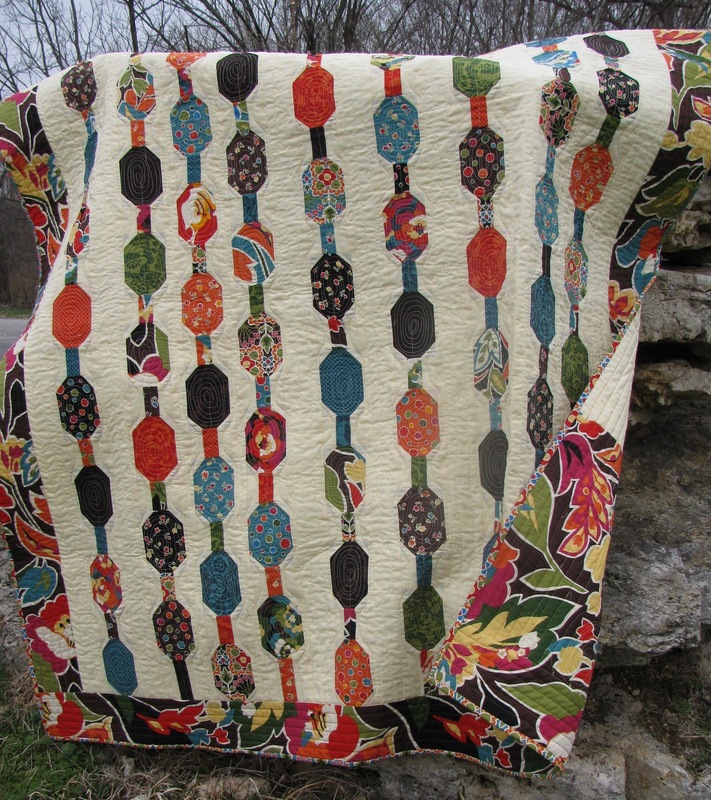 The sashing breaks them up and really highlights the fabric design. 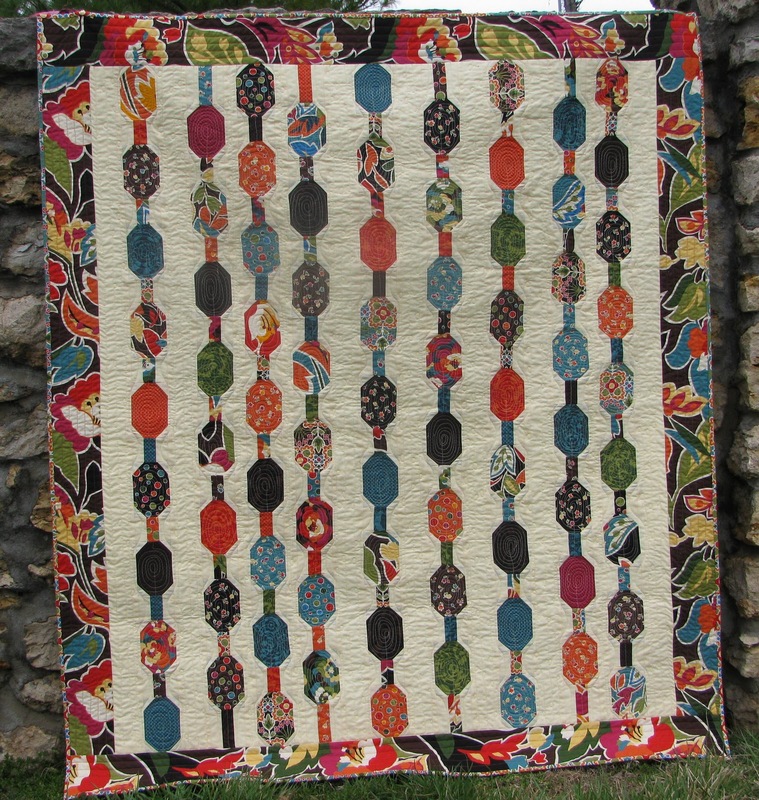 This quilt would work in so many different fabric styles – traditional to modern. 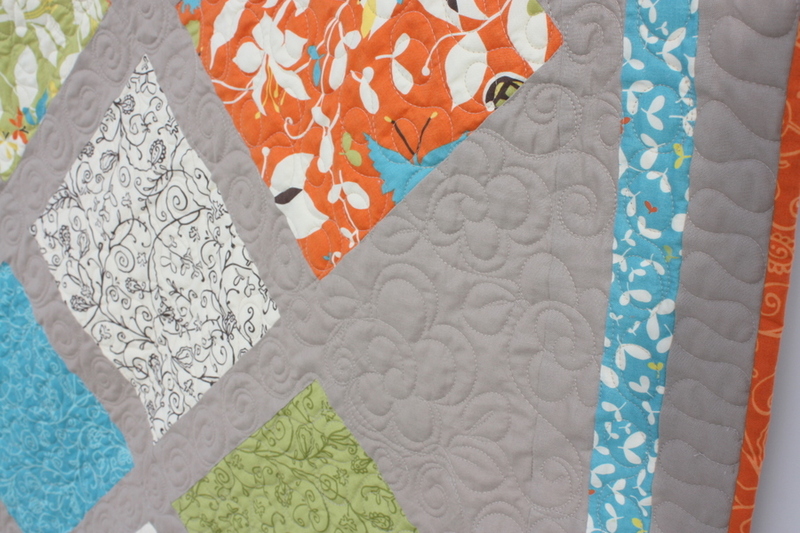 Once again, I loved how quickly this came together for such a large quilt. 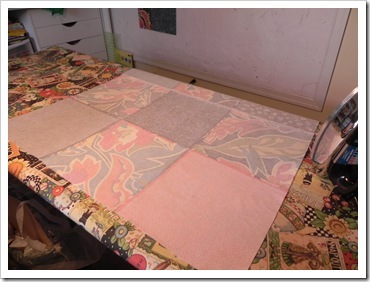 It could easily become a queen or king size quilt just by adding wider borders. 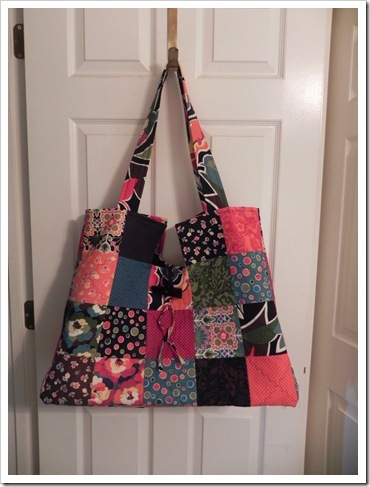 I hope you enjoy making one of your own! 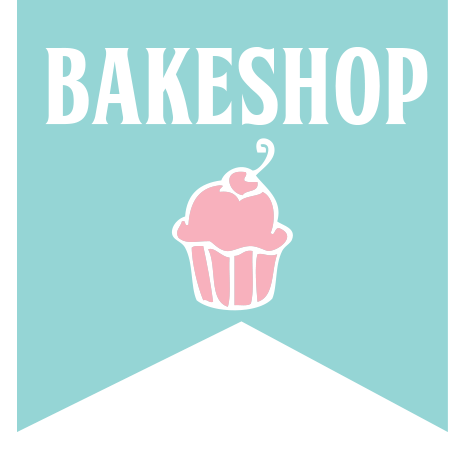 It has been a lot of fun to come bake with Moda! 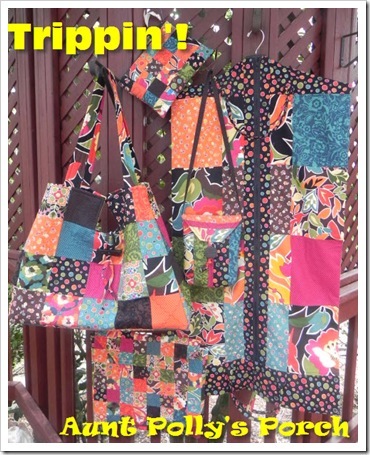 I hope you’ll come visit me at Diary of a Quilter. I would love to hang out more! Hello again! It is LeAnne over at Everyday Celebrations. 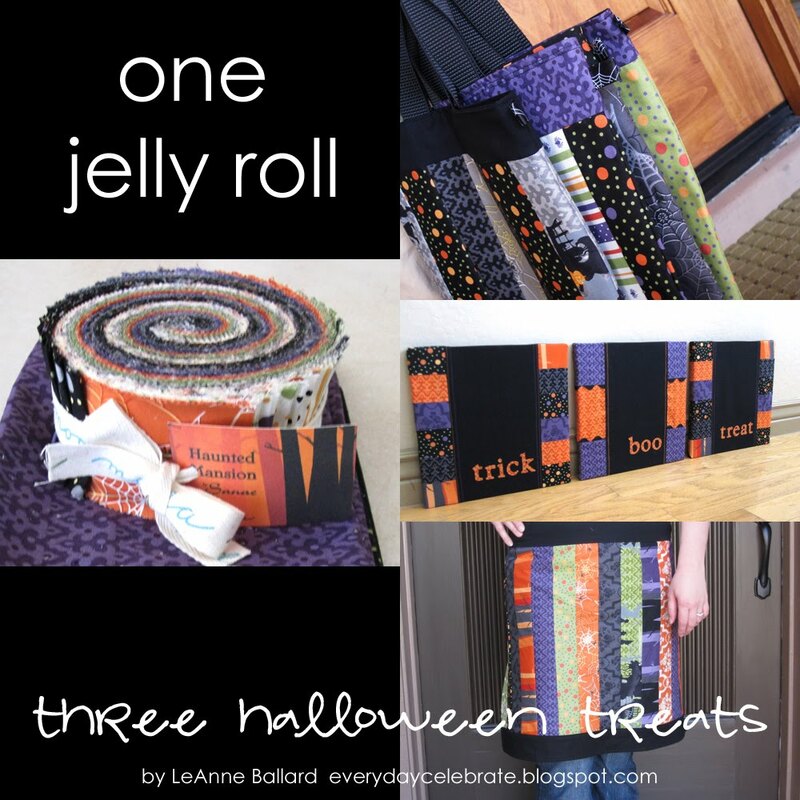 Today I am bringing you three delicious little Halloween treats that can all be made from one jelly roll! 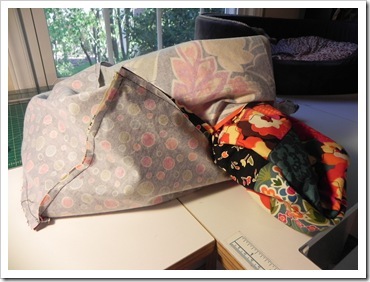 I will warn you, this is a loooong post! 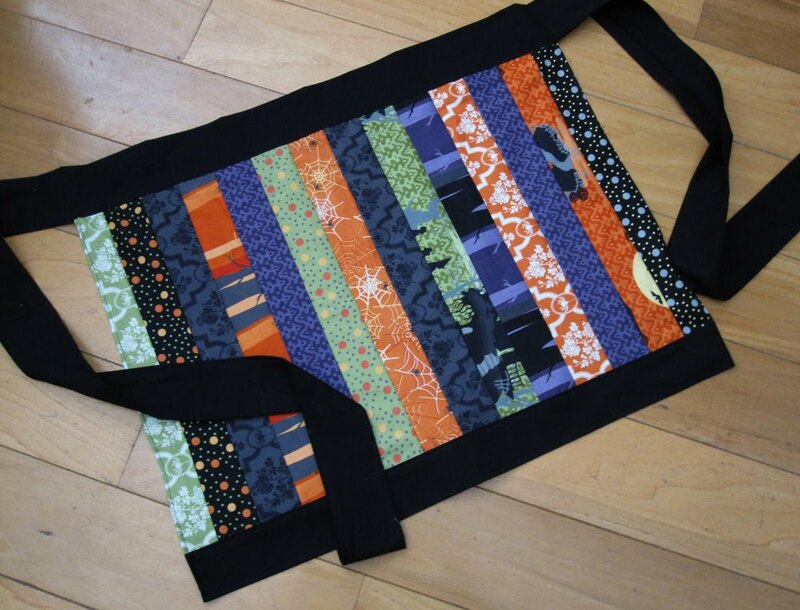 However, I made one apron, three wall hangings, and six trick or treat totes with one jelly roll! 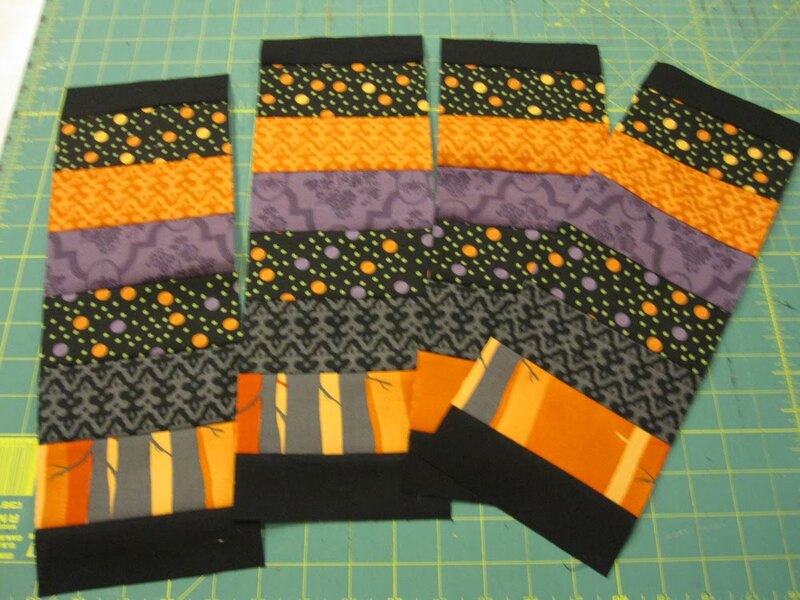 (Along with minimal additional fabrics.) 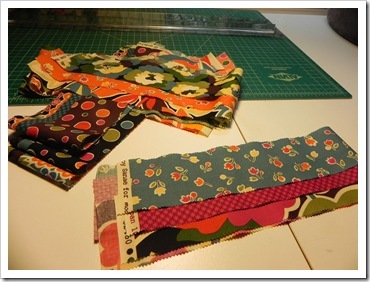 So if you are looking for some quick projects, just pick up your favorite seasonal jelly roll, some solid fabric, a couple of fat quarters, and get sewing. p.s. 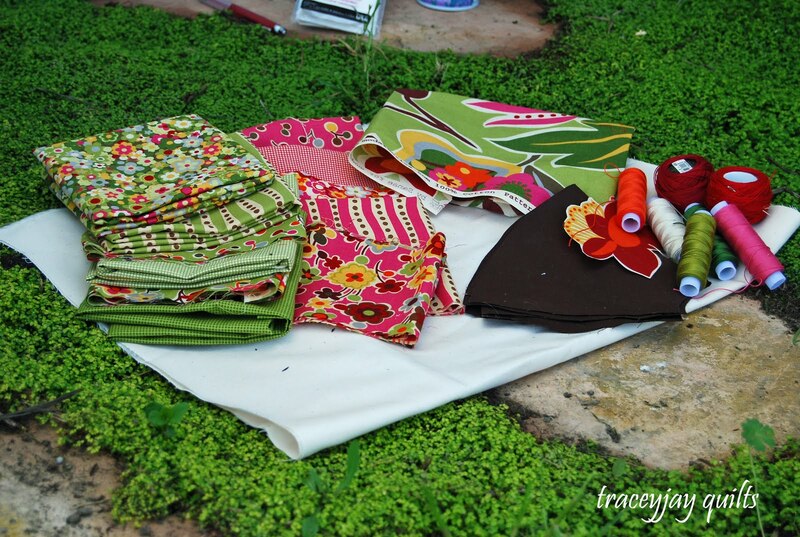 These all would make adorable Christmas projects too! 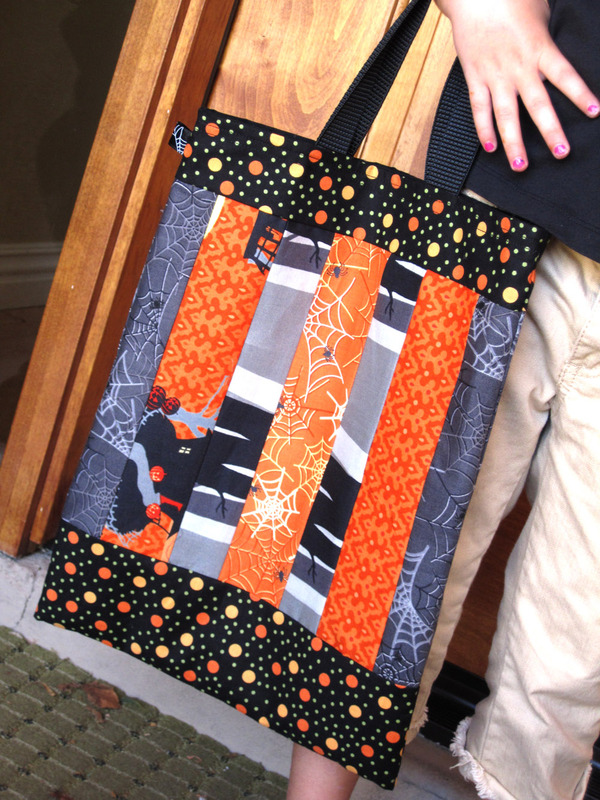 p.p.s Since I was able to make so many cute little trick or treat totes, I have a couple in need of a home! 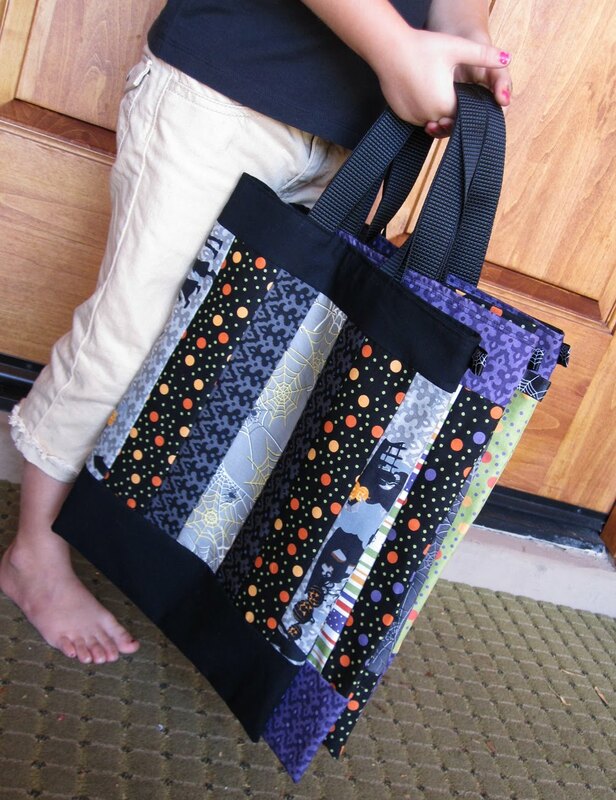 So click on over to my blog and leave a comment to win one of the pictured trick or treat totes! Below is the breakdown of materials for each project. 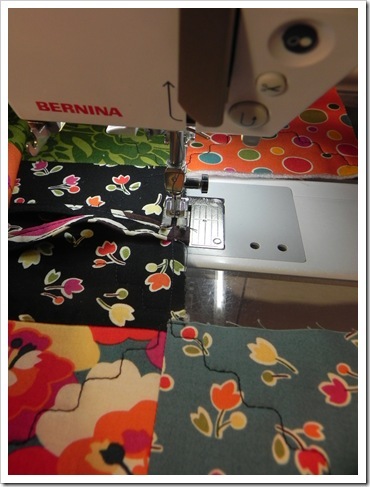 All seam allowances 1/4″ unless otherwise stated. 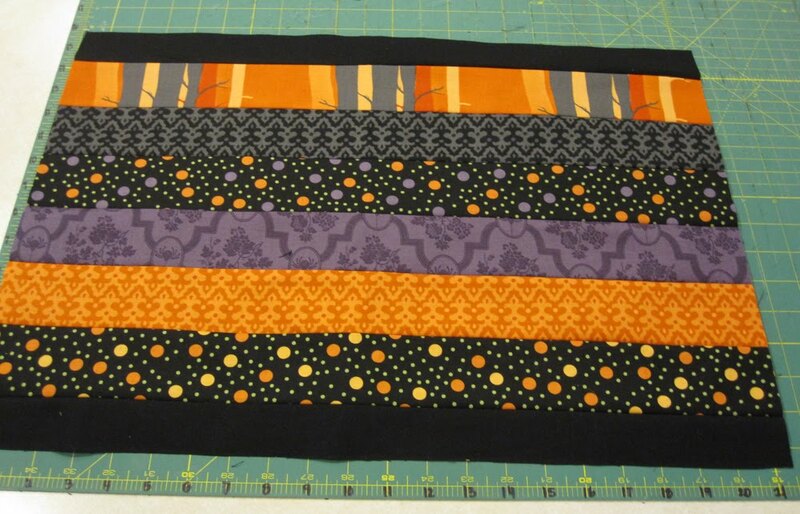 Tip: I remember the first time I sewed with jelly roll strips. 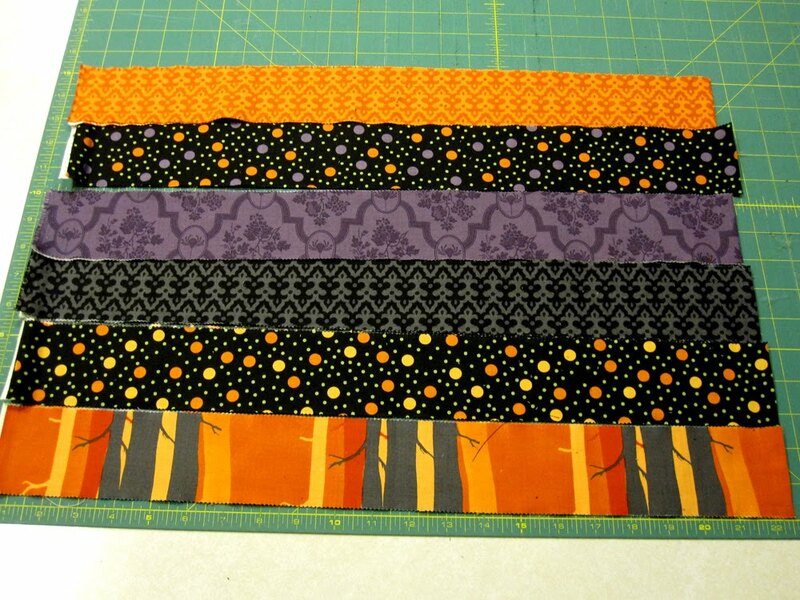 Boy was I surprised when I had a massive ‘curve in my pieced jelly roll strips! 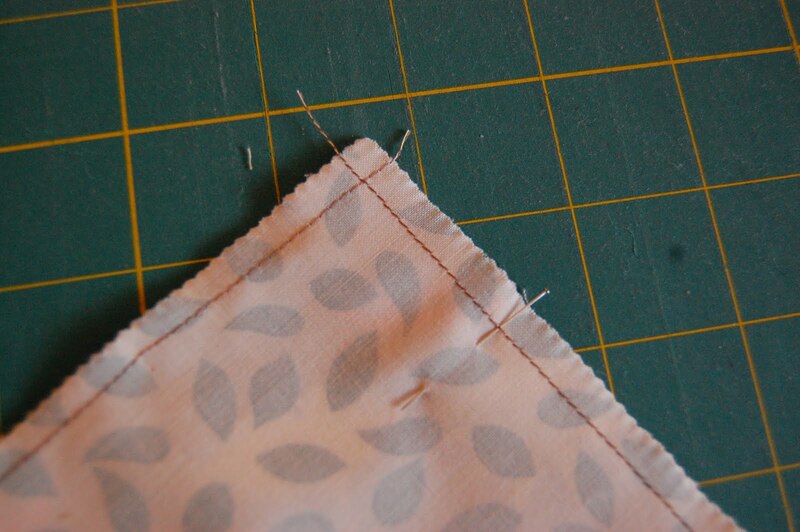 Argh, it was one of those ‘Why do I sew?’ moments. 4. 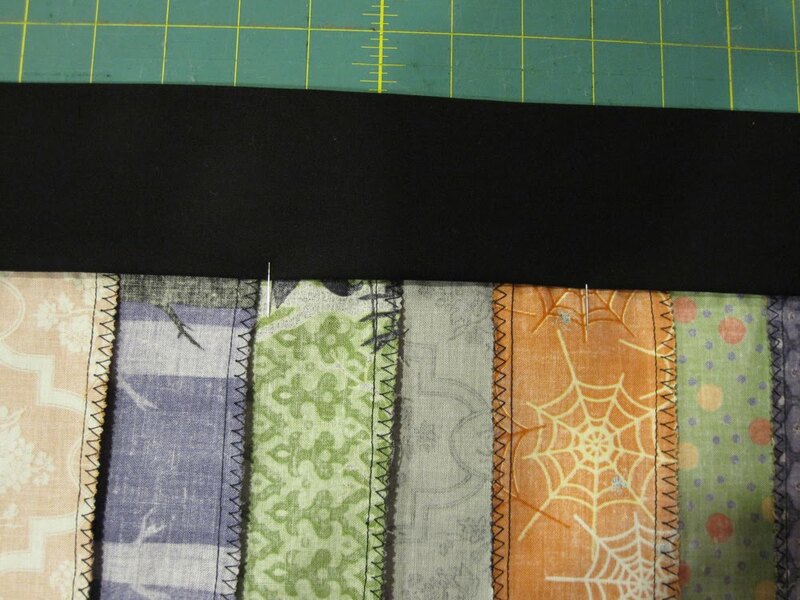 Sew together the jelly roll strips adding a 1.75″ black strip on the top and bottom. 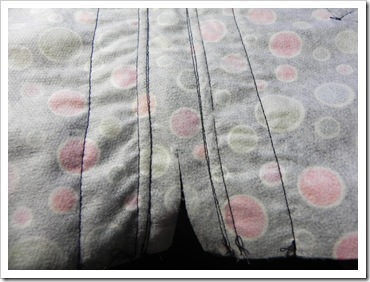 Press seams open. 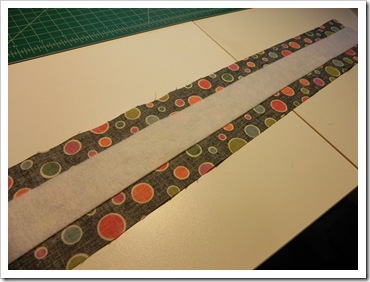 Even up the ends of jelly roll strips so the panel is 20″ long. 5. 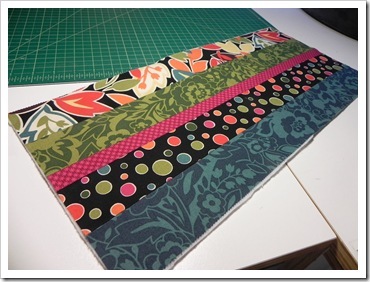 Cut the panel into (4) 15″ x 5″ strips. 6. 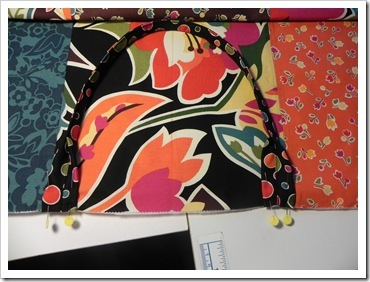 With RST, sew a 15″ x 5″ strip on both sides of a 15″ x 7″ piece. 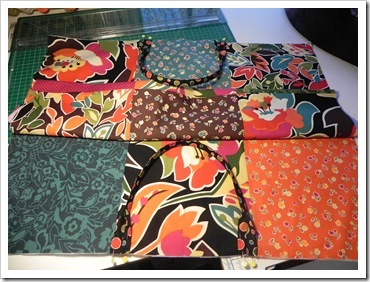 Press seams open. 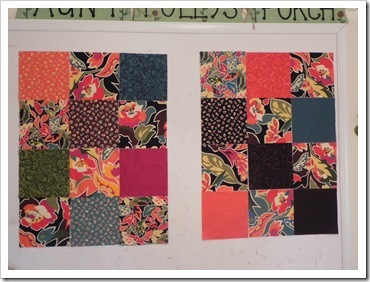 Repeat again to make an identical wall hanging. 7. 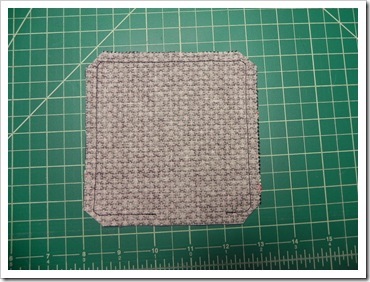 Place one of the pieces of ricrac across the 5″ edge of one 5″ x 5.5″ rectangle. 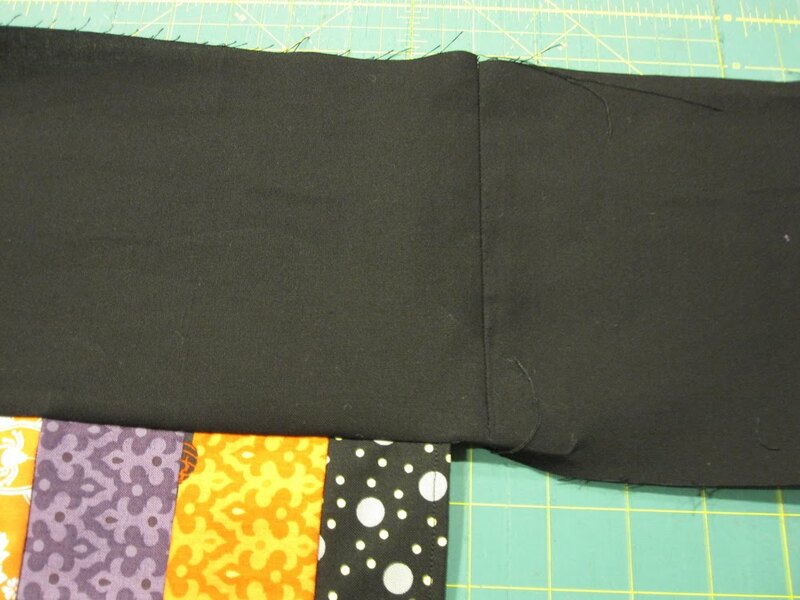 Place the ricrac so the dip in the top wave is just about even with the top edge of fabric. 8. 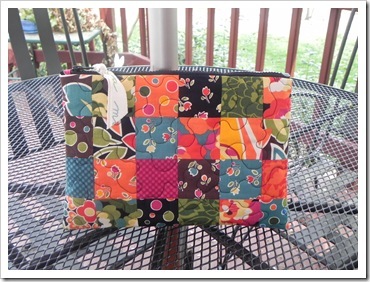 Place a 5″ x 5.25″ rectangle on top, RST. 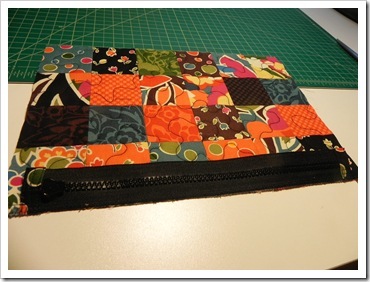 Line up the top edges of both rectangles and pin together. Sew in place. Repeat for the opposite end of the rectangle. 9. 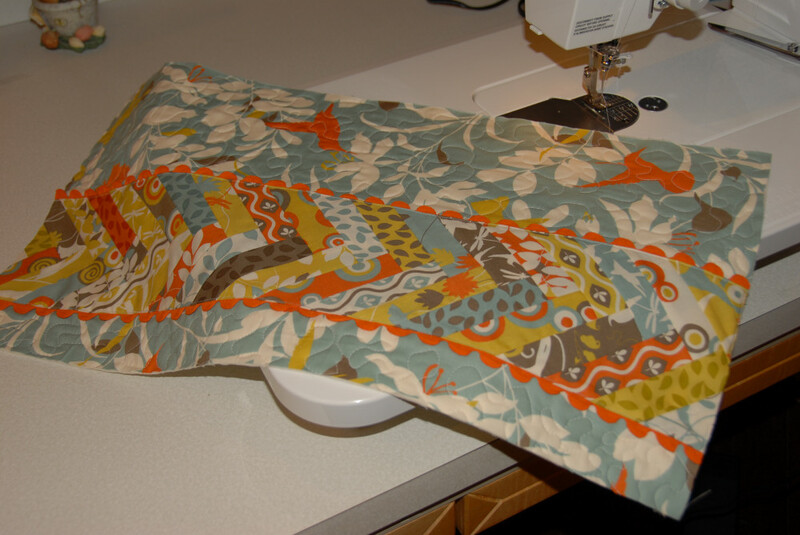 Press seams open. Top stitch the ricrac in place. 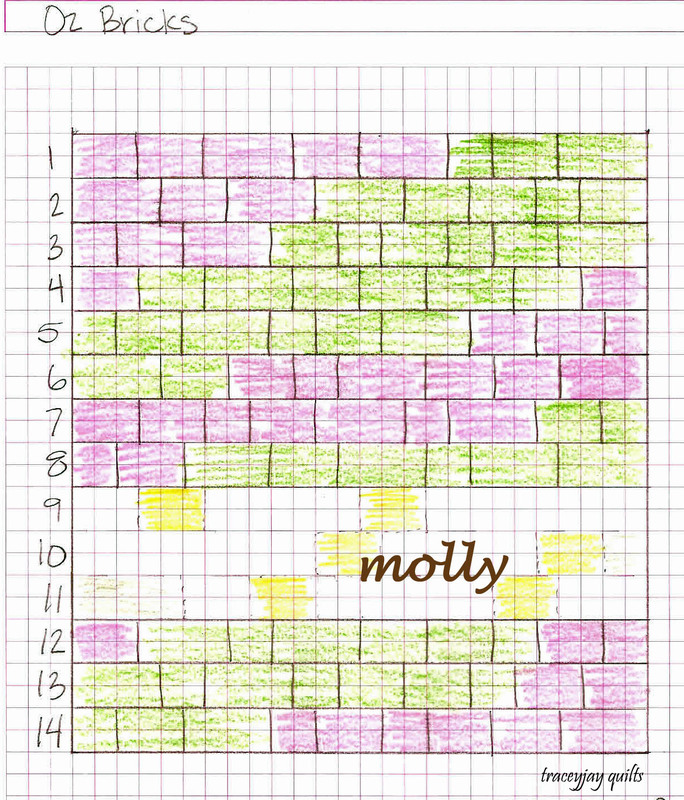 Repeat steps 8 and 9 for the remaining rectangles. 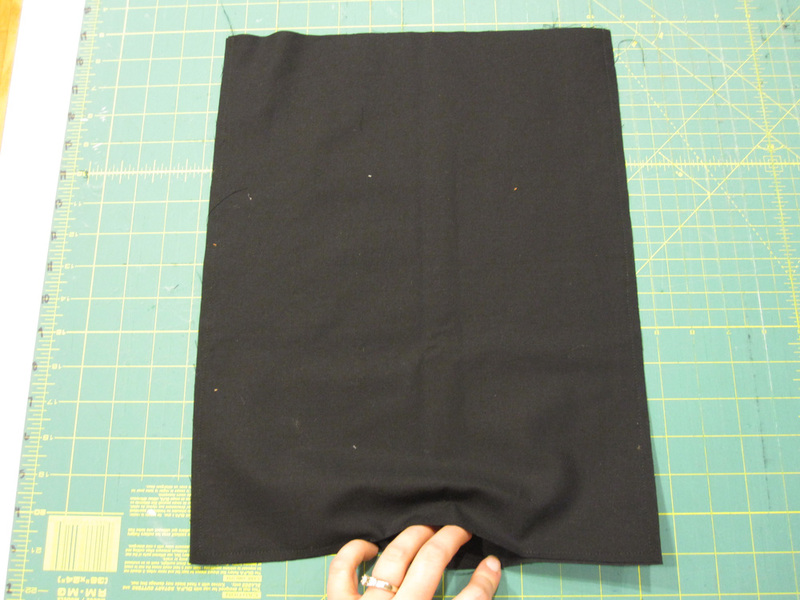 Sew both pieces to the sides of the remaining 15″ x 7″ black piece like in step 6. 10. 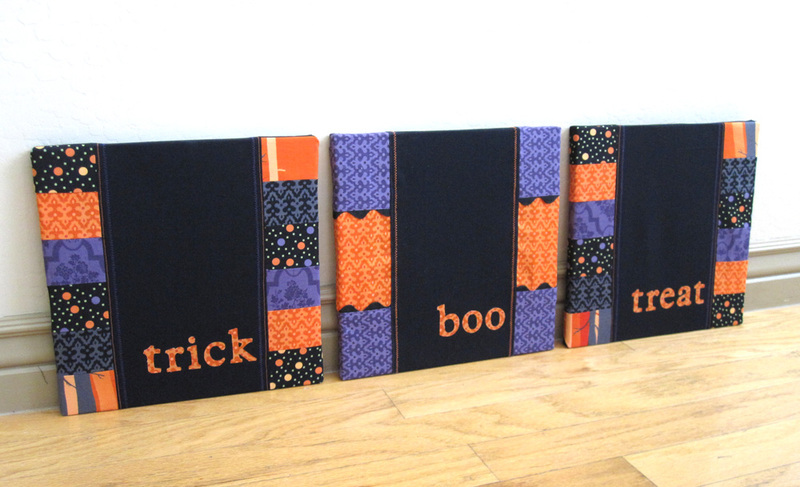 Trace the words ‘boo’, ‘trick’, and ‘treat’ onto iron-on fusible webbing. 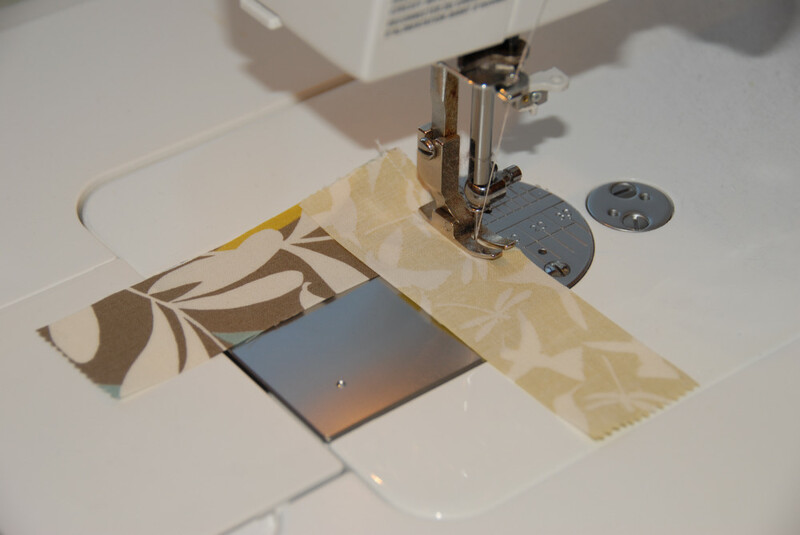 Follow the directions for adhering to fabric for your brand of fusible webbing. 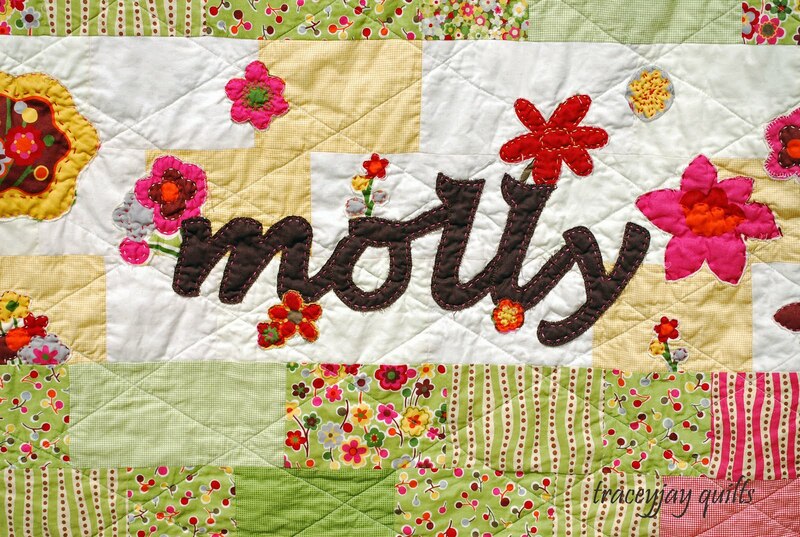 Cut out letters. Templates for words are included in the Printer Friendly PDF at the bottom of the post. 12. 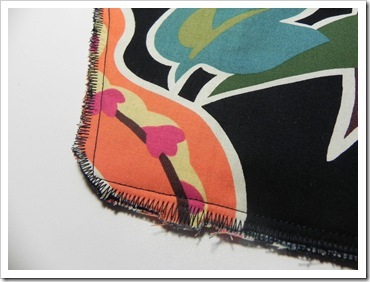 To help stretch each panel evenly, stitch around each panel about 1/4″ away from the edge. 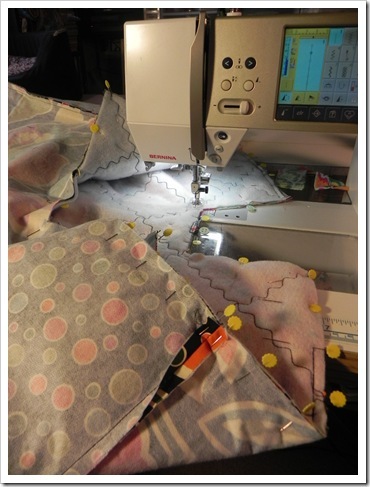 Trim away threads and ricrac ends. 10. 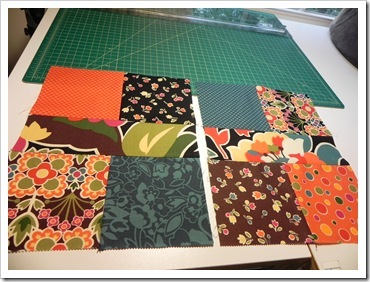 Cut both 6 foot long 1″ x 2″s every 10.5″ with a hand saw or table/circular saw. Arrange as shown below. Repeat for other two frames. 11. 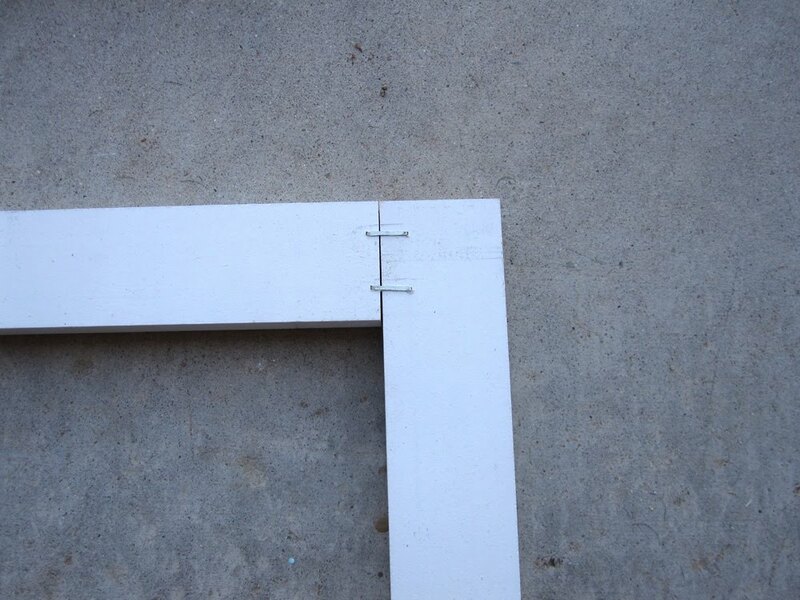 Secure in place with two staples at each joint. 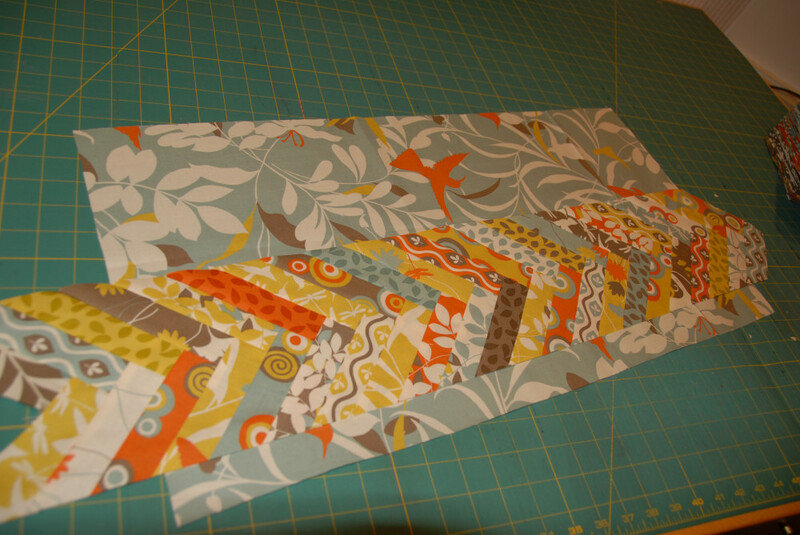 Flip frame over and staple from the other side at each joint. Repeat for the other two frames. 12. 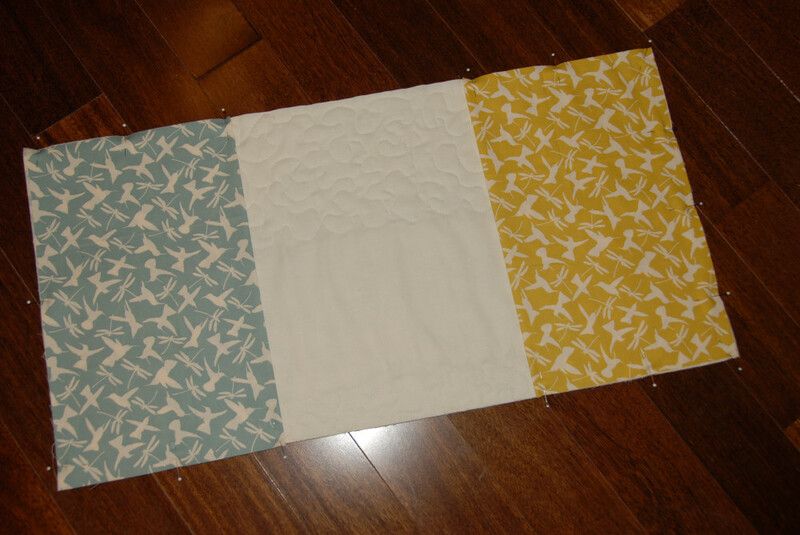 Place one of the wall hangings right side down. 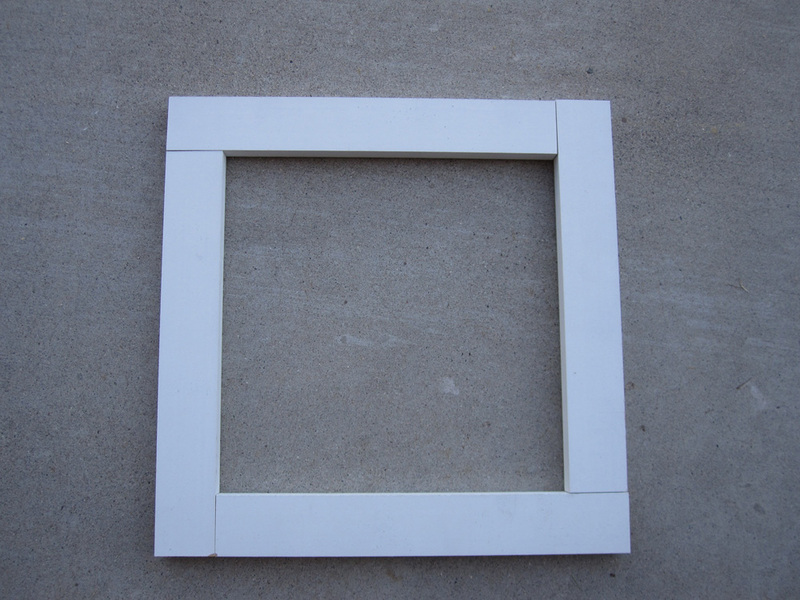 Place the blunt side of the frame on top of the panel. 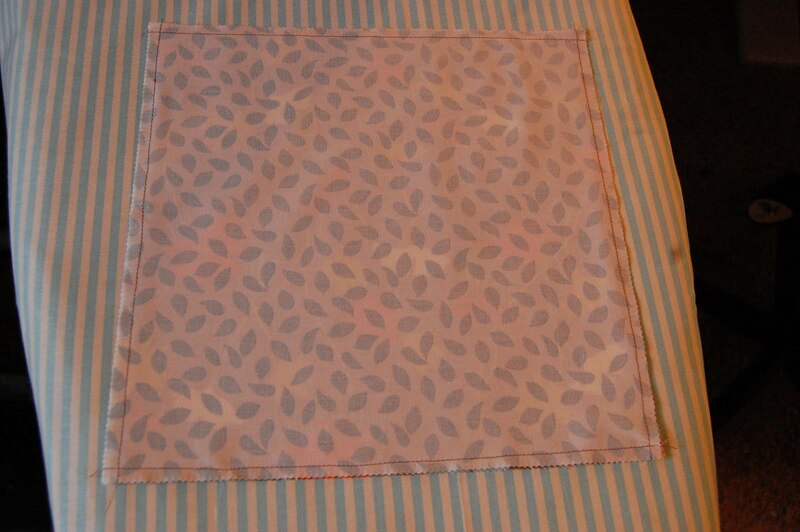 (The rounded edge should be facing up.) 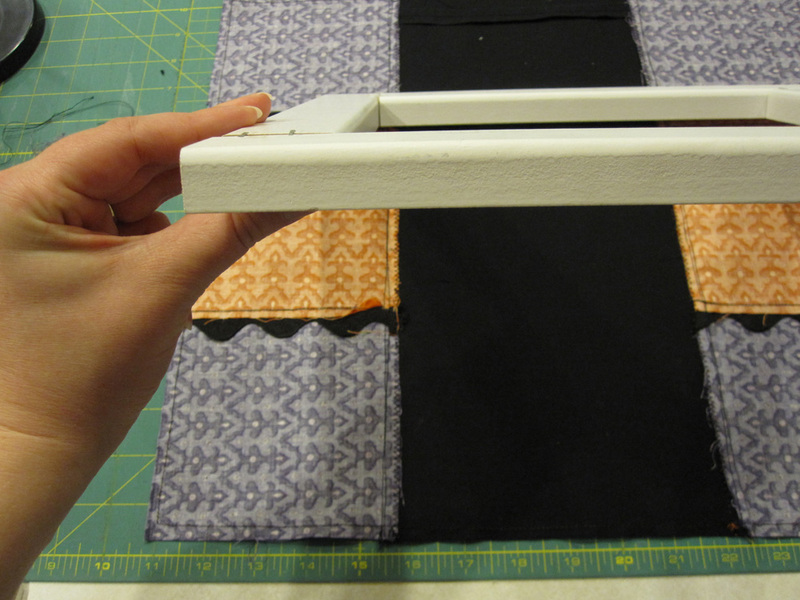 Center the frame 1.5″ from the top and bottom and 2.25″ from each side. 14. 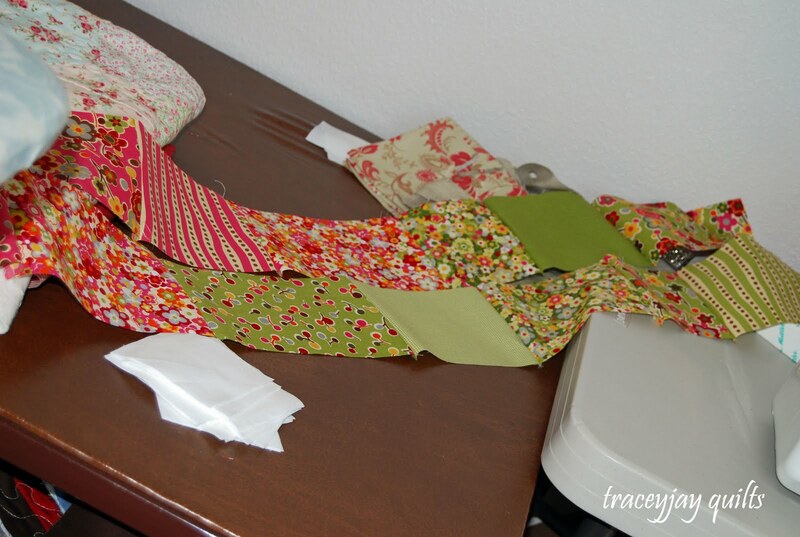 Fold the side pieces as shown below. Secure with a staple. 15. 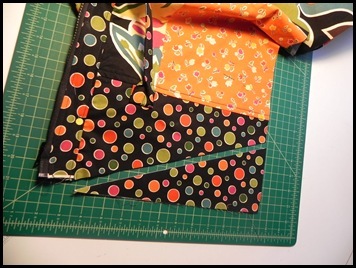 Finish folding up the sides like you are wrapping a present. Secure with staples. 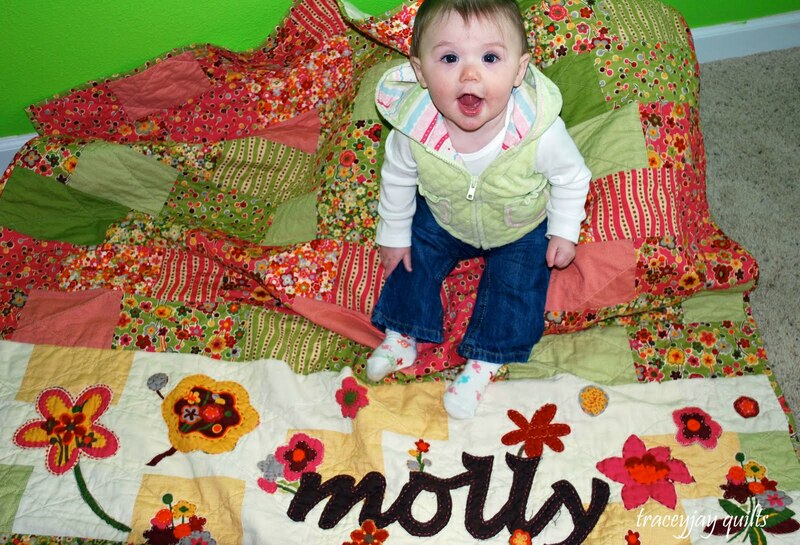 Repeat for other wall hangings. 4. Sew strips RST. 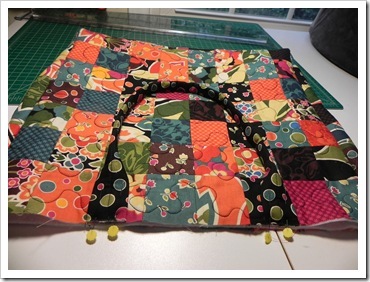 Press seams open. 5. 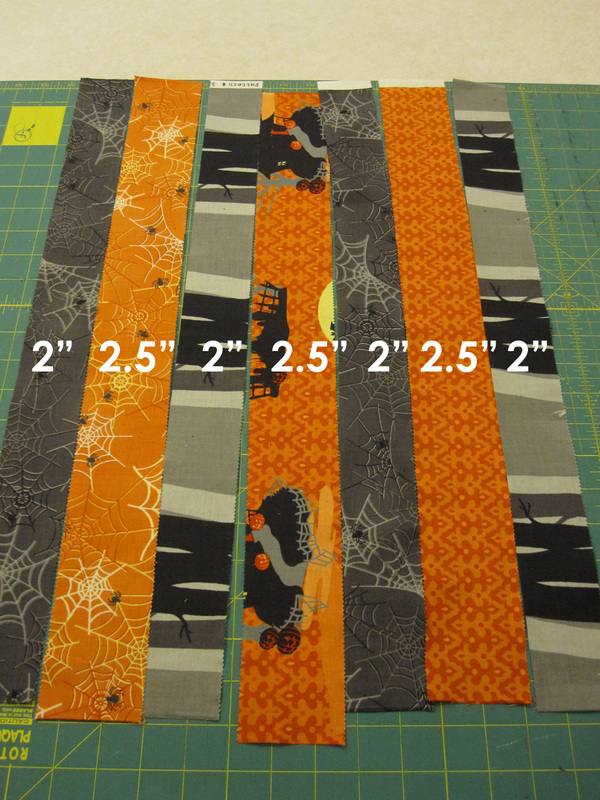 Even up the panel so it measures 21″ long. 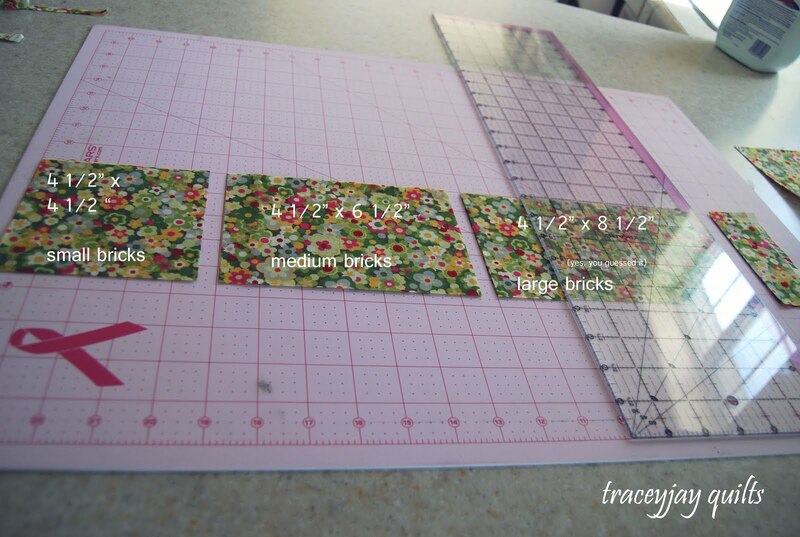 Then cut into (2) 10.5″ pieces. 6. 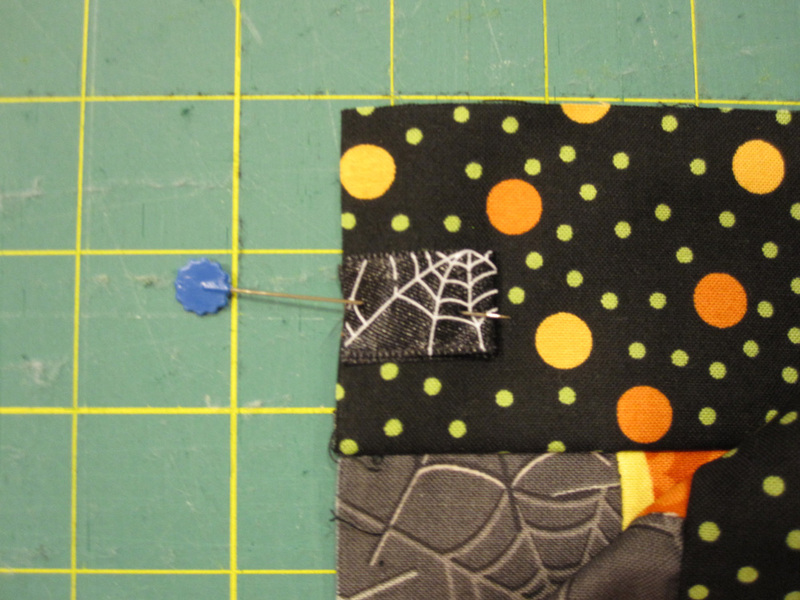 Take one of the 4″ x 12.25″ pieces and pin to the bottom of one panel. 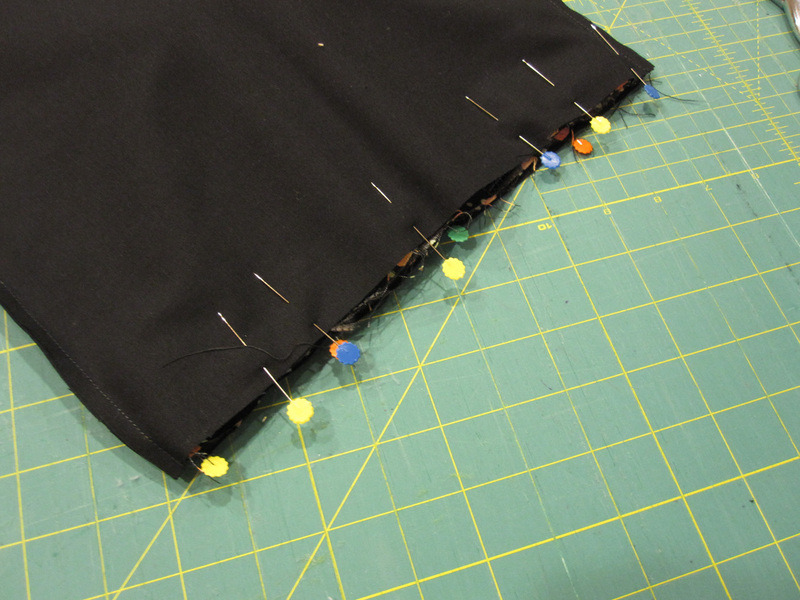 Sew RST along the bottom edge. 7. 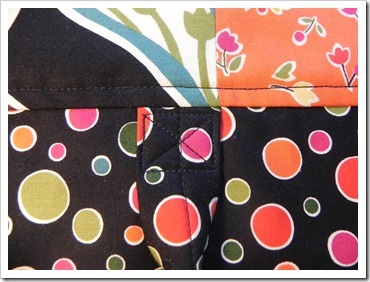 Repeat with the 2.5″ x 12.25″ piece and sew RST along the top edge. 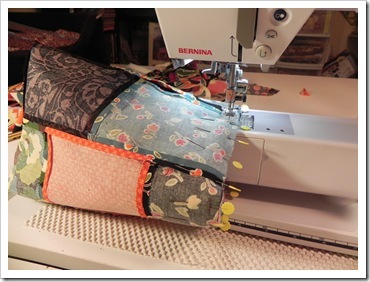 Press seams open. 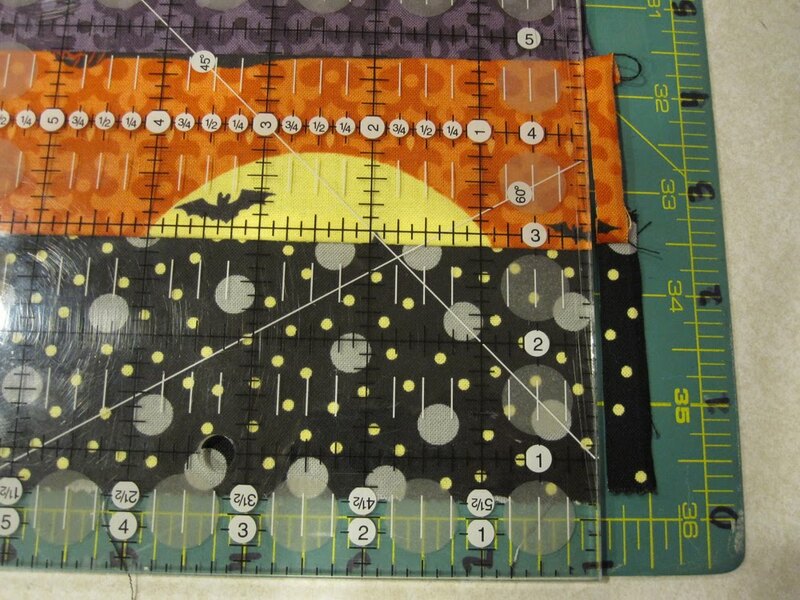 Repeat steps 6 and 7 for the other panel. 8. 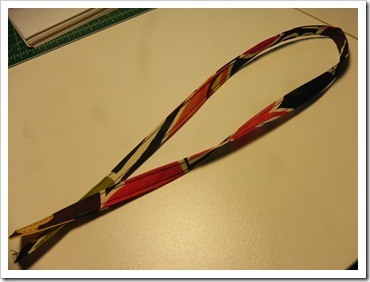 If desired, cut a 3″ piece of ribbon for a ‘tag’. 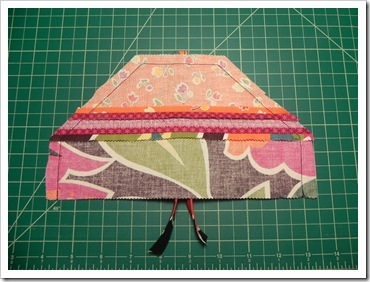 Fold in half and pin in place about 1″ from the top edge on one of the panels. 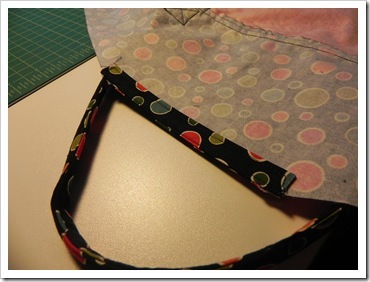 Match up the raw edges of the ribbon with the raw edges of the bag. 9. 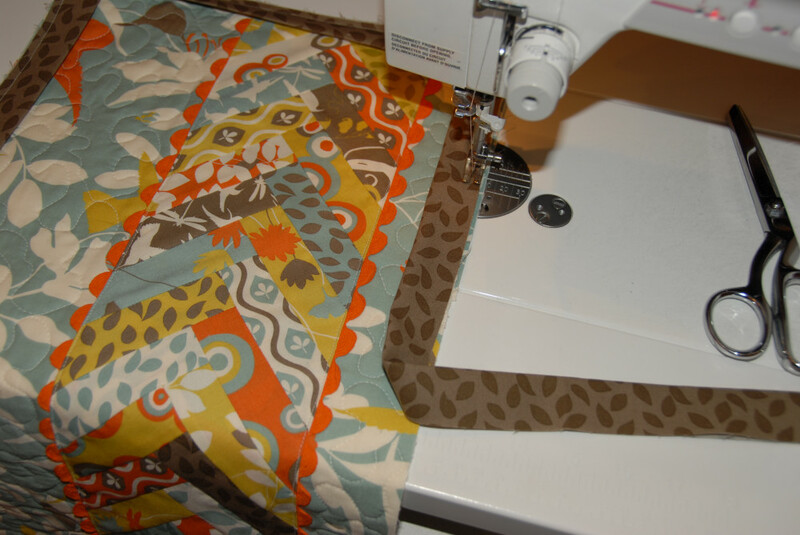 Pin both panels RST and sew. Leave the top open. 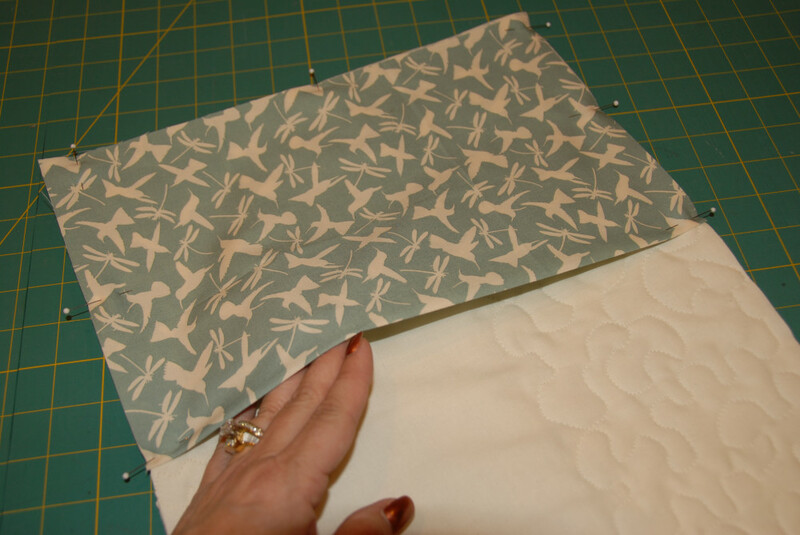 Press seams and clip the bottom corners. Turn right side out. 10. 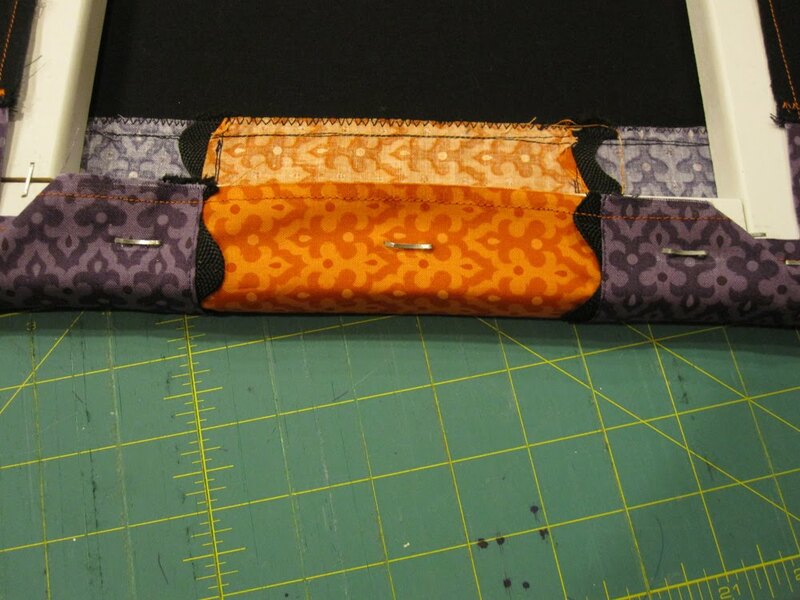 Pin handles in place 3.25″ from the side of the bag. Repeat for other side. 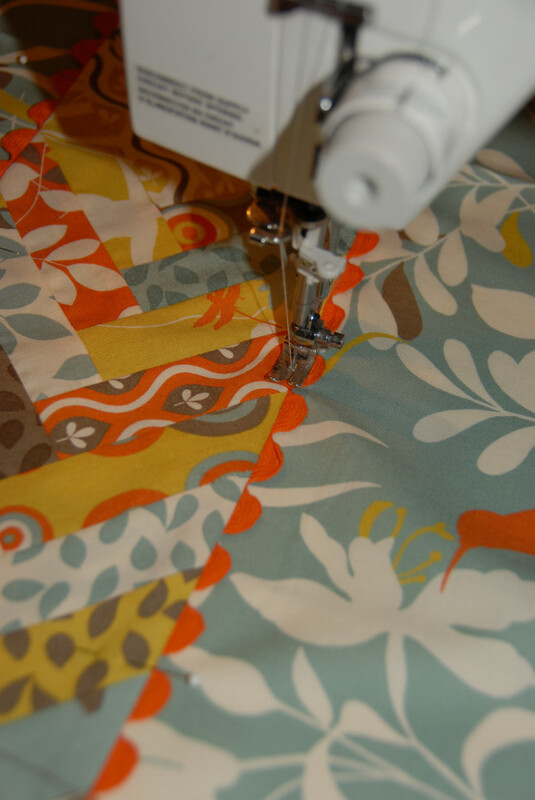 Baste handles in place using a long machine stitch about 1/8″ away from the top edge. 11. 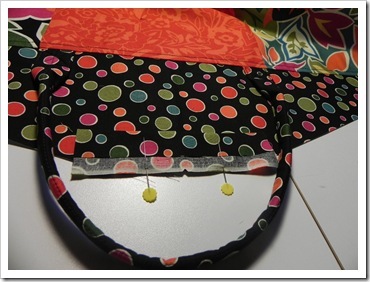 Pin the two lining pieces RST and sew together. 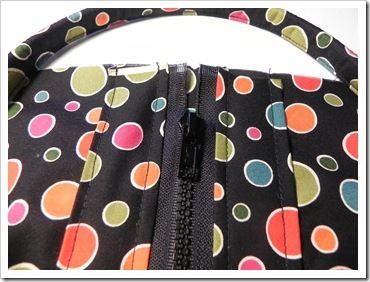 Leave the top open and a 6″ opening at the bottom of the bag. 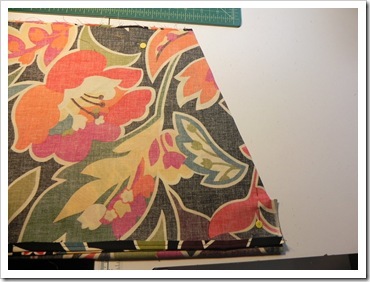 Press seams and clip corners. 12. 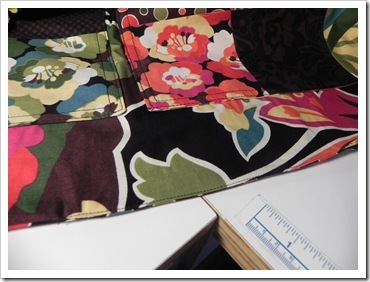 Place the outer bag inside the lining, RST. 13. 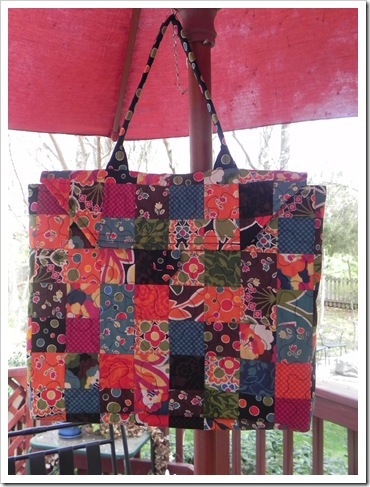 Pin the two bags together and sew the two bags together. Do not leave an opening. 14. 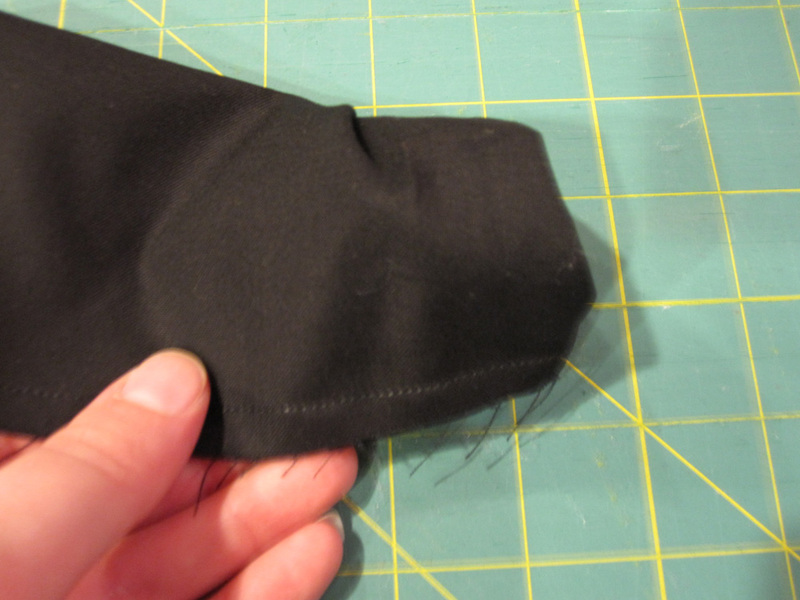 From the opening in the bottom of the lining, turn the bag right side out. 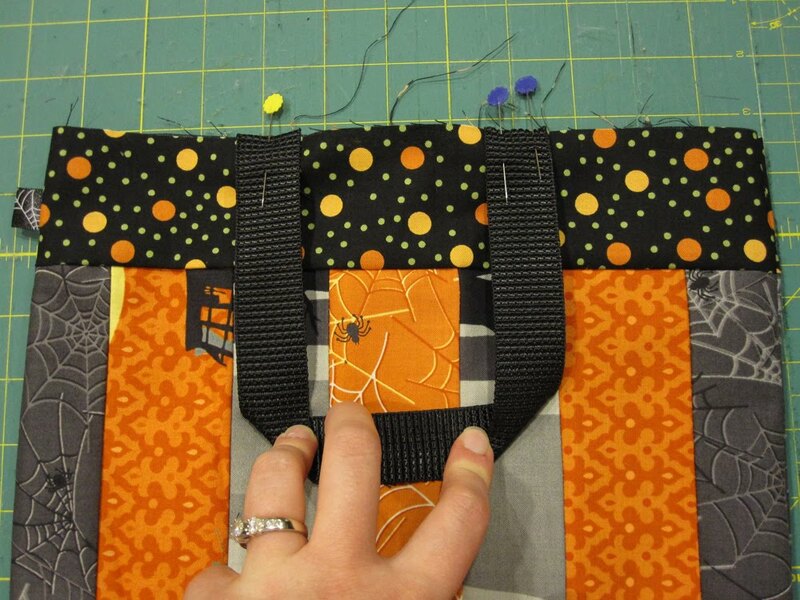 Press along the top edge of the bag making sure the lining isn’t peeking out. 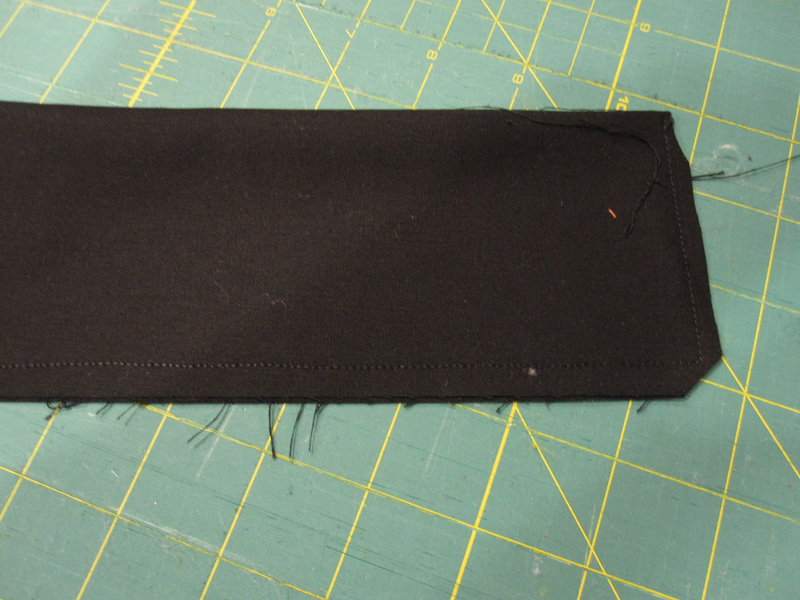 Top stitch about 1/8″ from the top edge of the bag. 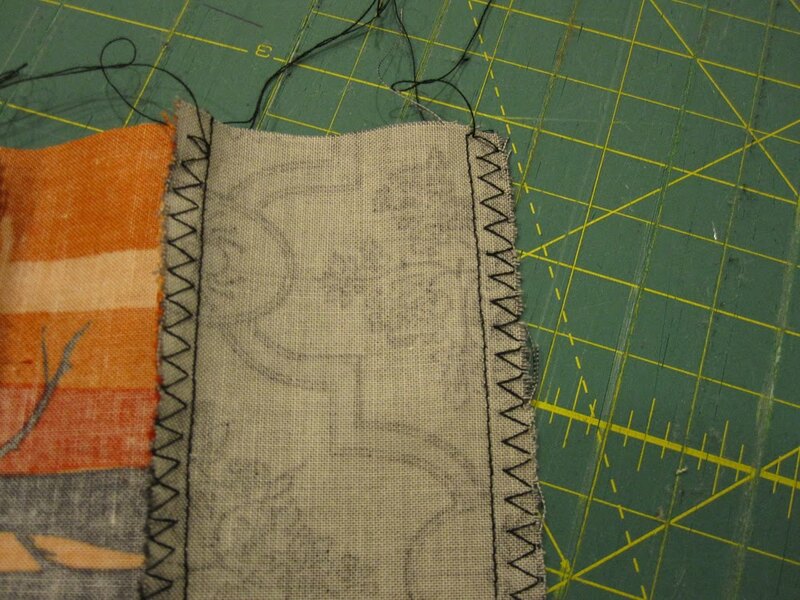 Tuck the raw edges in the raw edges of the opening in the lining and press. 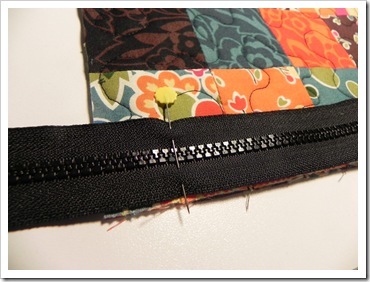 Sew the opening close. 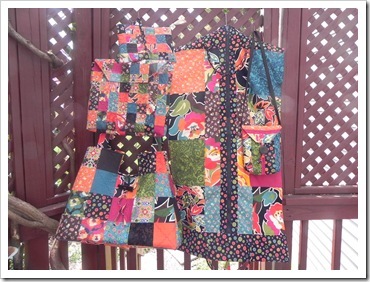 Note: The finished size of this apron is 26″ wide x 21″ long. 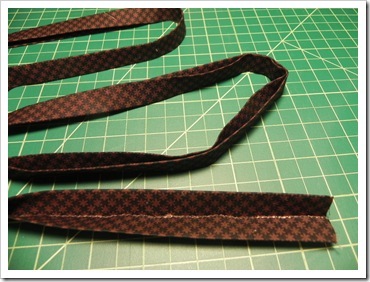 The ties measure 37″ long on either side. 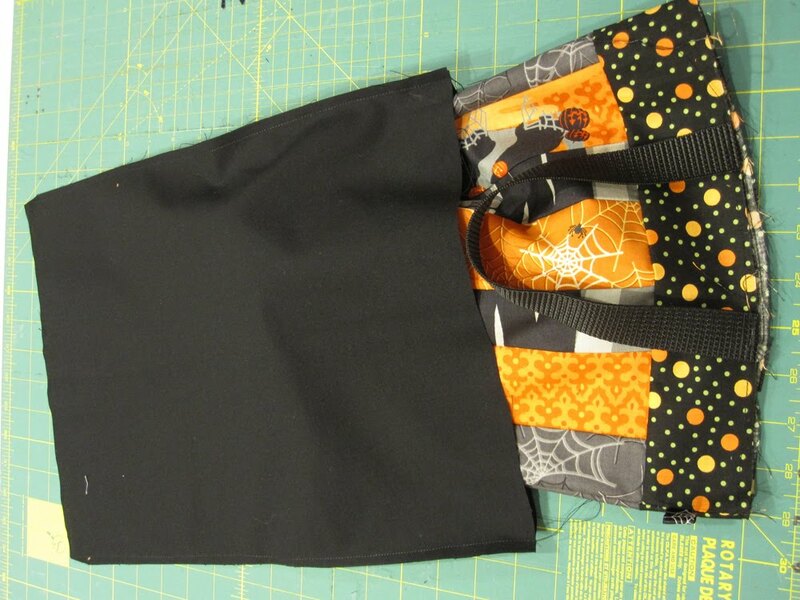 To add/subtract width to the apron just add/remove jelly strip halves. 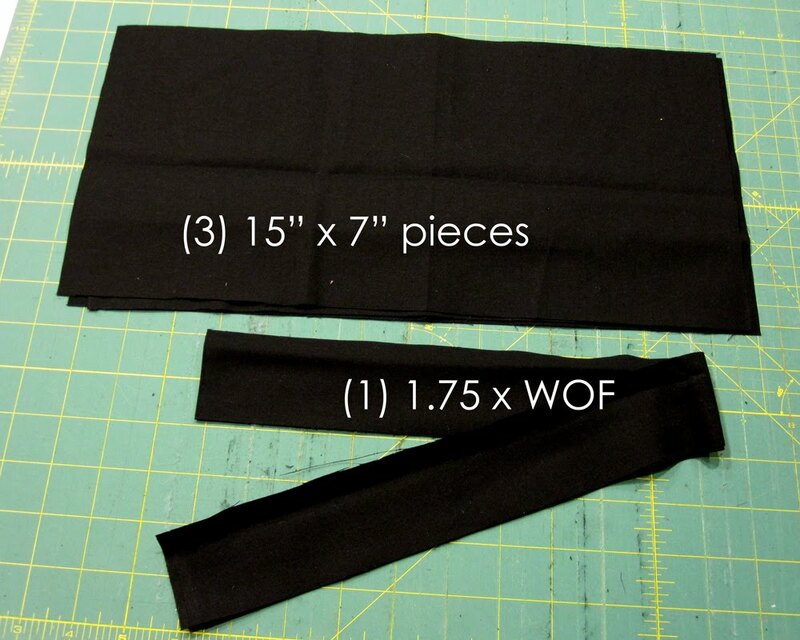 For each strip added/removed, you will add/reduce 2″ to the width of the apron. 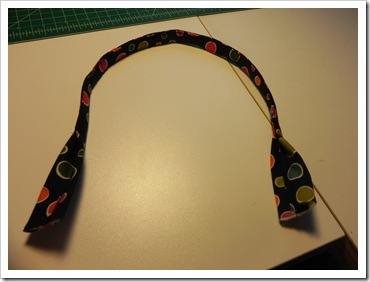 The length is also adjustable. 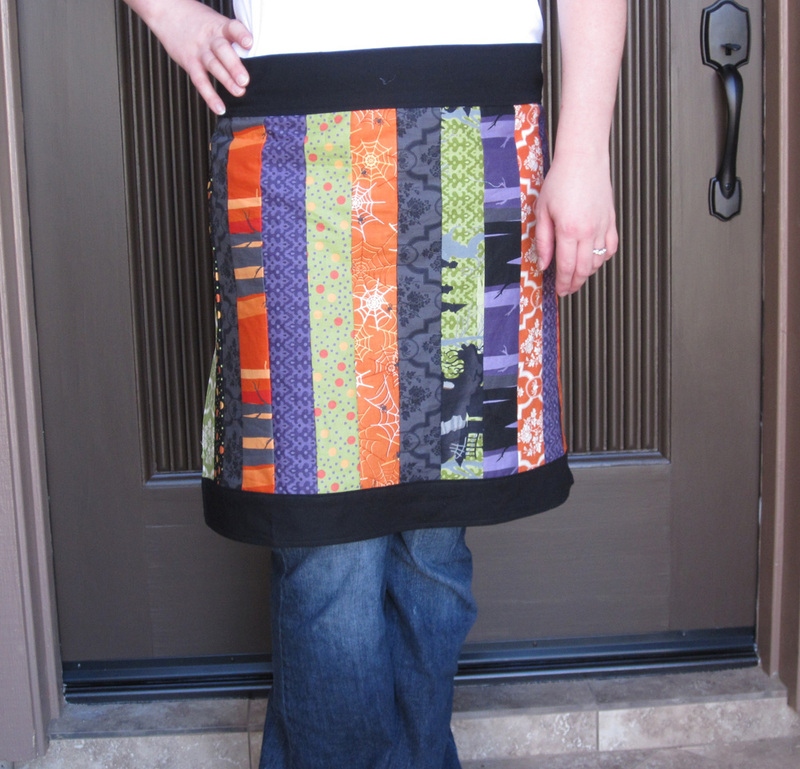 I am 5’10” and the apron comes to just above my knee and ties generously around me. 2. 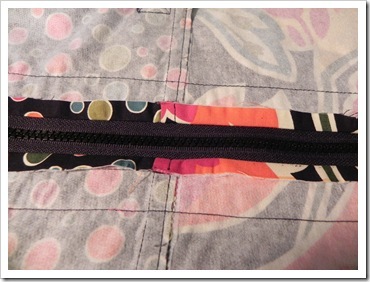 Sew the jelly roll strips together in pairs lining up the selvages at the top.Press seams open. 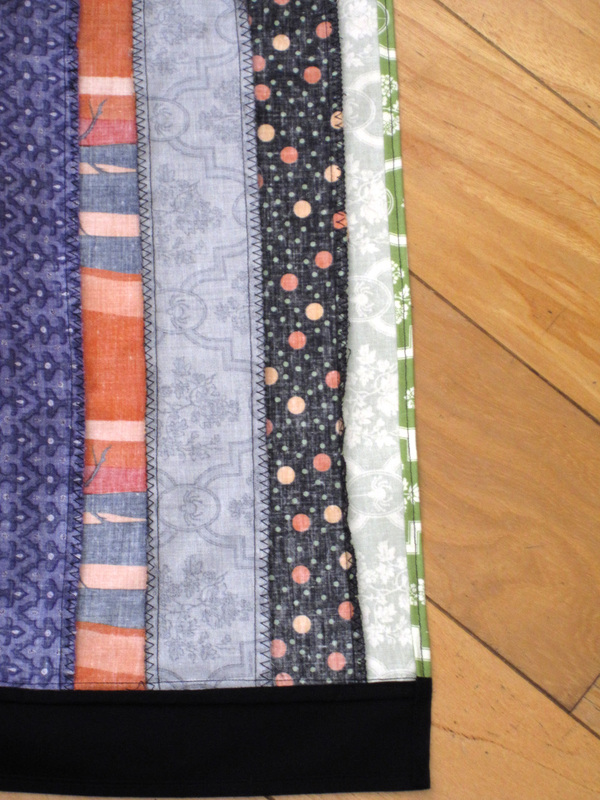 Then join all the pairs together.Press seams open. 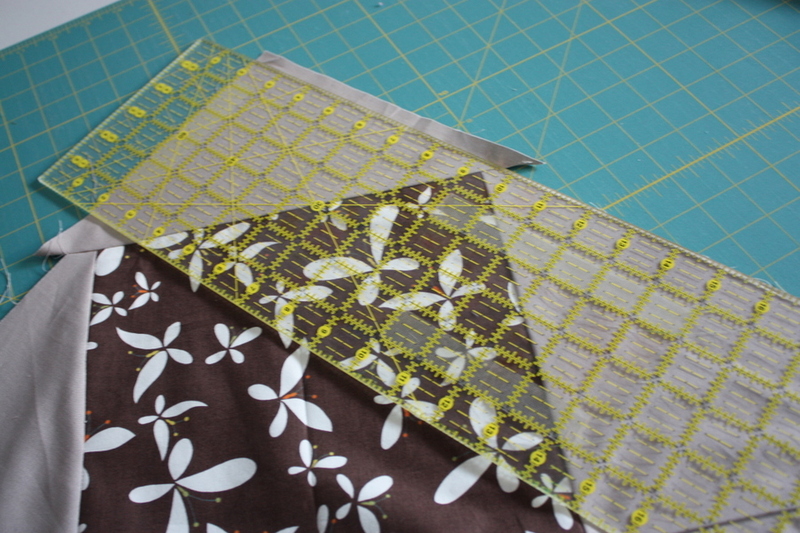 The cut edges will be slightly uneven and all at the opposite end. (See second picture in this step.) 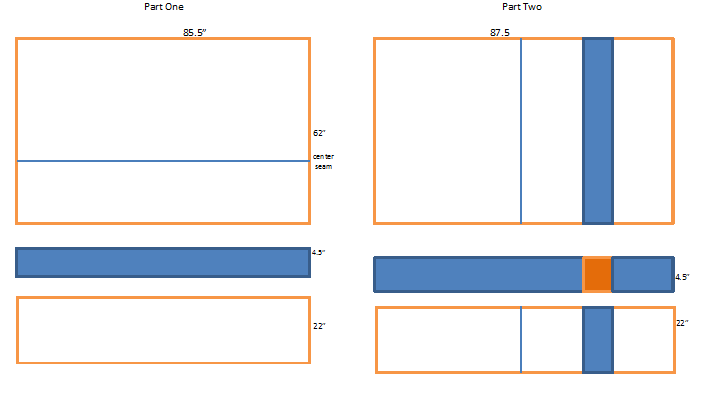 The panel should measure 27″ wide. 3. 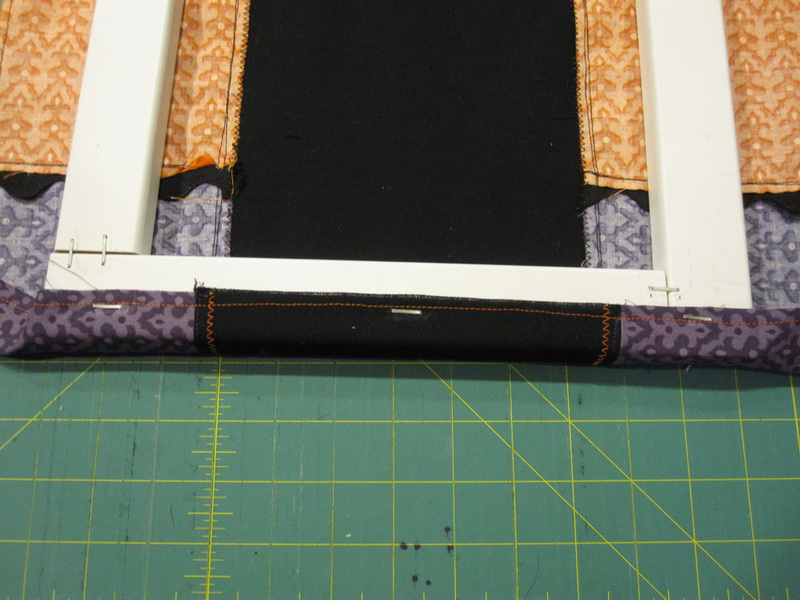 Even up the panel and trim to 17″ long. *Note: You can cut the panel to any length. The bands/hems will add about an additional 4″ to the apron. 5. 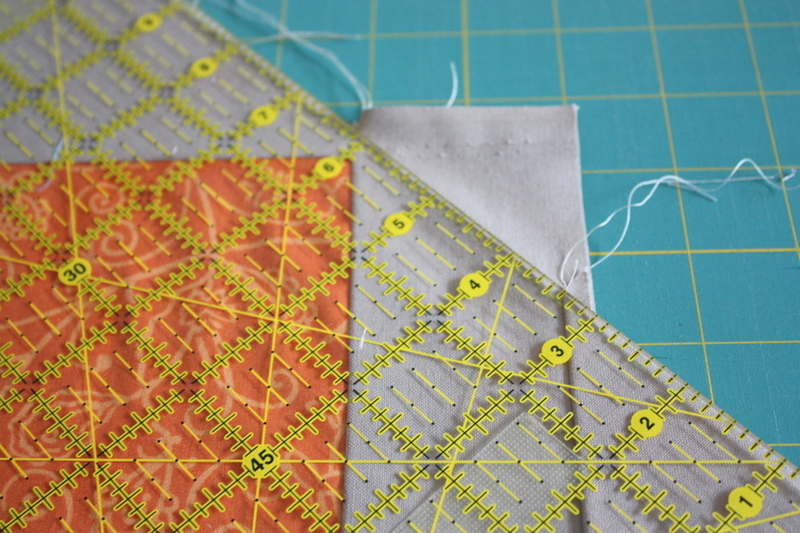 You will want to finish the raw edges. 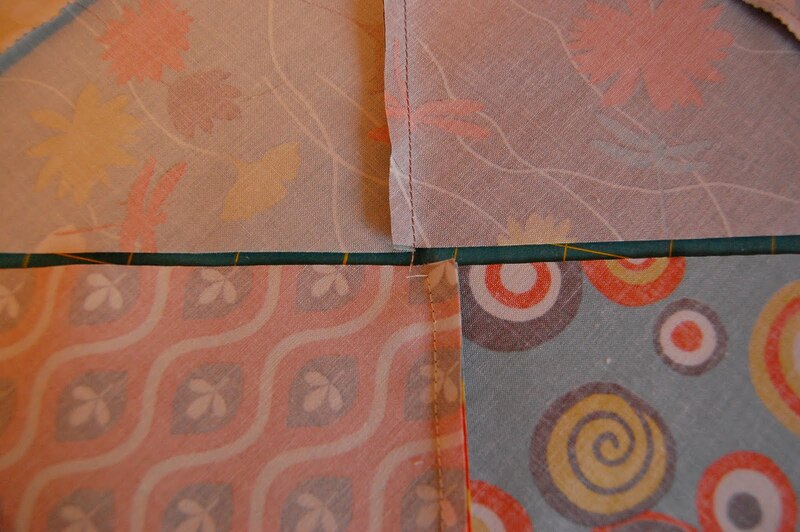 Either serge or zigzag each seam of the panel. 6. 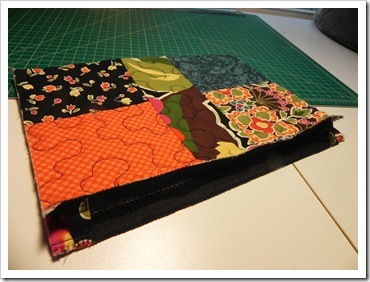 Along the long edge of the 4″ x 27″ bottom band, fold under 1/4″ and press. 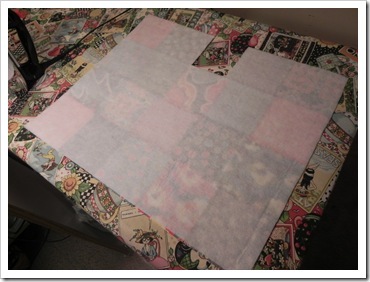 Then fold under another 1/4″ and press again. 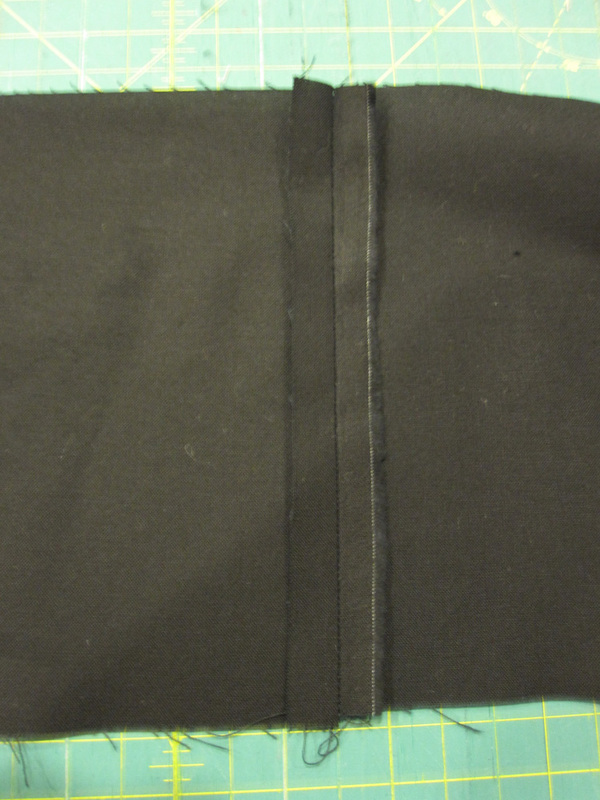 Sew hem in place 1/8″ from the edge. 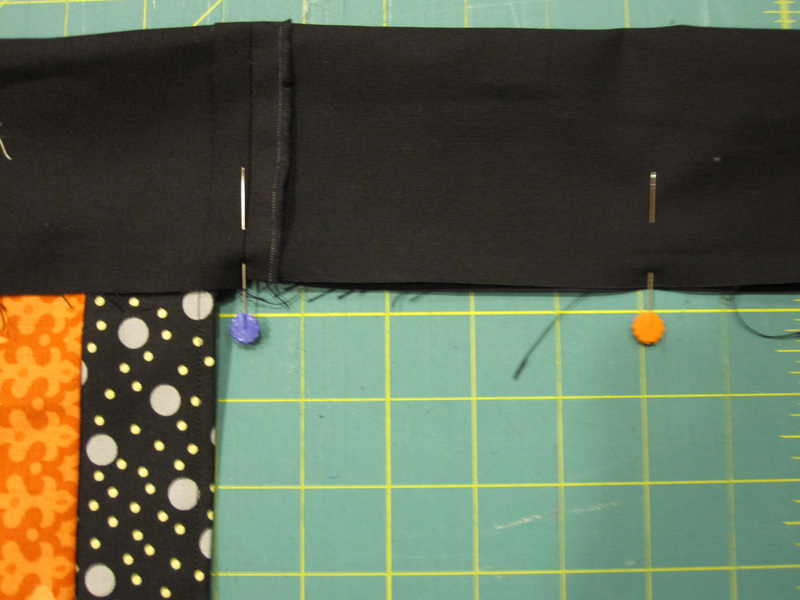 Pin the raw edge of the bottom band and the bottom raw edge of the apron RST together and sew in place. 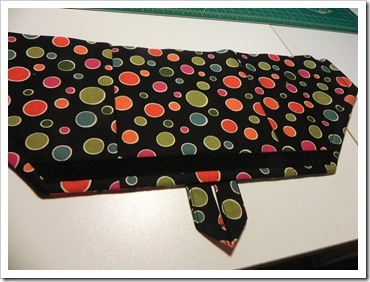 Zigzag or serge to finish the seam. 7. 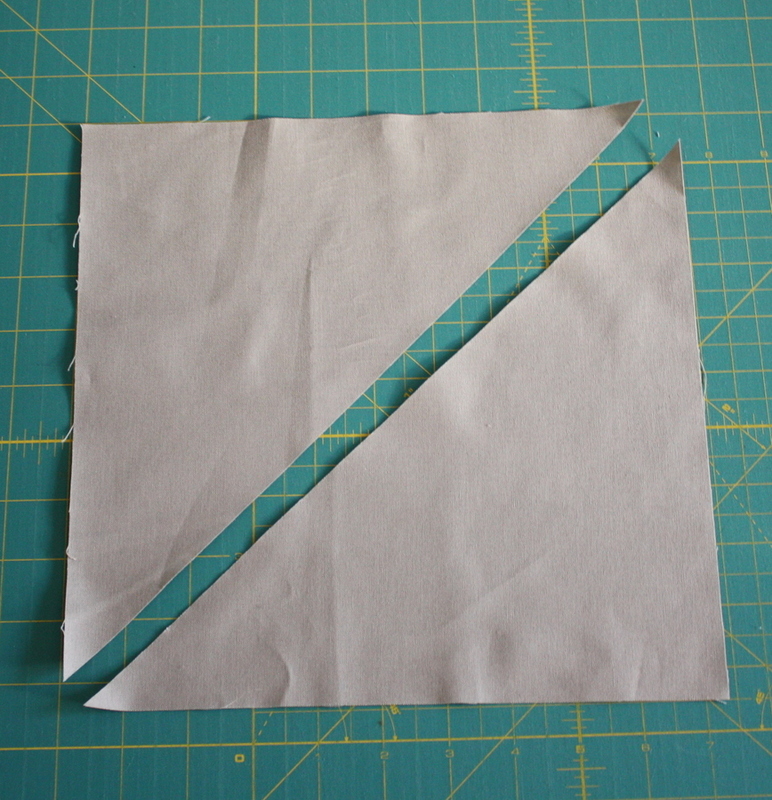 Fold the side raw edges under 1/4″ and press. (From the top to the bottom band.) 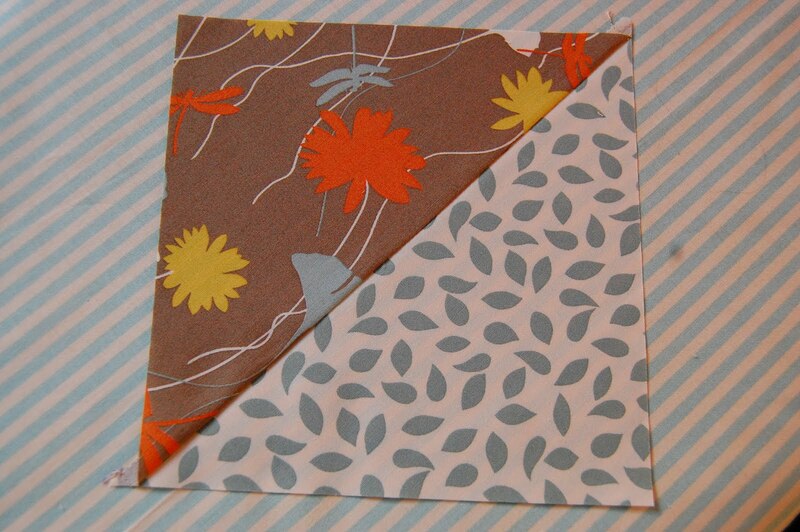 Then fold under another 1/4″ and press again. 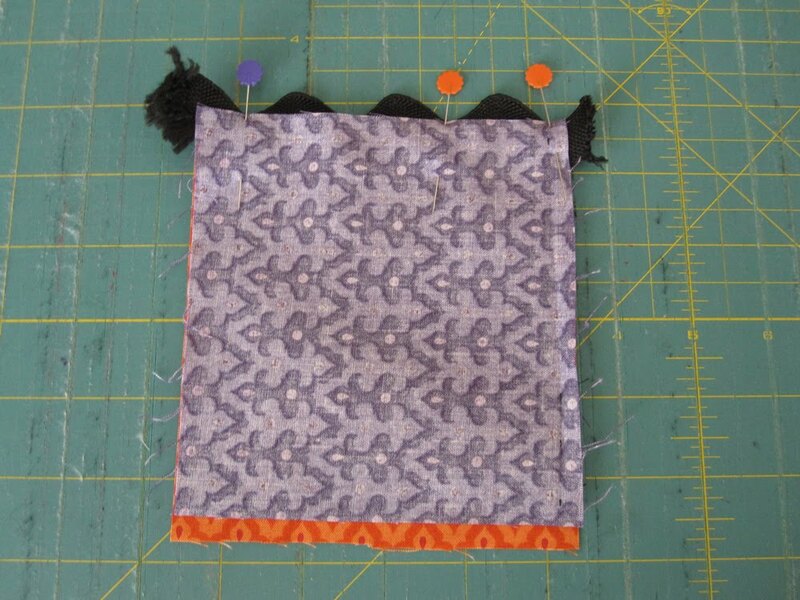 Sew in place 1/8″ from the edge. 8. 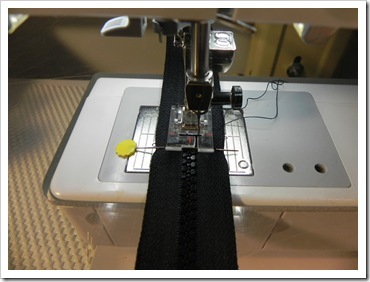 Sew the ties and top band together RST. (The top band needs to be in the middle and a tie on either side.) It will be WAYYYY long. 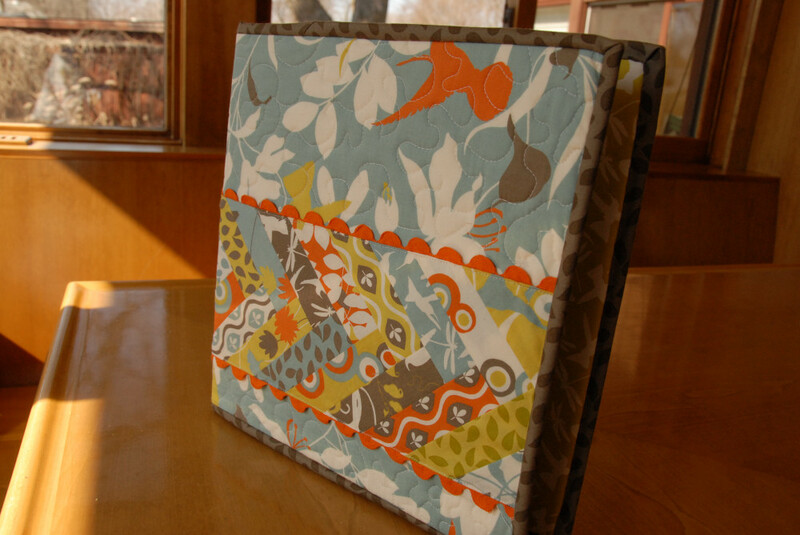 Press seams open. 7. 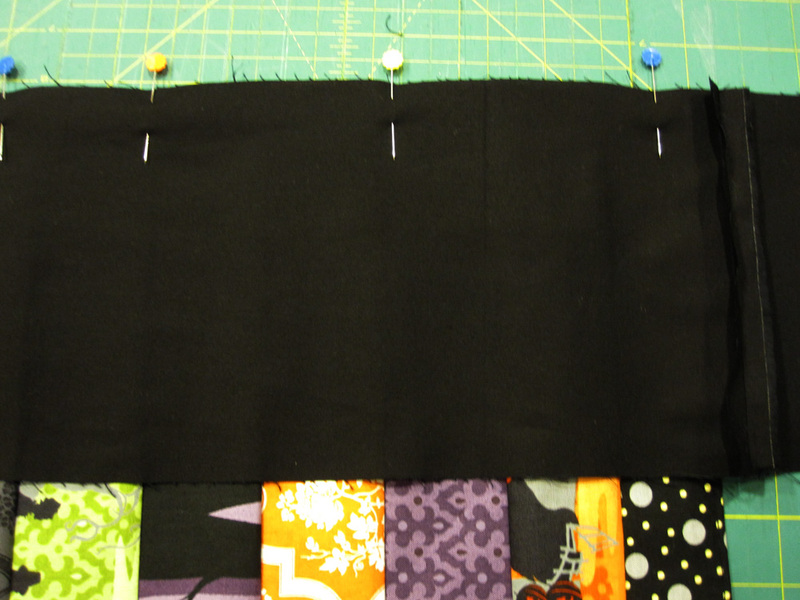 Center the WAYYY long band/ties over the apron panel RST and pin. 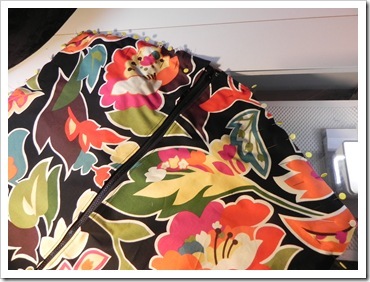 The seams should be on either side of the apron panel. 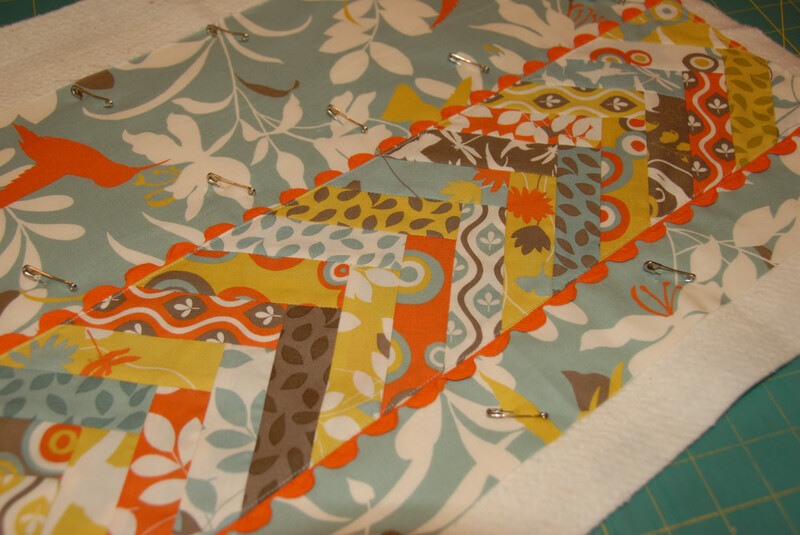 Sew only to the apron panel. 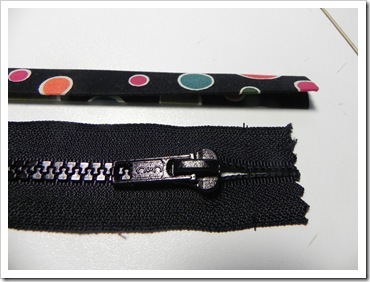 Do not sew onto the free hanging ties. 8. 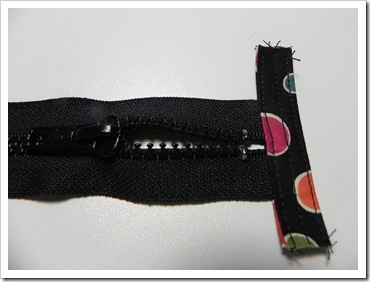 Press the seam and place the band/ties up as shown below. 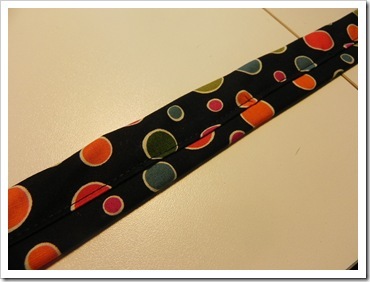 You should now see the right side of the band/ties. Press well. 9. 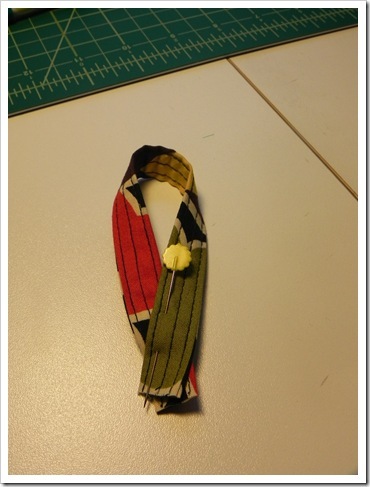 Now fold the band/ties down, RST so the raw edges of the free hanging ties meet. 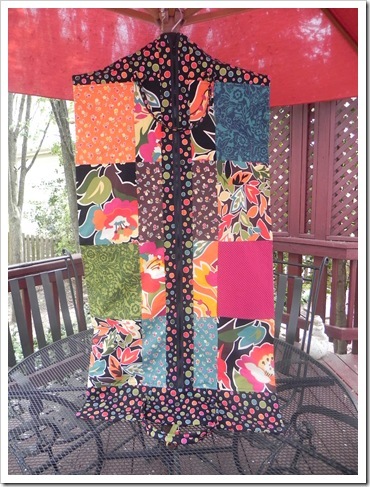 Pin the free hanging ties as shown below. 10. 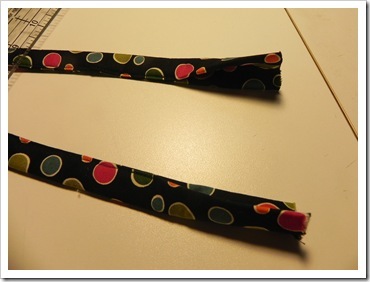 Start sewing at the end of one tie and continue sewing. 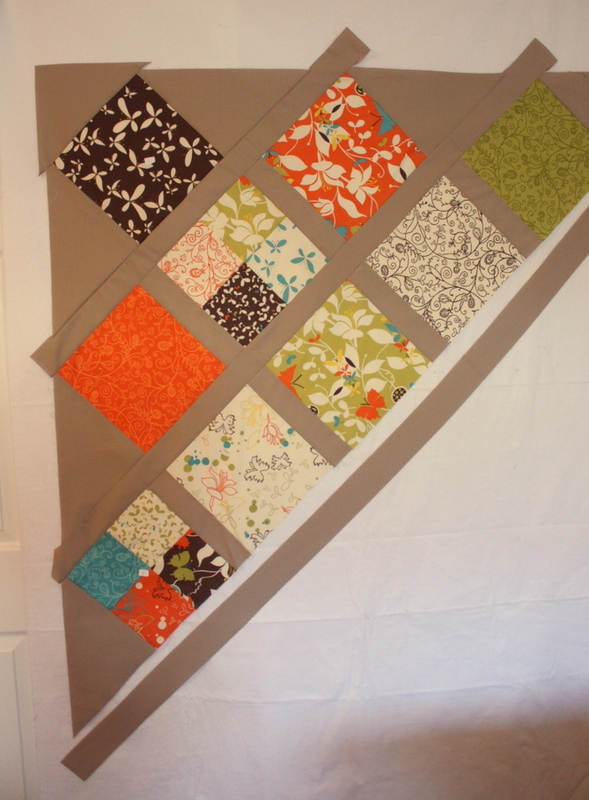 Stop when you get to the apron panel. 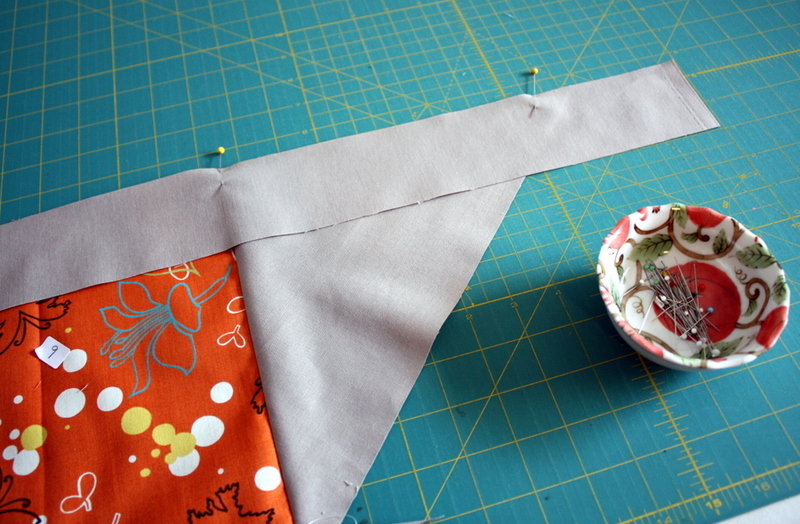 Skip over the apron panel and continue sewing the other tie together. 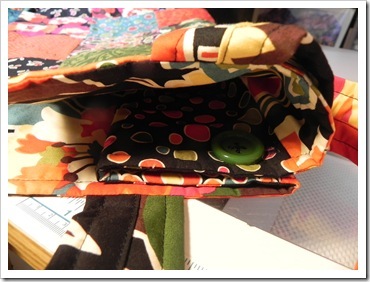 Clip corners at the ends. Press. 11. Turn the ties right side out. Push the end back through the tie with a wooden spoon. 12. 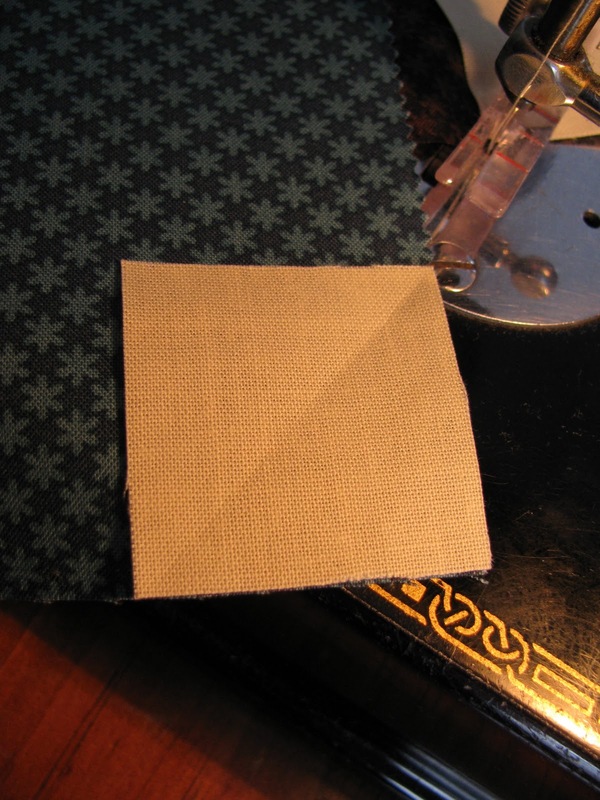 Tuck the raw edge of the band/tie to the inside and press. 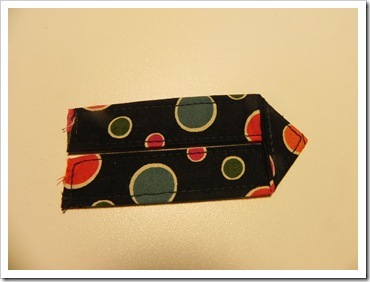 Pin in place from the front, being sure to catch the back of the band with your pins. 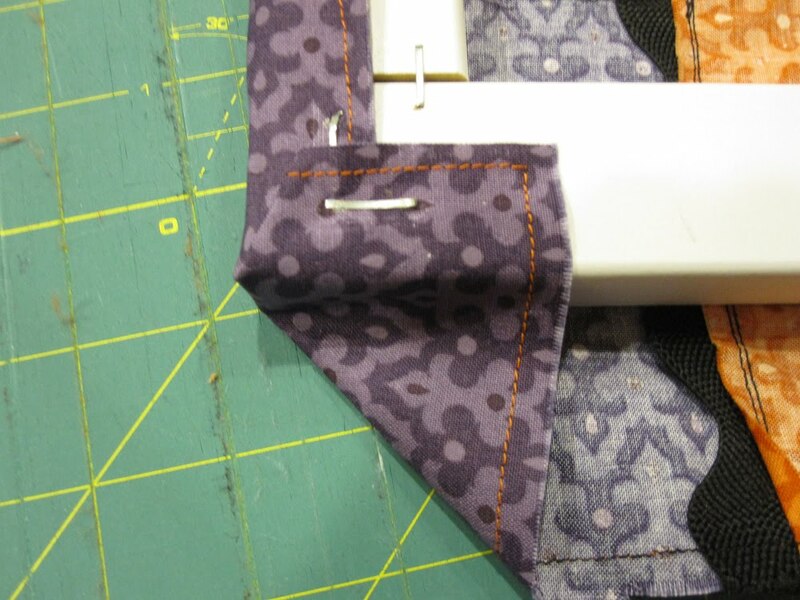 Top stitch 1/4″ from the edge starting at one of the ties continuing onto the apron, closing the opening, and ending at the end of the other tie. Press well when completed.